Whether or not you classify this as “fancy,” it’s only fair here to use a bunker I’ve built after that title question. This is the 13th hole at The Saticoy Club, whose bunkers we re-designed last year with Thad Layton of Arnold Palmer Design Co.
As State of the Union, State of the State, and State of the (insert institution) season has wrapped up and we turn our attention to Spring (and golf season), I thought maybe it would be fun to expound on something marginally less contentious—bunker styles in golf course design. Bunkers are always a hot topic when it comes to golf holes, and really, this makes a good deal of sense. Bunkers, when ferocious enough, can be critical in dictating strategy. This in itself leads to all sorts of chatter, whether it is about how someone made a heroic carry over the deep pit on the corner of the dogleg (or didn’t) or if it is a hearty debate on whether a bunker should be shifted around (or if it should even be there at all). Bunker conditioning is another matter. As golf course maintenance technology continues to advance and the professional game continues to get airtime in crystal clear high definition, many players have come to expect perfect or consistent conditions from bunker to bunker, completely ignoring that this is neither realistic nor in the true spirit of a bunker, which is a hazard (2019 rulebook verbiage be damned). Another key talking point is visual. In a landscape dominated by (often green) turf grass, sand sticks out, further making bunkers a dominant feature of a course. As genetically diverse human beings, we are predisposed to our own tastes for how things should look, and this in turn leads to more debates about the visual stylings of different bunkers. This is what I am mainly here today to discuss. Particularly, I have started to see some push-back in recent years about the preponderance of flashy, wavy, “frilly-edged” bunkers. There are probably a few reasons for these complaints, many of which I can understand. Some are about maintenance (too much sand to rake, edges too difficult to maintain), and some are criticisms of poorly executed aesthetic attempts at the look (excessively wiggly edges on a plain landform). Most of all though, the push back seems to be driven by the constant and natural human craving for something different. It is true that a lot of projects in recent years have sought to mimic a certain aesthetic of flashed sand, “naturally” broken lines, and a rough edge. There is no doubt I have often been in that camp myself with recent work. * How did we get here though? It could be said that it started with Sand Hills, whose massive, rugged bunkers played off the natural blowouts on the property and were possibly the first to be built using excavators. It could be traced to Tom Doak and Gil Hanse making a trip to California to study the stylings of Alister MacKenzie and George Thomas before applying it to their work at Black Forest and later Stonewall. Or it could be when Coore & Crenshaw’s Jeff Bradley started doing his best Tom Simpson impersonation at Cuscowilla. Notice something in those last two postulations though: they both mention architects of the past. The true origin of this bunker style, like many great components of design today, comes from the Golden Age, which, going even further back, was inspired by nature itself. With a couple of architects looking back to the past, these flashier and more intricate styles were reintroduced to the present. In the following 20 or so years since, talented and competitive shapers, adaptive excavator buckets, and some great sandy sites have all elevated and diversified the genre, making it a popular choice among designers and developers today. And I have to say, often times it is hard to argue with the style. The visual of the sand provides a nice contrast to the landscape, the rugged texture can enhance the feeling of being in nature, and the lines, when done right, can be beautifully artistic. These are beautiful bunkers often located in beautiful settings. The brilliant bunkering and the way it seamlessly flows from formal edges to scrubby, sandy ground at Gil Hanse’s Ohoopee Match Club is some of the best bunker work I’ve ever seen. Image courtesy of Andy Johnson of thefriedegg.com. But are we overdoing it? If you look at it only within the pool of golf course projects of the last 15 or so years, which have been very lean in numbers compared to those of the past, you could make the argument towards “yes.” If you look at it within the overall pool of all golf courses though, which is vast (and mostly uninspiring), this style does still stand out as interesting and unusual. Because the newest projects get the most attention though (especially in the age of social media), and because there are so few of them, the perception seems to have become that this is the only style of bunkering in golf anymore, which is patently false. It just happens to be the style getting the most attention, rightly or wrongly. With all of that understood, I get the cries for going a different direction and pushing for variety. After all, Donald Ross said, “Variety is the spice of golf, just as it is of life.” Sameness, even excellent sameness, can get kind of boring. That is possibly one reason why the broad, machine-built bunkers came into popularity after the War and preceding Golden Age. That is possibly why Pete Dye’s work later felt like a breath of fresh air in response to that trend with his sharp, funky shapes and railroad ties. And that is likely why Doak and Hanse headed West in the early 90s to build something different and more intricate, inspired by the flashiest work of the 1920s and 30s. So here we are in 2019, and the question becomes, “are we coming full circle once again?” Whether we actually are or aren’t, it is sort of starting to feel that way. 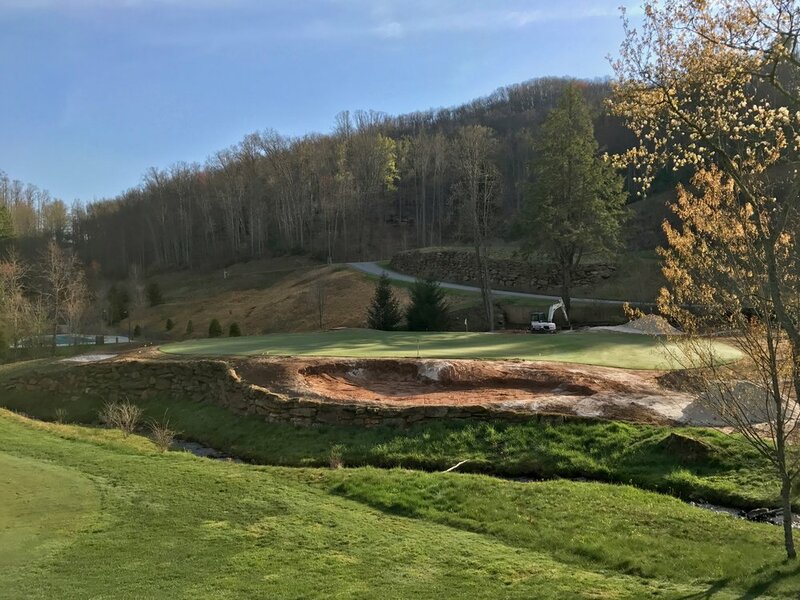 One reason for that feeling could be the number of restoration projects popping up around the Midwest and Northeast, most of which involve revitalizing or returning to a bunkering style that is more grass faced and flat bottomed in nature. There are also a couple of the new projects as well that have scrapped the flashy trend and gone a different direction. Two happen to be in Northern Michigan (an area which ironically is full of naturally sandy soil): Tom Doak’s “The Loop” at Forest Dunes, and Dana Fry and Jason Straka’s South Course at Arcadia Bluffs. Doak, who actively tries to diversify his aesthetics from course-to-course to avoid a typecast effect, went much simpler and a little less “flashed” at The Loop than most of his other work. The biggest reason for this was to keep the focus on the routing and the contours, which are the bread and butter of the course, but there was probably some simple intent just to change it up as well. The bunker scheme at Doak’s “The Loop” is much simpler than a majority of his works, allowing the routing and the contouring to shine. At Arcadia Bluffs, they sought to provide something different, especially for the public-access resort scene. Drawing inspiration from Chicago Golf Club located kitty-corner far across Lake Michigan, they went with a highly angular style in the mold of Seth Raynor and Charles Blair MacDonald. The wide open, geometric course has a number of greens with squared-off corners, and the bunkers are the deep and simply engineered trenches that you would see on many Raynor designs. While I can’t fully judge the work until seeing it in person, it appears they have done a good job in mimicking the style, and, at the very least, they have provided something different and new for most of their clientele. That is a small sample size (aren’t they all when only a handful of new builds are opened a year? ), but it does indicate that a different look and approach is being considered. I can be on board with this, but I would like to see that style get pushed further artistically, with more of a natural-feeling irregularity to the faces and the top lines. I’d also like to see a real emphasis on letting the grass faces go thin and rugged, which would not only create a beautiful, contrasting look, it would also allow more balls landing on the face to release down to the sand. This is much easier said than done and would be nearly impossible to consistently achieve across a given property, but having that virtuous goal for thin and wispy is a great start. Above: a mix of old and modern bunkers where the grass face is left thinner. It should be interesting to see how some of the new high-profile developments turn out in the next few years. What will Coore and Crenshaw do if their opportunity on a true Scottish linksland is given the green light? Will Tom Doak do something much different from the open sandy waste areas commonly found on the other two courses at Sand Valley? Will the Hanse team continue to evolve their recent quasi-Australian style of hard bunker edges bleeding out into scruffy, sandy areas? That will all be fun to keep an eye on, but the biggest question remains—what type of bunkers or hazards have we not yet thought of? What could be the next big development? I’ve got an idea for something that I think would work well in the California and Western U.S. landscape, looking very cool and natural while having serious impacts on strategy. It needs to be the right type of site though, and opportunities for new builds in the West (and everywhere) are scarce. I could also maybe see a return to a version of the very odd, sculpture-like features found in some bunkers from the Victorian era (see images below), but these come with their own maintenance challenges and will be sure to rankle a card-and-pencil player who finds an impossible lie (which in matchplay might just simply be one lost hole, but I digress). Also, once again, it’s not really a “new” idea. And maybe that’s the point. Maybe there isn’t really a new and undiscovered idea out there, and our goal should be to continue to do what works best for each specific site. Perhaps we keep pushing what we are already doing, injecting more subtle creativity in each new attempt without losing sight of functionality and strategy. Let us also seek to utilize the odd features found on any given property. Instead of wiping a site clean before starting a project, we should ask if that wall, barn, road, berm, washout, water tower, or any other item of funk could be utilized in the design. It could add value strategy of the course while also providing a sense of place unique to that design. And, in the end, isn’t that what any good bunker or set of bunkers ought to do? *To be fair though, I’ve worked on a lot of sites that warranted it, whether it is in sandy Holland or France or in the rolling hills of California, where elements of Thomas and MacKenzie styles make perfect sense both in the immediate landscape and in context with the famous courses of the region. It’s also something that every client and architect I’ve worked with has wanted as well. 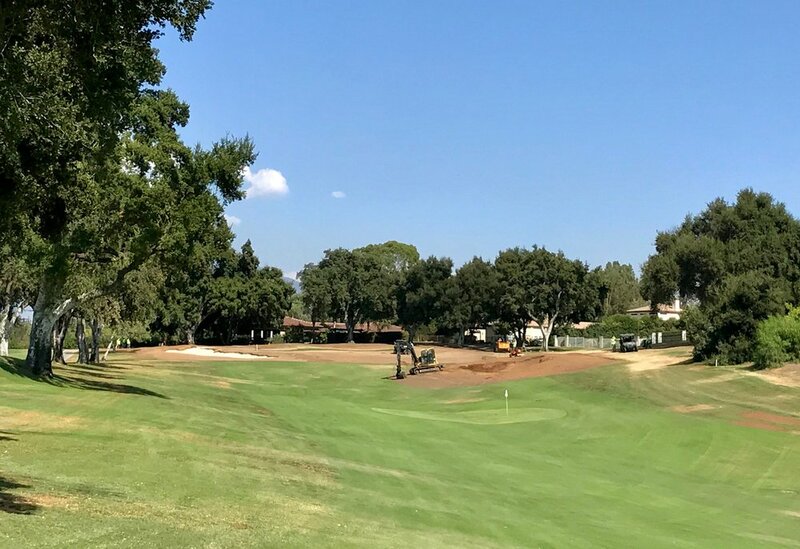 While we continued to chase new projects through RFPs and interviews, 2018 was highlighted by a return to the field with a full bunker renovation at The Saticoy Club near Ventura, CA. Getting back into the dirt and the excavator was good for multiple reasons—refine skills, increase experience, pay some bills—but maybe the most important of all was the reminder of how satisfying it is to get out and do creative work on a bigger scale. The whole reason I ever wanted to get into this golf design thing was to do creative work, and nothing is more of that than the actual shaping of golf features. No matter how business progresses over the years, I plan to be doing as much of this creative work as possible. It’s the driving force of everything we do. The following contains a comprehensive look back on Hochstein Design’s 2018. I first dive into the work we did, primarily that which went into the ground (for multiple reasons, it’s too hard to comment on speculative work, as much as I would love to share some of those drawings and ideas). The second section explores some of the new golf courses visited this past year, highlighted by a study trip to Philadelphia that included visits to both Merion and Pine Valley. Finally, I round it out with some non-golf items like music and travel. Golf purists may not care what I think of that, but those things to me play an important role in shaping out the year. As usual, everything is presented in list form for fun. Enjoy, and thanks for reading. As mentioned before, Saticoy was the big project of the year. Thad Layton of Arnold Palmer Design Company called me up at the end of last year, inquiring about my interest in working at a club near Ventura with George Thomas ties in its history. It all sounded pretty good to me, and luckily it all came together with the project breaking ground in May. The original Saticoy 9 in 1938. A lot of bunkers had clearly already been filled in, a trend during the Depression-Era 30s. Saticoy CC (now renamed The Saticoy Club) was originally a 9 hole Thomas design down in the valley in the town of Saticoy. 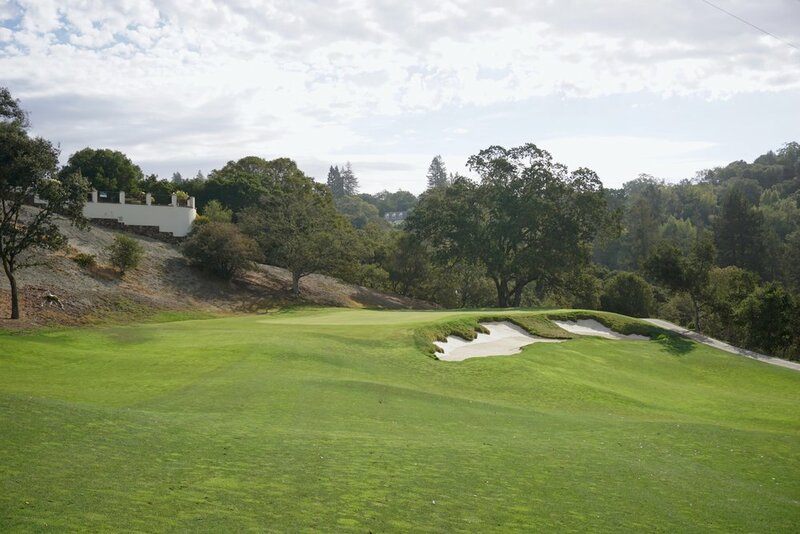 With a desire to grow to a full 18 though, they moved up into the nearby hills in the early 1960s and contracted William F. Bell (son of Billy Bell, George Thomas’s long time partner) to design the new course. It would be part of a newly beginning trend linking housing development and golf, but in this early version the routing seems not to have been overly compromised. Most of the housing sits up on narrow ridges that would have been difficult to place golf holes, and the best stretch of the property—the middle run of the back nine—was left alone to golf. The ground movement throughout the course is very good and interesting, and the greens are treacherously pitched, especially at today’s speeds. The bunker arrangement was quintessential 60s though—penal and repetitive—and made even moreso that way after the latest renovation by John Harbottle. They had also become especially difficult to play with sand splash build up making the deep bunkers even deeper. The first phase of the project was to work on these bunkers, first making them more playable but perhaps more importantly shifting them around to increase strategic interest among the holes. This is somewhat subtle work in the grand scheme of design, but it can have a major impact on how the hole can be played in both the long game and the short game. These sorts of changes can be just as satisfying as blowing the whole thing up and starting over. It was a really great project to be involved with. Sure, it was bunker building in a beautiful spot, and Thad allowed a level of autonomy and input that drove me to do my best. What was really great about the project though were the people. Tim Paulson, the superintendent, was great to work with and is one of those guys who “gets it” when it comes to both turfgrass and architecture. Jeff Bradley of Coore and Crenshaw fame came in to help us along during the home stretch. As you can imagine, he was a really cool guy and great to stop and have a chat with. John Bolasky, the construction superintendent, straddles that perfect line between being easy-going and getting the job done. You can’t ask for much more than that in a contractor. And of course, Thad was a great partner throughout the project, and I really think we complemented each others’ respective skill sets. You can only hope for more projects to go like this one. Saticoy wasn’t the only thing we did out in the field though. In August, I had to peel off the last bit of Saticoy to go build 3 new bunkers on the 7th hole at Santa Ana before returning back up to Ventura County. 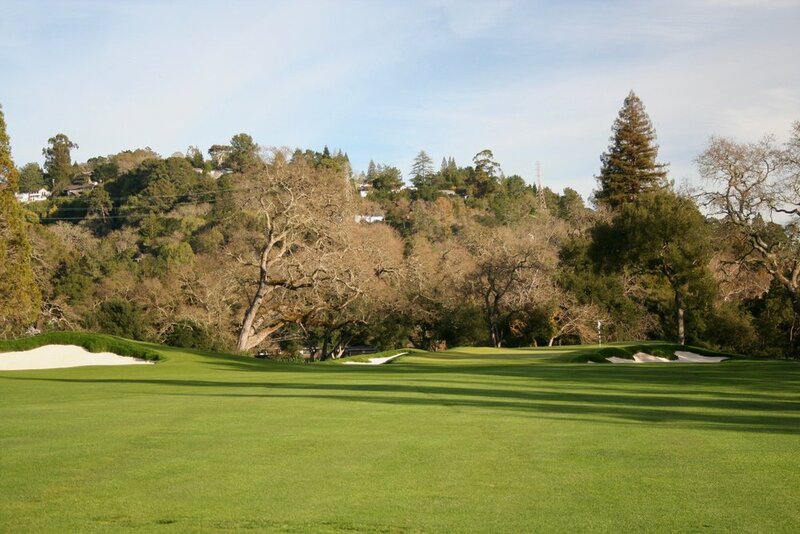 We also had a tee extension/renovation on the 6th hole at Cal Club, one of the benefits of which was tearing down the fence to open views of the Bay, and a reshaping project on the right side of the 17th hole at Orinda after eliminating a cart path there. Wiping out that ugly landform and returning it to how it used to be was an especially satisfying task. The Canyon Bunker just after shaping. Cutting straight into an existing landform brings instant gratification. 1. Canyon Bunker, Saticoy Funny enough, this could probably also double as my least favorite thing I worked on for how difficult and discomforting it was operating right next to the canyon edge. It was fun though to carve something straight out of the existing landform and make an instant impact. For awhile I wondered if we could even do a bunker in that spot, the concerns being overall steepness and finding a drainage solution that wouldn’t cause erosion. After seeing massive washouts coming from small pipes at Rustic Canyon and along U.S. 101, I knew that traditional bunker water collection and piping it out wouldn’t be an option unless somehow we could run the pipe all the way down to the base of the canyon—a very difficult task indeed. We decided to go for an informal “waste” bunker with straight line interceptor drains at the bottom that led to sumps in place. This means some water would be caught and held in place, and heavier rains would sheet over the edge broadly, just as they did before. With all this, we were able to achieve what we set out to do—create a visually striking feature as well as get balls to hold and keep from kicking down out of bounds into the canyon below. 2. Hole 13 Greenside Bunkers and Slope, Saticoy The first in a stretch of 3 outstanding and dramatic holes, the par 3 13th was just another hole before the project work started. It was surrounded by trees, especially at the back, and had that typical “bunker left, bunker(s) right” arrangement that every other hole on the course had. After clearing trees to open up the views, including revealing the dramatic backdrop and highlighting a couple of specimen stone pines, the feel of the hole completely changed for the better. After eliminating all the bunkers on the right, replacing them with a short grass kicker slope, and adding an additional little one on the left to cut a bit across the front of the green, the strategy of the hole is also completely different. Long hitters now have a tucked pin on the left to attack, and short hitters also have a way of finding it by hitting a running shot off the kicker slope. Hole 13, The Saticoy Club. The backdrop was previously a wall of trees. 3. Hole 2 Greenside Bunkers and Surrounds - Saticoy This was a hole that was previously completely surrounded by bunkers, and similar to the 13th, we sought to change that up and give the shorter hitter another option to try and find the green by eliminating the left bunker and shrinking the front one in half. In place of the sand are short grass and contours that could help corral the ball onto the small, narrow putting surface. Yes, the hole is already a short par 4 for many. There are plenty of players though that still hit a longer club into the green, and it is important to consider their interests as well. On top of this, I think the arrangement turned out to be one of the more attractive sets on the course and fitting of the neat setting of the hole among giant old eucalyptus trees. 4. Hole 14 Greenside Bunkers and Surrounds - Saticoy There are a number of things to note here besides this being one of the best settings I’ve ever had the pleasure to work in. The first is that the left greenside bunker is one of my favorite individual bunkers that we rebuilt on the project. While working on it, I shifted the front part of it left about 5 or 6 feet. This is important because it makes a long approach into the par 5 green that much more inviting. The right side of the green had a bunker, but again in the name of variety, we eliminated it and replaced it with a sharp short grass falloff. Misses to the right will be pushed well away from the green, but there are more options now for how to play the recovery. The back bunker was supposed to be rebuilt in place, but the more I looked at it from the tee, the more it just felt disconnected from everything else going on. Additionally, it felt like there ought to be a bunker in the lower left approach area, where two canary pines happened to be standing at the time. I pitched this to Thad, and luckily everyone else was on board with the field change. It was a pain pulling out the stumps, and there was some difficult brush clearing that the grounds staff thankfully helped with, but the effort was well worth it. 5. 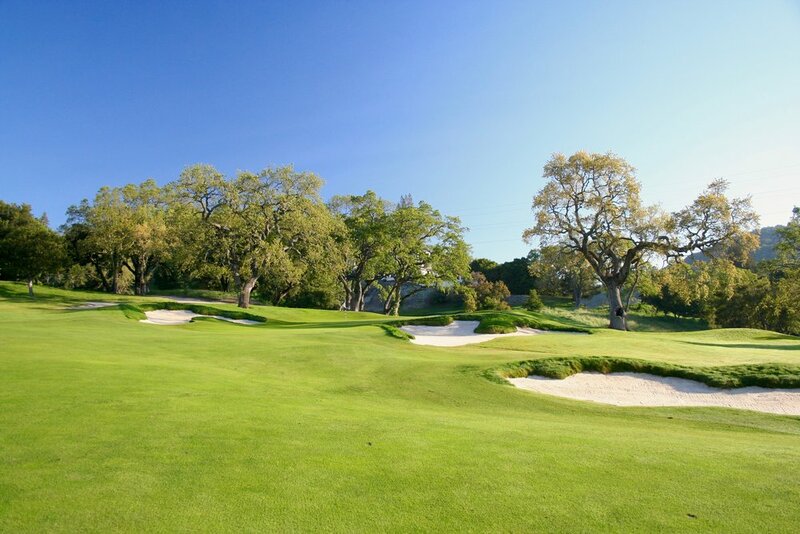 Hole 15 Fairway Bunkers - Saticoy Trees and out of bounds on the left force a lot of the shorter hitters down the right of the hole, where a downslope would carry a ball right into the large first fairway bunker. To combat this, we shifted the first bunker out to the right to allow more room to skirt it. In exchange of that, we shifted the second fairway bunker to the left to catch more of the longer drives. These bunkers and the right greenside bunker all overlaid each other despite being well spread apart, and getting them to match up properly required a whole lot of cart rides back to the tees to check out how the top lines were all relating to one another. The bunkers on the 15th at Saticoy play off of each other nicely, despite having gaps of about 40 and 70 yards between them. 6. Hole 7 New Bunkers - Santa Ana A loss of some specimen eucalyptus trees left the previously bunkerless hole a bit lacking in defense and visual features. 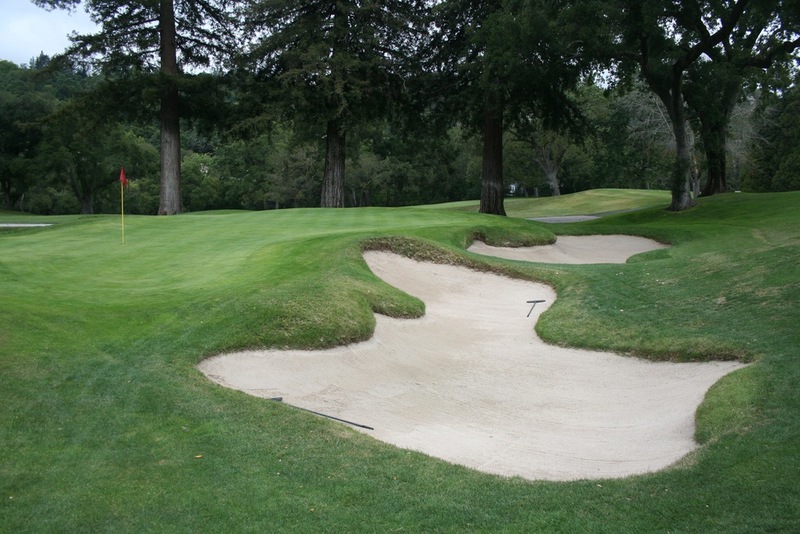 Jay Blasi came up with a really nice scheme of 3 bunkers as a replacement solution. A big one at the turn of the grassline near the green keeps the big hitters honest, a little pot near that one also guards the aggressive line, and big bunker short and right guards what is actually the ideal line while providing nice visual balance. 7. Hole 5 Bunkers - Saticoy Besides greatly shrinking the front right greenside bunker and wrapping fairway around it, these bunkers were all just rebuilt in place. Nonetheless I really liked how they turned out and profile against one another. 8. Hole 18 Fairway Bunker - Saticoy The biggest bunker at Saticoy by good margin, this was a fun one to build and have come together. Always nice to have a big space to work and throw dirt around! 9. 17th Fairway Cartpath erasing - Orinda Bunkers and greens are the most fun and satisfying features to work on, but erasing an ugly cartpath is not that far behind. It isn’t just the cartpath itself, it is the landforms needed to make it a flat and traversable surface. 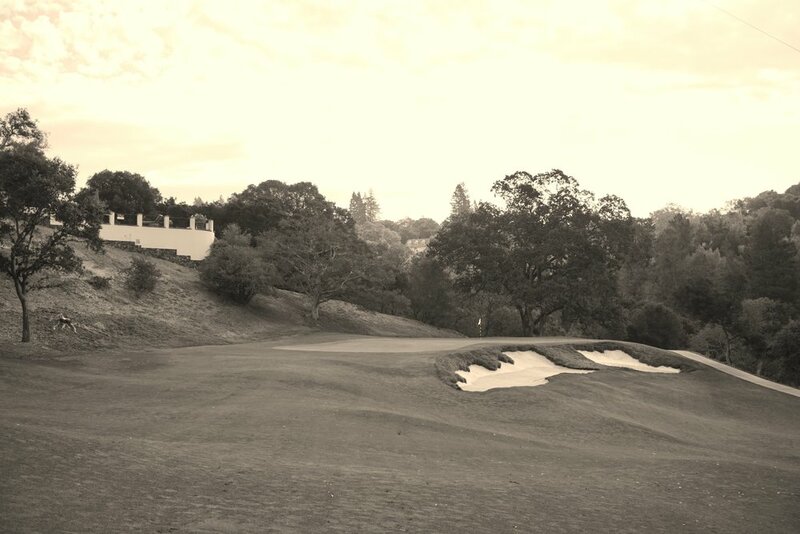 In the case of the 17th hole at Orinda, those landforms were particularly hideous as they broke up a broad, natural hillside, leaving an odd horizon line at the break. Spend a couple of hours on a dozer though, and it is mercifully gone. 10. 12th Hole Bunkers - Saticoy There was a thought at one point to eliminate the rear bunker of the left greenside pair, but after doing the same exact thing on the previous hole, it was better to leave it. Also, I thought with some tweaking that they could turn out to be a pretty nice pair. (previously it was hard to tell that they were two as the back bunker was hardly visible) They are simpler than a lot of others on the course, but I do think they work well together. As a bonus, they are now visible from the tees on 11 thanks to tree clearing. That was another reason to keep the pair together. Good views, solitude, and beautiful evening light were the perks of working around the 14th green at Saticoy. 1. Working the greenside bunker on the 14th at Saticoy, a peaceful, natural corner with views down the canyon and out into the Pacific. 2. The Channel Islands appearing from the haze on a hot evening while working the fairway bunkers on the 5th at Saticoy. 4. Building new bunkers on the 7th at Santa Ana. It was nice to work out there surrounded in turf as opposed to dirt for a change! 5. Working at Orinda close to home is always a good deal. It’s even better when you get to wipe out a benched-in carpath you’ve been dying to re-naturalize for years. There is little doubt what was the highlight of golf discovery in 2018: a late September trip to Philadelphia. While I had been to the city around 10 or so times before, there had never been any time to go and have a look at any of the area’s great golf courses. With a potential visit for a family event looming, we decided to commit and make a week of it so that I could spend some time checking out a few of these great courses. In the 5 waterlogged days available to me, I was able to walk 9 different courses in both PA and NJ, including the two really big boys, Pine Valley and Merion. Out West, I was able to check out a few courses while working at Saticoy. The South Course at LACC was the highlight, and I was able to see George Thomas’s two half-lost courses at Ojai and La Cumbre. Along the way, I met a great number of good people, including superintendents, GMs, head professionals, enthusiastic members, and others. I’m appreciative of all these encounters and the hospitality that everyone showed me. Let's start by noting that this list is just a casual indicator of how good I feel a course is. It is a combination of how I think it holds up for a range of players as well as just how much I personally like it. The brackets [ ] indicate a "Doak Scale" rating. It should be understood that I didn't spend the same amount of time on every place and that they were all first time visits. These rankings and ratings are somewhat arbitrary and based on what I saw, understood, and felt about each course. I also get admittedly swayed by firm conditions and links golf in particular; a true links course generally gets boosted by 1 or even 2 "Doak points" whenever I rate it. This didn’t actually seem to affect the soggy Philly courses too much though—their quality architecture is pretty easy to see and appreciate. Bottom line is don't get too worried if something seems too high or low--these are good golf courses that are largely interchangeable. 1. Pine Valley - Pine Valley, NJ; George Crump, with input and assistance from a number of fellow architects  I had always questioned Pine Valley’s status at the top, for its overall difficulty would seem to preclude it from being the ideal course. I still feel like the Old Course is the best, but damn, Pine Valley is really good. What really stands out to me about Pine Valley besides its beautifully scrubby setting is the shear amount of variety. Big greens, small greens. Open approaches, closed-off approaches. Wide fairways, tight fairways. There is a lot going on at all times, and I also felt like it was actually fairly playable for a mid-handicapper. 2. Merion (East) - Ardmore, PA; Hugh Wilson, with some revisions by William Flynn [9/Inc.] I was able to walk the East Course at the end of Gil Hanse’s renovation project with most of the course growing back in. It wasn’t a final product but it was easy enough to see everything going on, and there is a lot going on. Merion East uses the land beautifully not just to get a full 18 hole course but also to create a great variety of challenges. The course is no picnic, especially if the rough is left shaggy, but the architectural variety would make it a very fun and engaging play if your game is on. I’m probably rating this a 10 after seeing it in its re-completed state. 3. Aronimink - Newtown Square, PA; Donald Ross and J.B. McGovern* with recent restoration by Gil Hanse  This course is just solid. The routing is good, the bunkering is uniquely styled and well placed, and the greens have a lot of interesting stuff going on without ever crossing the line into crazy. 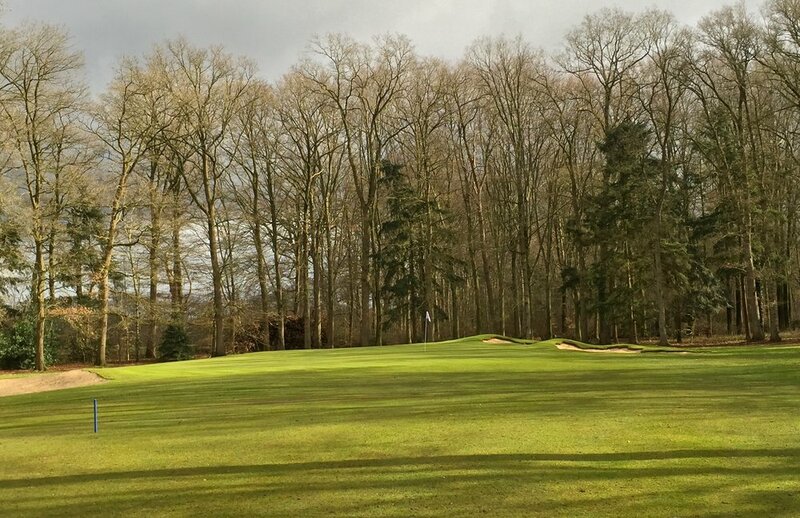 The restoration work was carried out really well, with green edges recaptured, trees selectively cleared, and the bunkers restored to the version just after the course opened, of which there are numerous aerials available to see and mimic. It doesn’t matter whether Ross or McGovern were responsible for these bunkers, the right move was restoring to this version, which stands as unique in golf. The 11th at Aronimink features a little of everything—clustered bunkering, the old white house, and a green with a lot going on. 4. Los Angeles Country Club (South) - Los Angeles, CA; Recent re-design by Gil Hanse  In just about every way, I think the Hanse team nailed this project. 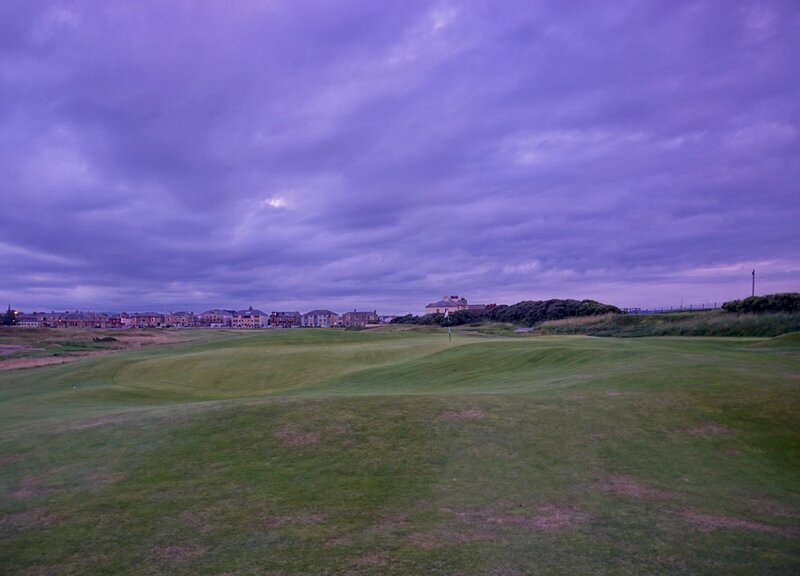 The South course is the perfect complement to the famous North. It is shorter, friendlier, and full of quirk. 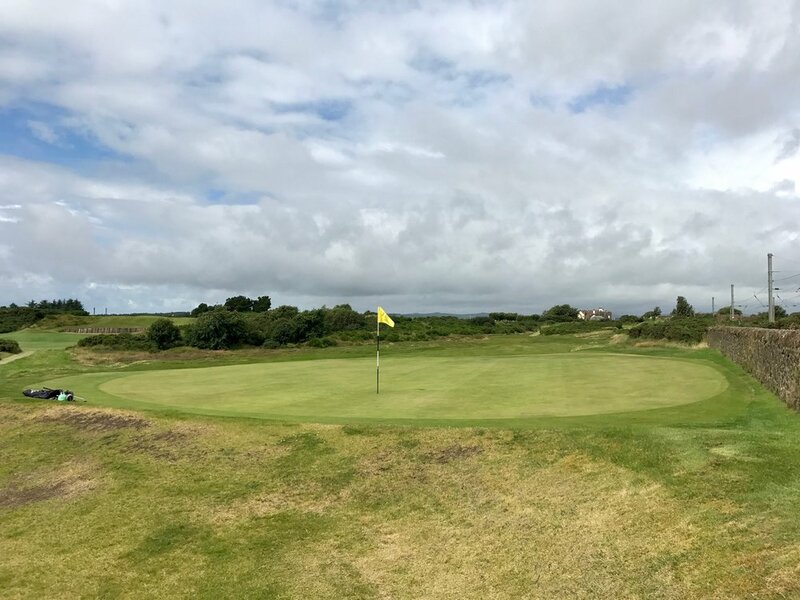 There is a great variety to the holes, including the table-like Biarritz on the 4th, the bunkerless 5th green with its front right mound, the “Redan-arritz” 9th, and the short grass Lion’s Mouth 10th green. This is all while doing excellent work with the native areas and washes and creating a bunker style similar to the North. The setting is also unlike any other, with the playing field unfolding beneath the glassy skyscrapers of Century City. While the North Course is an excellent strategic test of golf, the South is a course to just go out and have some fun. There can’t really be a much better 1-2 punch than that. 5. Merion (West) - Ardmore, PA; Hugh Wilson  I feel like I am much higher on this course than most people, but I really did enjoy it. The greens complexes feel even older and funkier than their East counterpart while also containing a lot of subtle beauty. The property has a few distinct sections, including a broad upper plateau, an intimate lower stream area, and rolling ground in between. The routing does a good job of meandering in and out of these different sections so well that I didn’t even realize I had returned to similar parts of the course I had already played. 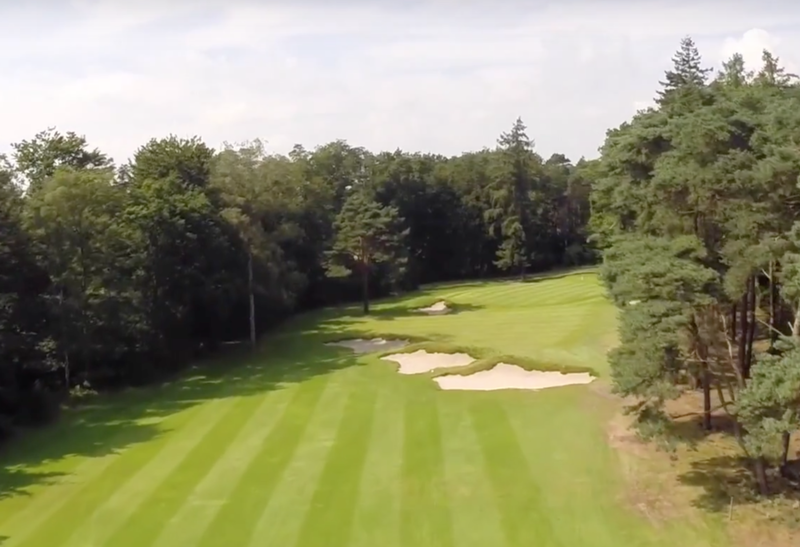 Throw in the short overall yardage and some quirk like the fallaway drop shot green at the 4th or the tees directly off the back of the 9th green, and you have a course that feels like it could be in the middle of the UK. That is a good thing in my book. 6. Rolling Green (Front 9 Only) - Springfield, PA; William Flynn [7/Inc.] It’s a testament to the overall strength of the Philadelphia golf scene that I previously knew little about this course. Quintessentially William Flynn, the course is a sublime mix of bold and simple. 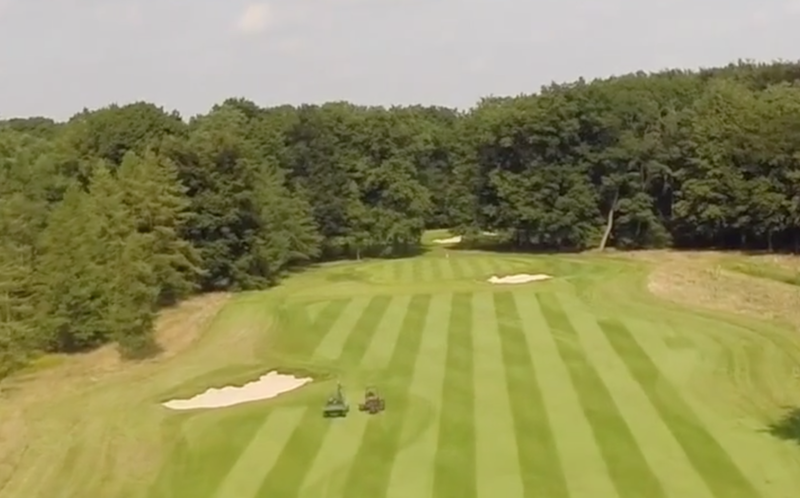 Big land movements are well used in the routing, and sweeping slopes are combined with big simple bunkering to create highly effective strategy and shot demands. Unfortunately, the rain reached such an extreme level of downpour that I retreated after nine. I am looking forward to getting back and seeing the rest though as well as what Riley Johns and Keith Rhebb are able to do in their restoration efforts. 7. Northwood - Monte Rio, CA; Alister MacKenzie  I finally made the trek up to the Russian River to play this fabled MacKenzie track among the redwoods. Because of how narrow and tree lined it looked, I didn’t really have that high of hopes for it despite the MacKenzie pedigree. My hopes were vastly exceeded, though. To start, the course is actually much wider than what it appears; the massive scale of the trees is what creates the narrowing effect. It’s fairly short nature also calls for more of a control game as well—I think I hit driver only 3 times. 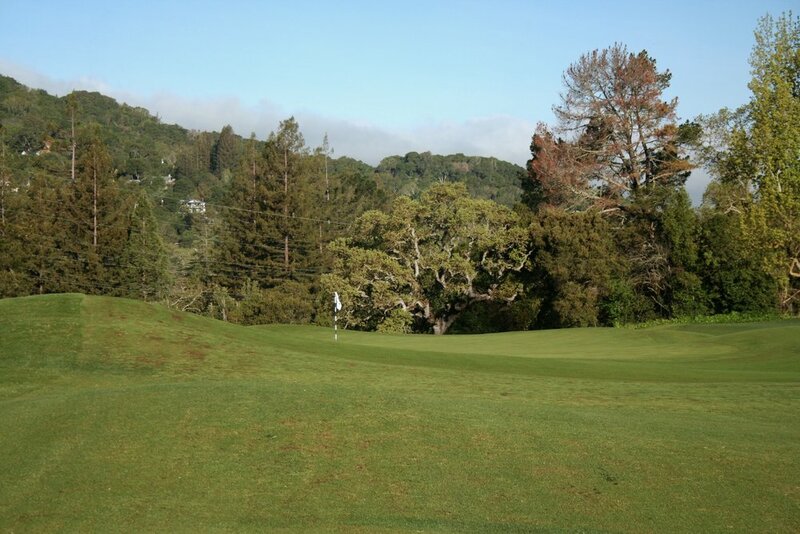 Throw in MacKenzie greens and a truly special setting, and you have a great golfing experience. Golf Guide’s Kyle Surlow provides a nice sense of scale among the mighty redwoods of Northwood. 8. Gulph Mills - King of Prussia, PA; Primarily Donald Ross and Perry Maxwell  I had the misfortune of playing Gulph Mills after yet another couple of inches of rain, but that didn’t prevent me from seeing what was some pretty good architecture, even if it’s been a little jumbled over time. Gil Hanse has helped tie it all back together as well as taking out trees to open up vistas around the beautiful, pastoral property. I mainly came for the greens, especially the Maxwell ones, and they did not disappoint. 9. 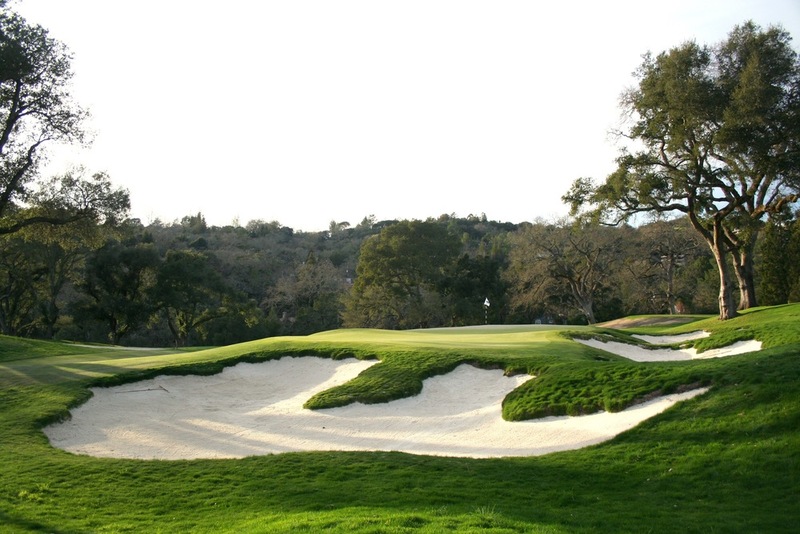 The Saticoy Club - Somis, CA, William F. Bell, with recent bunker revisions by Thad Layton (A.P.D.C.) [5.5] After the first phase of tree removal, there is now some room to play this up and down replacement course to the original George Thomas nine holer. It’s a 1960s housing development course, but don’t let that fool you, as there is some very good golf out here. With really good land movement, quick tilted greens, and standout holes like the 2nd, 13th, and 14th, Saticoy is worth checking out if in the area. (t)10. Ojai Valley Inn - Ojai, CA; George Thomas, with many modifications through the years  George Thomas’s Golf Architecture in America is a fantastic read, but it also contains a large collection of tragic photos of dramatic SoCal golf courses that no longer exist in anything resembling that previous form. Two of those courses are his own—Ojai and La Cumbre. They both still exist, and there are still some good component features of them—the setting at Ojai is still incredible, for example—but the original drama and character is gone and not very easy to replace. It is still well worth trying to get back what you can, however. I am not sure how much incentive Ojai has in doing so at this time, but La Cumbre is starting to work with Jay Blasi, who I imagine will be working to try and put back whatever he can. (t)10. La Cumbre - Santa Barbara, CA; George Thomas, with many modifications through the years  See above. *His involvement is speculated upon and mostly goes to the bunkers, which are different from Ross’s plan and anything else that Ross had built before or after. This was honestly hard to discern, as so many courses in Philadelphia are almost equally solid throughout. It is also hard not to make this a list of just Pine Valley and Merion holes; nonetheless, I will shoot for diversity. Take the actual ranking with a grain of salt and just appreciate these holes as good examples of design. LACC South No. 4. I just love the feel and look of this hole. This bunker short and right is just where you would want a long iron or wood shot to land and feed onto the right-to-left tilted green. Aronimink’s greens are special and classic. Here is the 12th green with the 5th and the 4th further off in the background. 1. Pine Valley Bold, with lots of variety in size and strategy. The 1st, 4th, and 16th were my favorites. 2. Merion (East) I didn’t know what was in the ground before the recent work, but supposedly they are matched back up exactly as before by way of laser data. I liked what I saw though. The mix of bold and subtle creates challenges both on approaches and shorter putts. My favorite green was the large, tilting 5th. 3. Aronimink These aren’t quite the best Ross greens I’ve seen (hello Glens Falls), but they are pretty close to it. There is a lot of movement and variety that flow beautifully, and greens expansions in the restoration have reclaimed some very interesting pins and short game shots. 4. LACC (South) There are some really creative and bold green complexes on the South course, which also helps set it apart from the North, whose greens, while very good, are much simpler. The short grass Lion’s Mouth-like green at LACC South is both unusual and fun. 5. Gulph Mills Perry Maxwell was responsible for a number of greens here, and you can tell as those greens have very natural looking, variable contours that while often subtle are very impactful upon play. 1. Pine Valley Rugged, varied, punishing, and important to play. The tight little “surprise!” trench bunkers around the backs of greens were a highlight to me. Rugged, beautiful, and strategic—the bunkering at Pine Valley. This is hole 13, probably my favorite on the course. 2. Aronimink Every time I checked the yardage of fairway bunkers guarding the ideal line (which was often dictated by greenside bunkering), they would be right around the yardage I would be trying to drive the ball. With some variety mixed in, that is pretty ideal for a course built to test your game. Also, McGovern’s clustered style really isn’t quite like Ross (or anything else), but kudos to the Hanse team for bringing back this version. 3. Merion (East) Merion, like many old courses, always had that rugged sort of style to its bunkering. What always appealed to me though is the variety in size and scale of them. 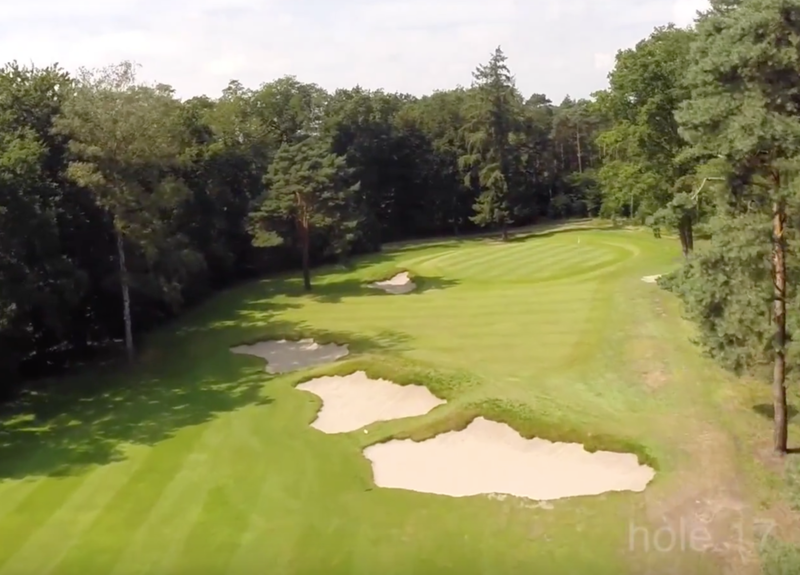 Nowhere is that more apparent than on a single hole, the 4th, which traverses across a massive fairway bunker before reaching a green surrounded by a series of little bunkers. The versions I saw had just been reworked by the Hanse team. They were still growing in when I walked around, but it will be interesting to see how they evolve aesthetically. 4. Rolling Green William Flynn is the master of dead simple strategy. 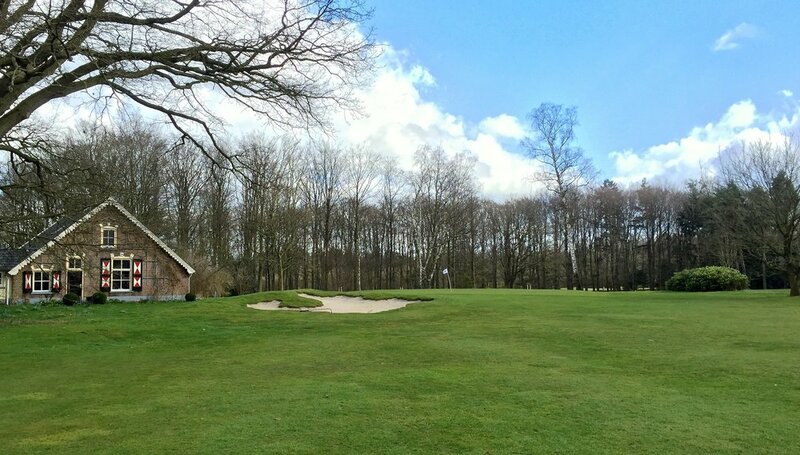 Rolling Green is full of big, bold bunkers located right in the spot where you would like to play your ball. 5. LACC (South) More good work by the Hanse team. 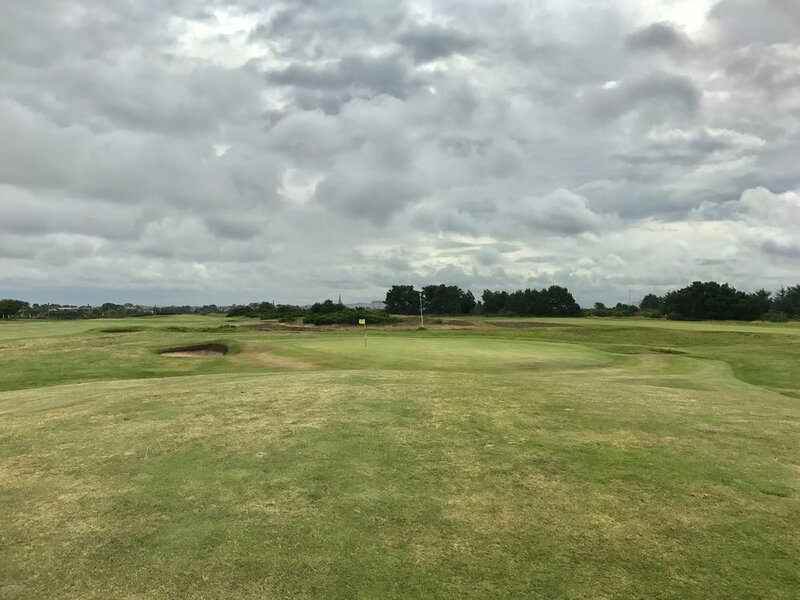 Stylistically similar to the more famous North course, the bunkers are fewer on the South, where short grass and contours come more into play and rightfully provide an ideal complement to the North. The looping routing at the little par 3 course at Golden Gate Park makes it feel like an adventure while also changing up the angle of the Pacific wind. This is a short and pretty incomplete list this year because of the abnormally wet conditions around Philadelphia this fall. If anyone watched the BMW Championship at Aronimink and saw how soft and wet it was, well, it only got worse from there. Weeks later when I visited, there were still bleachers and tournament stands all over because they could not get any equipment to them due to how soft the ground was. Outside of sandy Pine Valley, I can’t fairly assess any course for what their conditions might normally be and how they might normally play. I give a lot of credit though to every superintendent just for hanging on and staying afloat though, no pun intended. 1. LACC (South) Short, lean and bouncy bermudagrass all over. The ground game is highly encouraged here, both from a distance and near the greens. 2. Corica Park Marc Logan, effective co-designer of the new course at Corica, is an agronomist by trade. He’s also Australian and therefore understands how to get lean, fast playing surfaces. 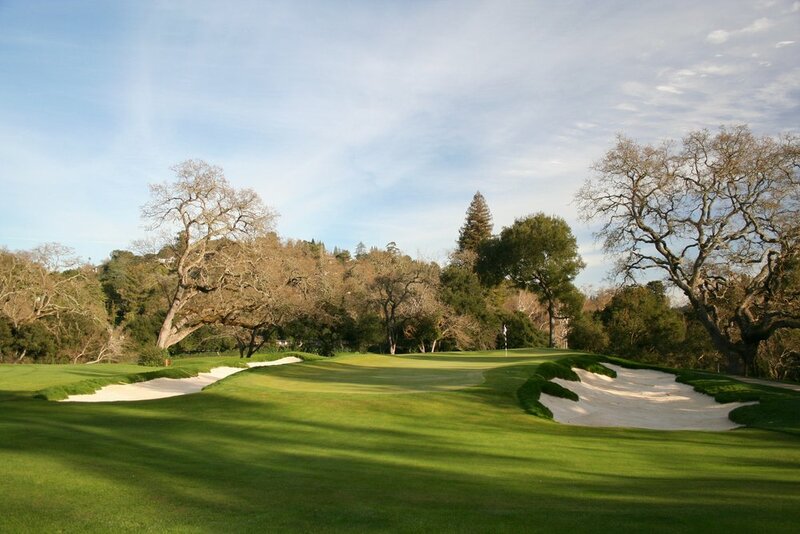 The tight Santa Ana bermuda fairways lead right into slick approaches and surrounds of the quick, firm greens. 3. Pine Valley Not surprisingly, the only Philadelphia area course that had any semblance of firmness. Sand is good for golf. 4. 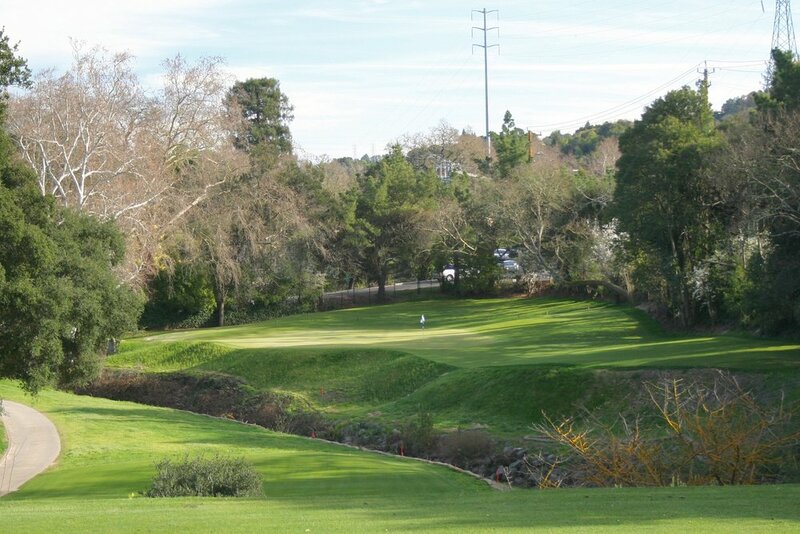 Saticoy This goes particularly for the front nine, which has seen the fairways re-sodded with Santa Ana Bermuda. (The back nine will get the same treatment in a future phase of work.) The greens are notably slick and true, creating definite “no go” zones around the hole. 5. Plum Hollow Despite being the end of October after a rainy week previously, the fairways were firm and bouncy and the greens quite speedy. Superintendent John Sabat is doing a great job. 2. Walking Pine Valley with Jamie Slonis. This was a surprise invite from the night before, and it lived up to the hype. We went back nine first and were able to avoid play enough to see almost everything. This was definitely a case where I was glad to just walk for my first time out there, as I could really focus and look at things from different angles without worrying about hitting shots. 3. No clubs in tow, but getting to revisit LACC with Tommy Naccarato and learn more about its restoration process was a big highlight. Seeing the very cool South course for the first time too was a bonus. 4. Joining a Linksoul “Mandatory Golf Friday” at the last second and walking up to find I’m playing Matt Ginella and John Ashworth, both of whom I had never met. The real kicker was the Blue Angels taking off about 70 feet over our heads on the 6th tee—I don’t know if any of us had ever heard (or felt) anything that loud. 5. Finally getting in a round at Northwood with Kyle Surlow of Golf Guide. It was nice that we finished just before the monsoon, too. (t)6. Walking Merion East with Ben Hillard of the Hanse team. Great to catch up with a friend, learn more about what they were doing, and take in a world class golf course. (t)6. Playing Merion West alone on a nearly empty, gray fall Monday. 8. Another where I wasn’t playing, but walking Cobb’s Creek with historian Joe Bausch and learning all about it’s story was a really cool experience. 9. Finally playing a round at Plum Hollow with Jason and Keith, a couple of younger members enthusiastic about the historic Alison design. (t)10. Walking Carmel Beach on Sunday of the Pebble Beach Pro-Am. As a kid watching this event in the snow of a Michigan winter, I had always wanted to be one of those people in the CBS shots of the peripheral scenery. Being there, you don’t realize just how close you actually are to the action on the 9th and 10th holes. (t)10. 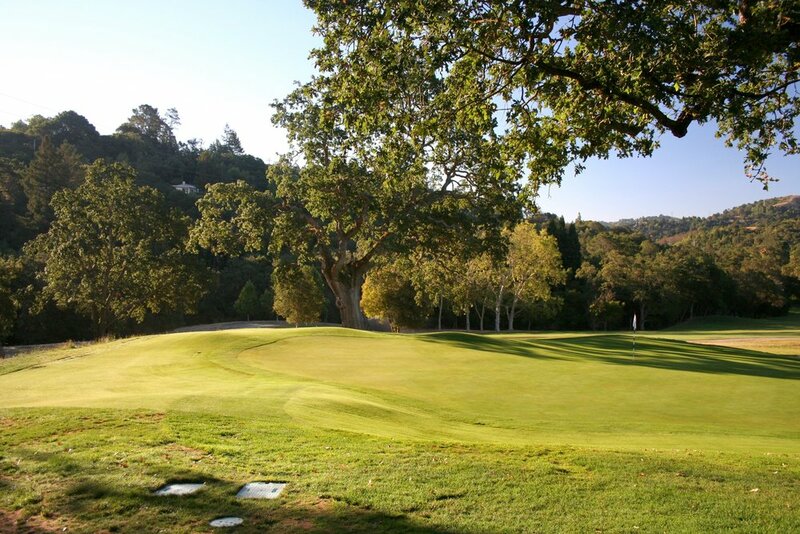 Rounds at Ojai and Rustic Canyon with Thad Layton. Always fun to tee it up with Thad; always fun to tee it up at Rustic Canyon. H.M. Solitary walk around Aronimink. Another course where it was nice to look at different angles and yardages as well as roll balls around the greens to analyze contours. This year’s list of curiosities and oddities isn't quite as curious and odd as last year, but that’s what happens when the previous year included a trip to Scotland, which is not only the Home of Golf but also the home of quirk. Nonetheless, there was still some enjoyable funk to be had, most of which was in the Philadelphia area. You usually only find tees this close to the green in the UK. 9 green and 10 tee at Merion West. The barn is very much in play on the 10th at Tavistock. MacKenzie’s landforms at Northwood are just sitting there waiting to be carved back out into bunkers. 1. Cobb’s Creek. Cobb’s story is well known, but the land and site are much more impressive than I imagined. Hope Gil Hanse and the Friends of Cobb’s Creek can get going on realizing this great story soon. 2. Northwood. Everything is right there for the taking. With Alister MacKenzie’s bunker landforms and greens contours still existing, this would be one of the easiest, most inexpensive, and most impactful restorations that can be had. (t)3. Ojai. This and La Cumbre would top the list if full restorations seemed possible. So much has shifted around at Ojai, and outside homes/structures have imposed upon a good number of holes at La Cumbre, including some of the more famous ones. The pictures of both courses in Thomas’s book Golf Architecture in America are incredible. (t)3. La Cumbre. See Ojai above. Above: It would take some major earthwork to get back the 16th hole at La Cumbre, and even still the upper left fairway is now occupied by private residences. (t)5. Merion (West). There are some really neat old funky features seemingly still lingering from Hugh Wilson’s time. Would be cool to freshen them up and bring back anything that’s missing. (t)5. Bala. This course is like any good William Flynn course but at a smaller scale. Again, this wouldn’t be a need for major work as the main features are already there. Trees are the biggest issue. These scenes were pretty nice to enjoy after a full day at Saticoy. Travel is a side benefit of this business, especially if you don't overdo it. Seeing the world opens you up to new things in all senses--sights, sounds, tastes--and the people you get to meet make it even more worthwhile. 2018 was a bit lighter in this category, as a lot of time was spent in familiar locales around California, and my big golf visit of the year was in Philadelphia, the home of my brother+sister in law and a city I’ve previously spent a lot of time in. Nonetheless, let’s talk a little about it anyway. Note: a big trip to Spain was excised from all of this, for it was non-golf related and will be addressed in a completely separate blog post. Not surprisingly, it would have unfairly dominated most categories. 1. Ventura, CA. Most underrated city on the West Coast? Again, not a whole ton to go off here this year since I never left California for work, and my big study trip was in a city I’ve spent a ton of time in. I can’t complain though, as California in itself is quite spectacular. 1. Highway 101 from Monterey southward. I had not yet experienced this stretch of road, but I very much enjoyed it, especially in the late day spring light when first driving down to Ventura. 2. Ronald Reagan Museum. It doesn’t matter what your politics are, a visit to a Presidential museum is both interesting and inspiring. Also pretty cool to get to walk around on Air Force One. Anyone in this business who spends a lot of time in a machine out in the field knows how valuable a companion the art of music is. It is easy as well to draw parallels between the two, a great golf course acting as a great album with the component pieces—the holes and songs—standing individually while contributing to the work as a whole. While there was some really good stuff I discovered this year, it felt like a step back from 2017. That happens, especially as you have heard more music over time. The more you have heard, the more difficult it is to discover something new that really gets you excited. Derek Duncan likes to ask on his Feed The Ball podcast, “How do we next advance the medium of golf architecture?” That is kind of where I am at with music. One interesting trend though has been emerging: my affinity with female lead vocals. 6 of my top 7 albums this year prominently or exclusively feature female lead vocalists, and I’ve been into the female-led bands Alvvays and Sunflower Bean over the past few years. I am not sure if this is an overall trend, a change in personal tastes, or simply anomalous. I’m betting on some combination of trend and tastes, and I’m interested to see where it goes. 1. Lost Friends - Middle Kids. This is their debut full-length album, and it is fantastic with nary a bad track. There’s nothing really that unique about their sound, but I really like it and the subtle elements you pick up from multiple plays. The songwriting is the highlight with the pace and feel of each track varying speed and intensity for a very complete overall album experience. 2. Hell On - Neko Case As music critic Jim DeRogatis summarized, “even ‘ok Neko’ is still very good Neko.” I probably wouldn’t put this album in the upper half of her works, but I still really loved it. I think her voice is the best in all of music—truly raw and powerful. One listen to her live performances makes that clear. 3. Offering - Cults. A solid-to-good album from them bookended by a pair killer tracks. 5. The Long Goodbye - The Essex Green A much more “normal-sounding” member of the Elephant 6, The Essex Green is especially great to listen to in autumn. It’s easy going with a subtle twang to it. After first discovering them while building bunkers in Holland, I picked up two of their albums for my Philadelphia trip. They didn’t disappoint. 6. Ok Computer - Radiohead. After many years of putting off a full listen of this famous album, I finally picked it up with the hopes of having the transcendental experience so many others have. I thought it was good, but it didn’t knock me off my feet the same way my first real listen to Wilco’s “Yankee Hotel Foxtrot” did 2 years ago. Perhaps that is just because so many elements of the album have been copied/utilized since. Or perhaps it is just like a great golf course that you don’t fully “get” the first few plays, and I need to continue listening further. We’ll see; look out for a possible retraction printed in a year’s time. 9. Hope Downs - Rolling Blackouts Coastal Fever Fast, upbeat indie rock with a little surfer twang. Good for knocking out some bunkers quickly in a decidedly SoCal setting. (t)10. Bloom - Beach House Gotta listen to some Beach House while living in a beach house. 13. "Shiny Happy People" - R.E.M. Podcasts have started to dominate my headphones as time goes on. While I still love music, I’m feel like I am hitting a plateau as far as my discovery with it goes. Podcasts offer a chance to learn something new, get lost in a story, or just have feel like you have some company while working out on the far corner of the property. As a lot of these are friends/social media friends, and I have contributed to one of them, I’ve listed this alphabetically instead of by ranking. Also, I haven’t been able to listen to too much of Erik Anders Lang’s Podcast, but his episode with Sean Tully of the Meadow Club was fantastic. Hoping I can get into more of it in 2019. If you can believe it, golf isn't the only important thing in life. Visits to special places, once-in a lifetime events, and time spent with your best people is a huge part of the picture. These moments contribute to personal happiness and indirectly serve as inspiration to what we do out on the golf course site. 1. Spanish Adventure with the Wife. This is number one with a bullet. For the first time in a number of years, we took a trip that was entirely on our own and had nothing to do with a golf project. And it was good—really good. It was not just the sights (which were incredible) or the food (which was delicious) or the arts (which were inspiring)—it was just getting to disconnect from everything else for two weeks and spend time with each other. As life will surely only get more busy and crazy, this is an important lesson to keep in mind. 2. Showing my brother and his wife around NorCal. For a multitude of reasons, this was my brother’s first trip out to the Golden State. We made sure to make the most of it though, exploring San Francisco and our favorite spots, catching a Warriors playoff game at Stadium Pub in Walnut Creek, and heading up to the mountains, which was highlighted by a visit to Yosemite. 3. Sharing the Big House with California Friends. Having lived in California for over 8 years now, I’ve developed some really good friendships. Just through living here and working, I am pretty familiar with their upbringings and where they grew up. Nobody had seen where I grew up though. My one good friend is a Penn State business school alum and the other a Northwestern grad. As such, they were interested in seeing a game sometime at Michigan Stadium and suggested going to this year’s tilt against Penn State. After first visiting my parents and driving around my native area, which was full of late peak fall color, we made a full weekend of it in Ann Arbor. The game didn’t go so great for them, but it was really special to share that experience and play tour guide for a place I once called home. 4. Welcoming a new niece and a newly expected nephew. I have officially entered into the uncharted waters of being an uncle, first with my brother and sister-in-law and next year with my own brother. These are certainly exciting times; I’m really looking forward to teaching them the value of playing the ball along the ground. (t)5. Weddings. Only two this year (and both in NorCal! ), but it’s always exciting to see your good friends get married. 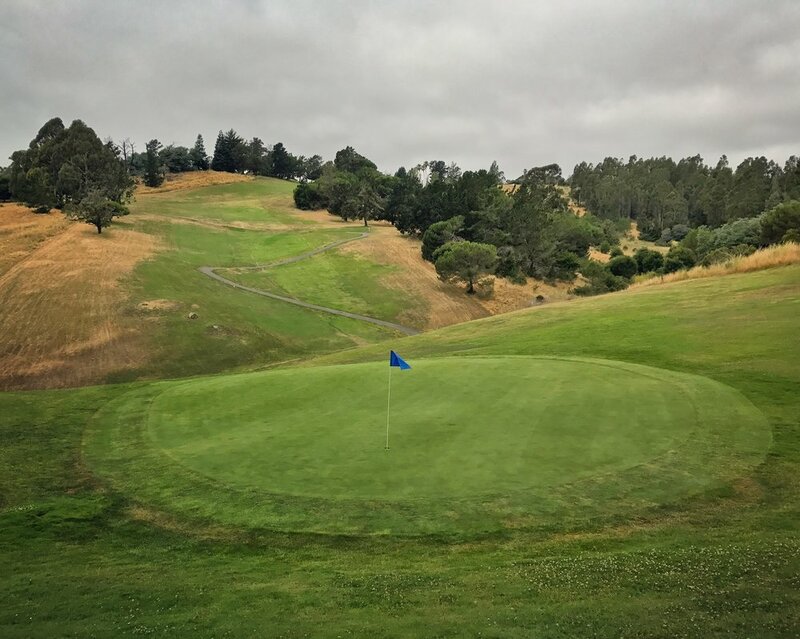 Both also happened to be at golf courses too, the first at The Bridges in San Ramon and the second at Tehama—two courses that make for a very pretty wedding backdrop but would also eat your lunch playing if your long game wasn’t sharp. H.M. Watching U.S. Men’s Curling win gold in the wee hours. Never thought I would see it happen, but they did it, curling like a team on an absolute mission, which they were. Another good year getting to do what I love calls for another heap of thanks. Thank you to everyone that accommodated me in my visits to your courses, especially those who took time to discuss them and architecture in general. The golf industry is a special group, and I always enjoy new encounters. Thank you to everyone I worked with this year. I can luckily say it was a real pleasure on every job, big and small. And lastly, thank you to the friends and family who help support this craziness, especially my fun-loving wife, who kills it in a job she works remotely and travels with me whenever she can. That effort and sacrifice makes all of this possible. On to 2019, where we already have some exciting work lined up and will continue pushing Hochstein Design to the next level. I was welcomed back to the Home of Golf with a full rainbow. Not sure how much I believe in "signs," but this sure felt like one. 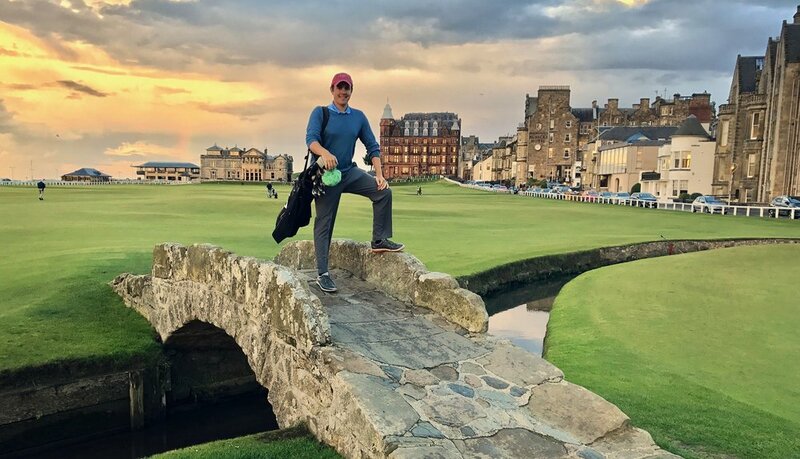 In early July, I was lamenting probably not taking a golf study trip later that month, figuring I just didn't leave myself enough time to organize an itinerary and make enough advance contacts. While sipping my morning tea and watching the final holes of the Scottish Open, I thought to myself, why don't I just go back there? Quickly dismissing it as kind of a crazy and unrealistic idea, I kept thinking about it, and the idea eventually got to the point where it ceased being crazy. This was doable. I knew the country, I knew that Scottish courses were easy to access, and I knew that even if I couldn't get on to play, I would still be able to walk those courses in the evenings after play died down. So, exactly one week later from that idea genesis, I was in the airport watching Jordan Spieth wrap up his dramatic Open title while holding a ticket bound for Edinburgh. This was a big chance to see most of the courses on the West Coast that I had missed during my year spent studying at Elmwood in 2010, and it would it would also give me an opportunity to reconnect with a number of people I had gotten to know while there, especially those around St Andrews. The courses and the scenery on the west were wonderful, and the architectural value of Prestwick alone made the whole trip worthwhile. Coming back to Fife and St Andrews for the second leg of the trip was going to be interesting though and perhaps even a bit emotional, as it was an area I loved but one that I had sort of left on quick and bittersweet terms with feelings of regret for what I didn't (or couldn't) do during those previous 8 months. On the way back across the country following my ferry ride from the Isle of Arran, I stopped off in Cupar, the place I called home while living in Scotland, to walk around its old stone streets and reminisce about the blue collar, Central Fife town. Most of my days spent here were dark and cold (and perhaps a bit lonely), but on this day the bright blue skies were warm enough to force losing the sweater. Perhaps it was the summer weather, but I couldn't help letting my thoughts drift back to those earliest days in August 2009 and all the sheer excitement I had in fulfilling that lifelong dream of finally making it to Scotland. I remembered that first walk down to the bus stop and the subsequent ride into St Andrews, face pressed on the glass as the links and the town came into view. As I got back into my car to head east down the A-91, it felt just like that moment all over again. After checking into the B&B in town, I did what made most sense and immediately headed straight over to the Jigger to grab a pint and watch the day's final players come in down the Road Hole. A bit of rain arrived and kept the patrons more indoors, but it eventually started to break with a bit of sun trying to come out. With some of the town's buildings catching the glowing sun and what looked like a rainbow maybe starting to form, this felt like a good time to hop the wall and walk back down toward the tee and 16th green. Just as I arrived at the corner of the famous rail sheds where you peek around to check for players teeing off, I first took a look back toward town. What I saw was unexpected and most impressive--the "Grey Auld Toon" was fully aglow and sitting perfectly underneath a fully arched rainbow. I don't necessarily believe in "signs" or that things are always "meant to be," but this felt different. It felt like something, or even someone, speaking to me. Perhaps it was just St Andrews itself simply welcoming me back. I'm not sure, but in that instant, any thoughts of cold nights in Cupar or my bittersweet 2010 farewell from Fife were absolved. I was Home again, and I couldn't have been happier. This year I am trying something new and breaking up this annual review post into three parts. This first one focused on the work that we did both out in the field and back in the office. The second part was about all the other complementing pieces that contributed to the year, from music to places to things experienced. This final segment is back to being all about golf, and it was a very good year for it. In addition to the trip to Scotland noted above, I got to see a number of courses in Central Florida while at the Golf Industry Show, a few courses in Upstate New York while on an RFP visit, and some local Bay Area tracks that I had yet to get to. I learned a lot from some of the places seen, but I also learned at least something from every other new place that I saw. I've taken a lot more time with this final segment than originally expected, adding extra commentary and imagery, which will hopefully give you a better idea of how I view golf architecture. That said, let's get into it and start with the best courses seen this past year. The proper line of play at Streamsong Blue is often unclear and determined by your own abilities and level of agression, and that is what I loved most about it. This is the tee shot on the 8th. Let's start by noting that this list is just a casual indicator of how good I feel a course is. It is a combination of how I think it holds up for a range of players as well as just how much I personally like it. This is why the odd, 12-hole Shiskine sits so high on the list. I think it is a blast to play and sits in an amazing setting, even if players who are a lot better than I am may find parts of it easy or boring (though there's no way they could find the 3rd or 6th holes boring--maybe just weird and "unfair!"). The brackets [ ] indicate a "Doak Scale" rating. It should be understood that I didn't spend the same amount of time on every place and that they were all first time visits. These rankings and ratings are somewhat arbitrary and based on what I saw, understood, and felt about each course. I also get admittedly swayed by firm conditions and links golf in particular; a true links course generally gets boosted by 1 or even 2 "Doak points" whenever I rate it. So don't get too worried if something seems too high or low--these are good golf courses that are largely interchangeable. 1. 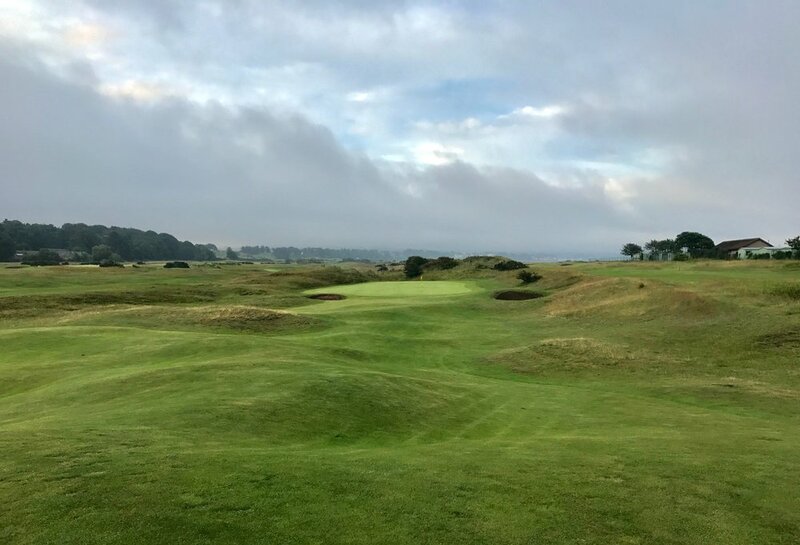 Prestwick GC, Prestwick, Ayrshire, Scotland; Old Tom Morris, with revisions by James Braid and John Stutt*  This place might have been the biggest reason I made the trip back to Scotland, and it did not disappoint. 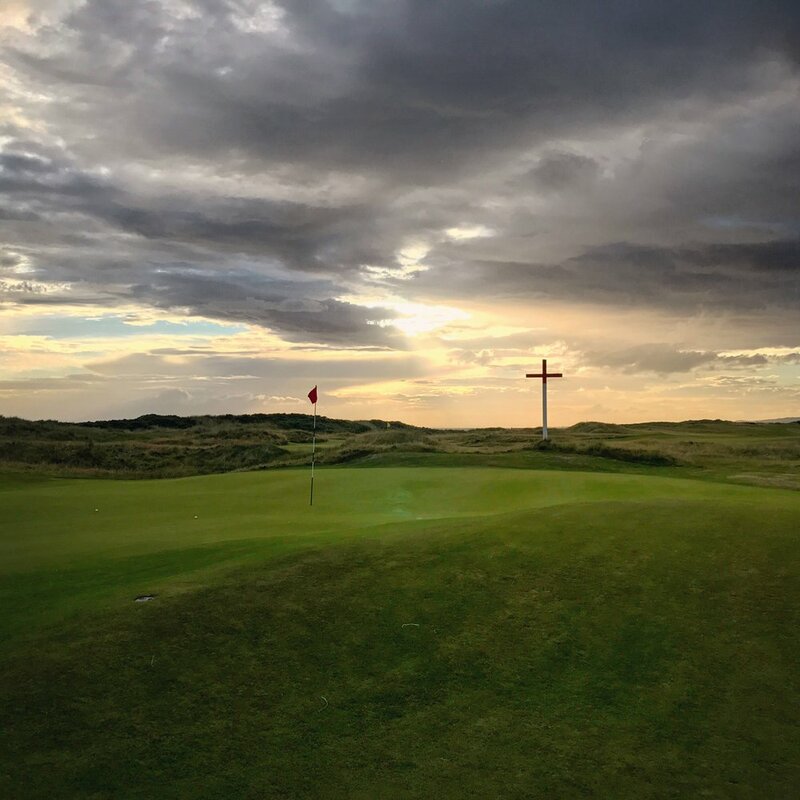 Full of rollercoaster ground shots, heroic carries over blind ridges and dunes, strategic angling, and a set of wild and wacky greens, this is golf at maximum fun. Some criticism gets levied at the "newer" holes out at the far end of the property, which is much flatter and expansive. I however found these holes to present different challenges individually within, and as a whole these longer holes presented a different type of challenge compared to the compact, rollicking, older part of the course. I liked that bit of variety, especially coming at the middle point of the round. 2. Streamsong (Blue), Streamsong/Bowling Green, FL; Tom Doak  Many who have seen or played the Red and Blue courses at Streamsong tend to be neutral or prefer the Red course. I however gravitated toward the Blue. Whereas the strategy at the Red felt more apparent and the holes more framed, the Blue left me constantly asking myself questions on where to play both off the tee and in the fairway. It felt a little like the Old Course in that respect, which I like. I also liked the width, variety, and boldness of some of the greens. I look forward to the next go around and again trying to figure some things out. 3. Streamsong (Red) Streamsong/Bowling Green, FL; Bill Coore & Ben Crenshaw [8/9] Don't let the previous description put down the Red, because I loved this course. There is some great strategic golf here, and the stretch of holes 7-9 is probably the best of such on the property (6 is a great par 3 too). 7 is brilliant in having the entire strategy of the par 5 based on one small spoils mound next to the green, 8 is a tiny par 3 tucked in a grove with a huge and diverse green, and 9 has a vexing, domed green that is a fun challenge to attack. There is an extra level of peace and intimacy found on some of the holes here as well, as the routing for the Red is more on the perimeter of the Red/Blue site. You aren't ever alone though in Central Florida--keep an eye out on that wildlife! Glens Falls is a rollicking Upstate NY Ross course. 4. Glens Falls CC, Queensbury, NY; Donald Ross  A "hidden gem" that has recently been brought more to light, this is probably the best Ross course I've seen to date. (I don't count seeing just a couple of holes at Pinehurst No.2 pre-restoration). There are two main types of landforms on the property here--rollicking hills and valleys and a large but tilted upper plateau. As he usually does, Ross finds a way to route the holes in and out of these two different landscapes. He also finds a way to match the interest of the flatter holes to the more dramatic land with bold bunkering and having some of the most wild and funky green sites I've seen of his. 4, 5, and 6 are particular standouts, and the 13th broke completely the opposite way that I was expecting. 5. Bel-Air, Los Angeles, CA; George Thomas [Inc.; in reconstruction] This was my first time seeing the course, and it solidified the thought that the Thomas LA Triumvirate is a very diverse set amongst itself. Here, it was most impressive what Thomas was able to get out of the routing through its many tight valleys. He used tunnels, a bridge, and even an elevator in addition to perfect placements and offsets of holes sharing valleys. I'm looking forward to seeing the finished work of Tom Doak's team of Eric Iverson, Kye Goalby, and Blake Conant, as they are off to a great start restoring greens, bunkers, and washes and returning the course to its original glory. 6. 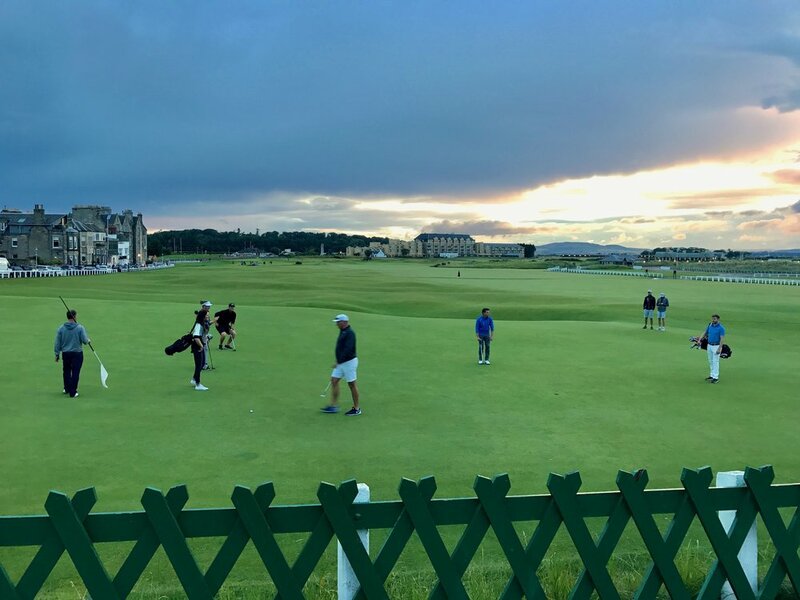 Carnoustie Golf Links (Championship), Carnoustie, Angus, Scotland; James Braid [7/8] I had a chance to walk Carnoustie late one evening and was maybe a bit more impressed than I thought I would be. The greens, starting with the blind, bowled first, are much more bold and interesting than I would have thought. I also really liked the inland part of the course. Some criticize it as "not links." I'd rather praise it for its unique landscape value and change of pace in the middle of the round. 7. Turnberry (Ailsa), Turnberry, Ayrshire, Scotland; Willie Fernie, Restored by Phillip Mackenzie Ross,* Recent modifications by Martin Ebert and Tom Mackenzie [7/8] Turnberry's setting is as impressive and beautiful as they say. It's big, the lighthouse is awesome, and the views out across the shimmering sea toward the Ailsa Craig are like living in a postcard. The land is a bit different from other links though. Instead of the smaller rumples that are more common, the Ailsa plays along big, smooth, sweeping slopes as well as atop a few cliffs. The recent work by Ebert & Mackenzie brings the sea more into view, engages the lighthouse with the all new 9th, and has some good natural contouring on the greens. 8. Shiskine GC, Blackwaterfoot, Arran, Scotland, Willie Park*  The definition of a Doak 7 talks about a course being worth driving 100 miles to play. I didn't quite drive 100 miles to get to Shiskine from Troon, but it did require an hour long ferry ride to the Isle of Arran, which surely counts for something. 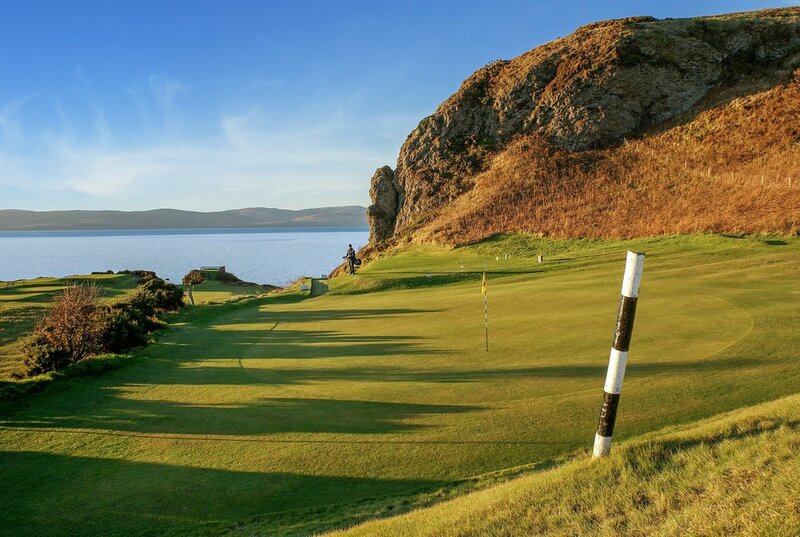 Either way, I would find it worthwhile for any golfer to make the trek out to western Arran and play what will surely be one of the wildest and funkiest golf courses that they've ever encountered. Set on a craggy piece of linksland full of views to the sea, a uniquely striated rock formation, and a distant cave that supposedly once sheltered King Robert the Bruce, Shiskine is a beautiful spot to take in a game or two. Its twelve holes also pack a solid punch and feature some holes that you just don't find anywhere else. The short par 3 3rd "Crow's Nest" plays uphill to a blind green set in a bowl atop a cliff. It is the shortest hole I have ever seen that has an alternate route that gets frequently used, as there is a maintained patch of fairway to the right that allows shorter hitters a chance to get higher and closer to the green before having to inevitably pitch over the gorse and rocks to get to the surface. Holes like this, along with the rollicking, sometimes drivable 6th and the Himalayas 7th, harken back to a simpler time when golf was just an adventure not taken too seriously. Instead of worrying about par numbers or yardage or how "fair" something might be, Shiskine has the feel of a couple bored shepherds knocking rocks around and saying, "hey, why don't we see if we can hit it up over there." I wish that spirited attitude was more common among golfers as well as architects in the way they approach golf design. Shiskine is both a load of fun and a wonderful place to play a game. This is looking back down the par 5 9th hole, which is noted later in the 2nd "Favorite Holes" section. 9. Royal Troon (Old), Troon, Ayrshire, Scotland, Willie Fernie, with modifications by James Braid*  As is the case in most instances of visiting golf courses, the contours at Troon were much more impressive to see in person. In addition to it being very rumply, it moves up and down much more than I had anticipated. The 7th, one of the few wide holes, was neat to see, and the first sight of the Postage Stamp was something to behold. What might be most impressive was the view from some of The Open tees and how far and impossible it seemed to find to find the fairway. The most extreme example of that is the 11th, "Railway," which hits over an endless sea of gorse with out of bounds right. All one can make of the golf hole is the tiny upper half of the white flag on the green waving way out in the distance. Might as well wave your own white flag. Thanks to greenkeeper Scott Corrigan for providing a tour and sharing insights on recent work and their management of the course. 10. Western Gailes, Irvine, Ayrshire, Scotland; Willie Park Jr., with modifications by Fred Hawtree*  As can readily be seen on the entry drive, this is prime links land with golf scale dunes and a variety of texture and color covering them. The front nine plays through the best section of them and includes the best hole on the course, the par 5 6th that twists up and through a set of dunes and finishes with a long skinny green tucked in a dell. There is some cool strategy on the holes at the turn that relate to some long skinny sand ridges, but the middle of the back nine is a bit of a weak stretch before getting to the 17th, which has a blind second shot playing over a dune ridge to a green set before a cross "t" marking post. 11. "Innerleven Links," Lundin and Leven, Fife, Scotland; Old Tom Morris  So, this isn't a course that technically exists in modern times, but I had a chance to walk almost the entirety of the original 18 holes that joined the towns of Leven and Lundin Links. 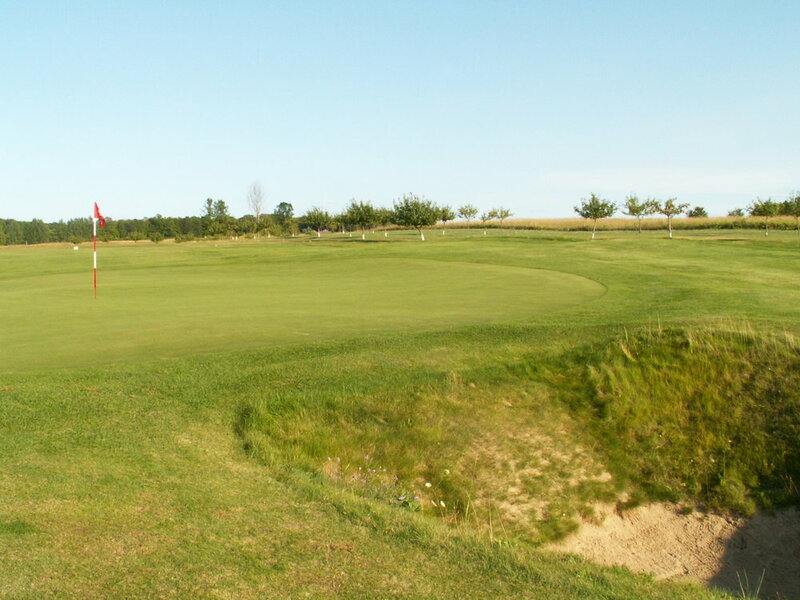 The Lundin side has the more dramatic land and holes like the 16th, which was C.B. MacDonald's inspiration for the "Leven" template, but the Leven side also has some really interesting parts, especially in the first few holes that play at slight angles up and over some really long and straight ridges. It would be great if they offered the old combo course like this to visitors a few days a year. I would definitely try and make the trip for that. 12. Aetna Springs, Pope Valley, CA, Tom Doak Redesign  Undoubtedly now my favorite public course in Northern California, Aetna Springs, which sits at the far Northeast end of wine country and well away from any hustle and bustle, is a study in a golf course maximizing its sense of place. 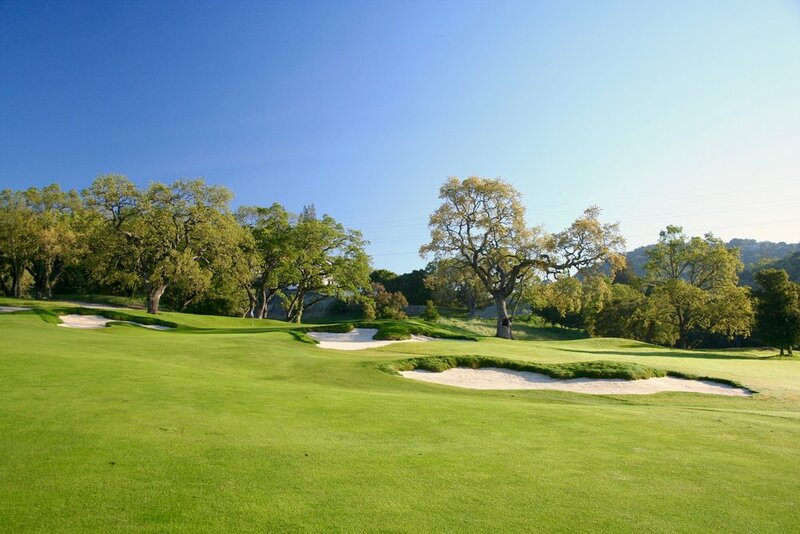 First of all, the 9 holes adhere tightly to the land, cleverly using hills, ancient valley oaks, and natural drainage ditches to dictate strategy and interest. Some interesting greens shaping and timely bunkering round out the quality of the golf. The non golf aspects also "feel" right, as wood was used in any fencing or bridging, and the cart barn is actually and old existing barn that was repurposed. This is a special place that I would recommend making the day trip to play and enjoy. 13. Irvine Golf Club ("Bogside") Irvine, Ayrshire, Scotland, James Braid [6/7] This was a recommendation by Clyde Johnson, and I'm glad that he mentioned it. The first two holes make great use of singular landforms in the fairways. The first has a ridge to try and drive on or over off the very first shot of the day, and the second hole features a big domed mound short of the green to mess with your long second shot. The next 3 holes are a wild set of short par 4s. 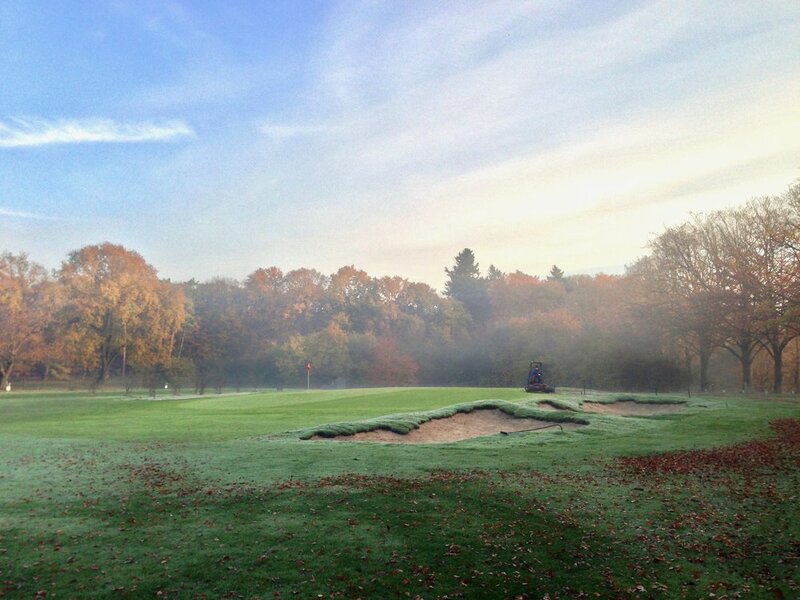 The first plays across a deep valley shorting the green, the second plays to a green perched on a ledge next to an out of bounds wall and railway line, and the 3rd plays to a drivable fallaway green set high on a ridge and fronted by a deep bunker. The rest of the course mixes holes high on the bluff and down low near the bog. The upper holes, which there are more of, are covered in gorse, broom, and heather and afford long views out to the distant sea. The "spectacles" green tucked in a bowl behind two eye-like bunkers and the 17th green, which feels like a green at High Point (Tom Doak's NLE first design), are highlights toward the end of the round. The 4th Hole at Scotscraig may be the precursor to the "Knoll" template. 14. 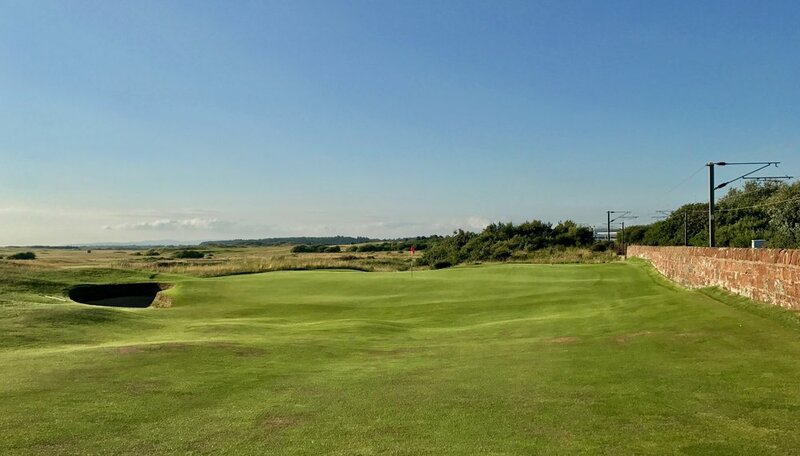 Scotscraig GC, Tayport, Fife, Scotland, James Braid [6/7] Similar to Bogside, Scotscraig's landscape lies somewhere between links and heathland. Not even a mile from the coast, it is a mix of rumpled ground as well as pines and heather. The best land and holes are ironically found on the western part of the property away from the water, which encompasses all of the front nine but only parts of the back. 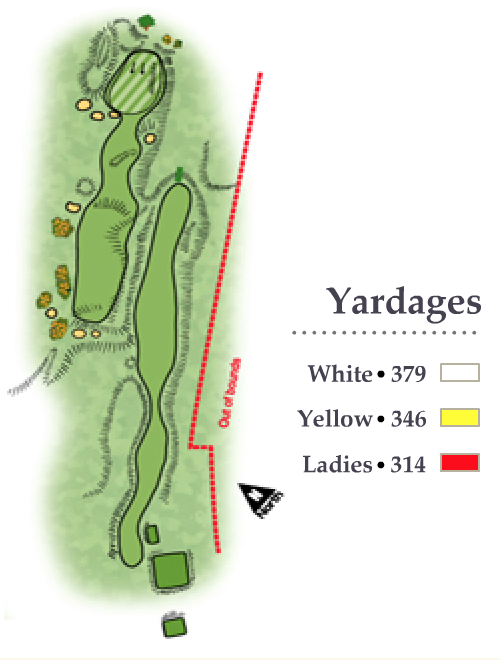 A number of holes are broken up by landforms, rough, and heather and force decisions on where to play your ball. The 4th is one of such and is likely the inspiration for C.B. MacDonald's "Knoll" template. 15. Winter Park GC, Winter Park, FL, Riley Johns and Keith Rhebb Redesign [6/7] Finally, the potential of a municipal course has been properly maximized. Instead of falling in line with the disassociated way that cities typically approach these things, the town of Winter Park took at chance on a couple of young architects and Don Mahaffey's sensible approach to irrigation/construction to build a fun course and not break the bank doing so. There is no way the city can doubt their choice, as Winter Park is a really fun course that is even more tightly knit with the community than ever before. 16. McGregor Links, Wilton, NY, Devereaux Emmet  I rant a bit later on this course in the "Restoration Opportunities" section, but this is a very cool Emmet design that has been encroached upon by perimeter development while also losing some luster within. There are some neat, old school features and greens though, and the course plays over sandy soil. It could be very fun to freshen it up with a restoration, though it won't quite ever be able to get compared to Pine Valley again, which it once was. 17. Saratoga Golf & Polo, Saratoga Springs, NY, R.C.B. Anderson  There is a lot more going on at this Victorian Era 9 holer than first meets the eye. The routing takes you along and over 3 key ridges that run across the property, and the end result is 9 holes that all have a different feel and character to them. Outside of the 1st hole, the greens are very subtle in appearance but contain more overall slope than first appears as well as a bunch of subtle movement. One round and anecdotal evidence says that they are very tough to figure out and putt on. The course and club have a very historic feel with the proximity to downtown Saratoga, and hopefully that will be enhanced in coming years with further restoration efforts. 18. Prestwick St Nicholas, Prestwick, Ayrshire, Scotland John Allan and Charlie Hunter  I had a walk around this place one morning before heading to Troon, and I was pleasantly surprised, especially with the very linksy ground nearer the club house. The holes earlier in the back nine are a bit more benign in character, but there are still many pleasant views to be had out across the Firth of Clyde. Above: Prestwick St Nicholas. Click images to enlarge. 19. World Woods (Pine Barrens), Brooksville, FL, Tom Fazio [6, but probably a 7 if not soggy and overseeded] Disappointing conditions and a bad golf swing are probably clouding my judgment a bit here because there are some cool holes with different playing options. The 15th hole with its alternate fairway up near the green gets most of the attention, but I found the preceding par 5 14th hole to be more interesting and ask more questions, especially for a wider range of players. 20. Shingle Creek, Orlando, FL, Arnold Palmer Design Group Redesign  Thad Layton and Brandon Johnson did a great job making a cart only, resort course fun. They were mostly locked in by the routing and excessive ponds found throughout the original course, but within those limitations, they were able to come up with some fun, varied holes that play to a bold set of interesting greens. Watching (much more skilled) players bounce long shots into the par 5 13th green was a highlight. *Cited from The Confidential Guide to Golf Courses, Volume 1; Doak, Morrissett, Nishijima, and Oliver. 1. St Andrews Links (Old), St Andrews, Fife, Scotland Natural, with modifications by Old Tom Morris and Allan Robertson [11!] Yes, this one goes up to 11. This last visit and playing round reinforced this as my favorite course in the world, and therefore it gets a special designation in the numbers. The playing corridors are so odd, the greens so large, and the rumpled ground so varied that there are multiple ways to play any given shot. 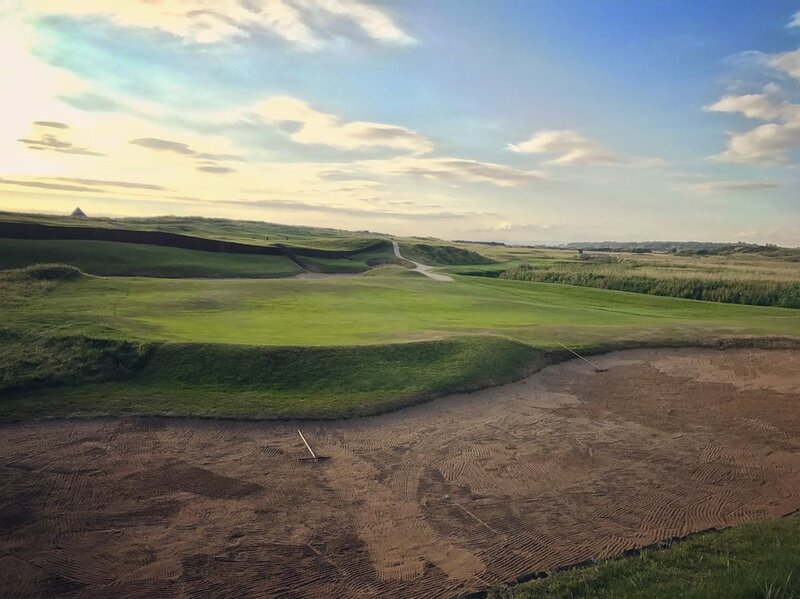 You are constantly thinking and navigating your way around the course, wondering where the next best position is or wondering if it is worth it to take on a bunker or possible funny bounce. The mental engagement required to find your means of play is unlike anything else, and when you imagine a shot and then execute it, there is no greater satisfaction. It can be tough at times to figure out, but not as hard as trying to figure out why there aren't more courses that strive for these ideals. 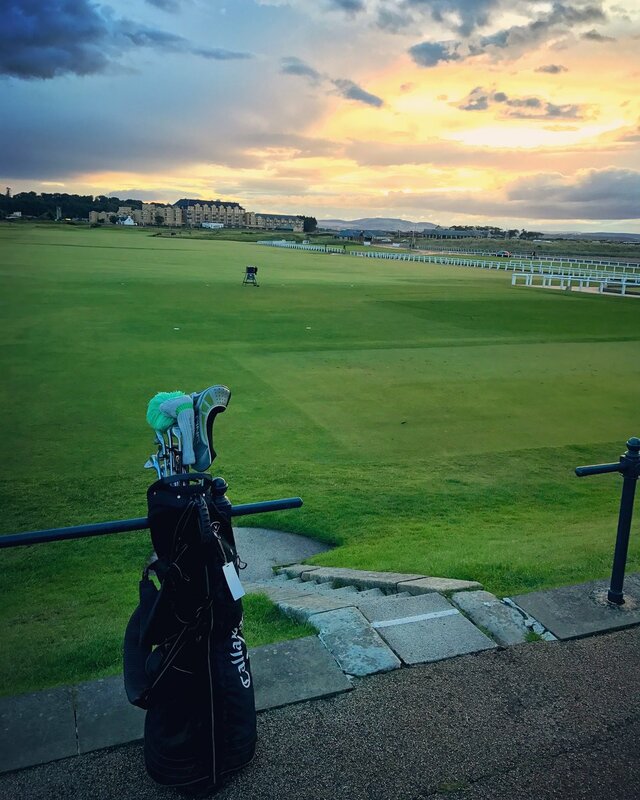 It doesn't get any better than the rumply ground at The Old Course. 2. 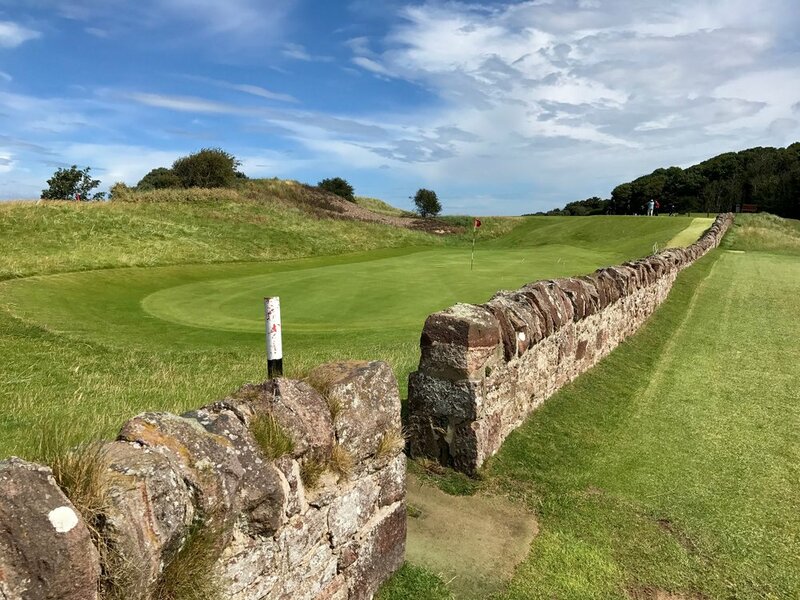 North Berwick GC, North Berwick, East Lothian, Scotland; Evolved from nature with guidance from David Strath, Tom Dunn, and Sir Guy Campbell*  Along the same lines as the Old at St Andrews, North Berwick is loaded with the unusual and encourages you to think your way around its quirks. Even the holes on the far end, which often get criticized as being boring or lesser, have a number of deep bunkers that always seem to be just in the right position. Hitting a light fade on the blind Redan that I thought could be really good and racing up to confirm that it was close indeed was a thrilling highlight. Of course, I proceeded to miss the putt badly. There's a lot of tilt in that thing. 3. 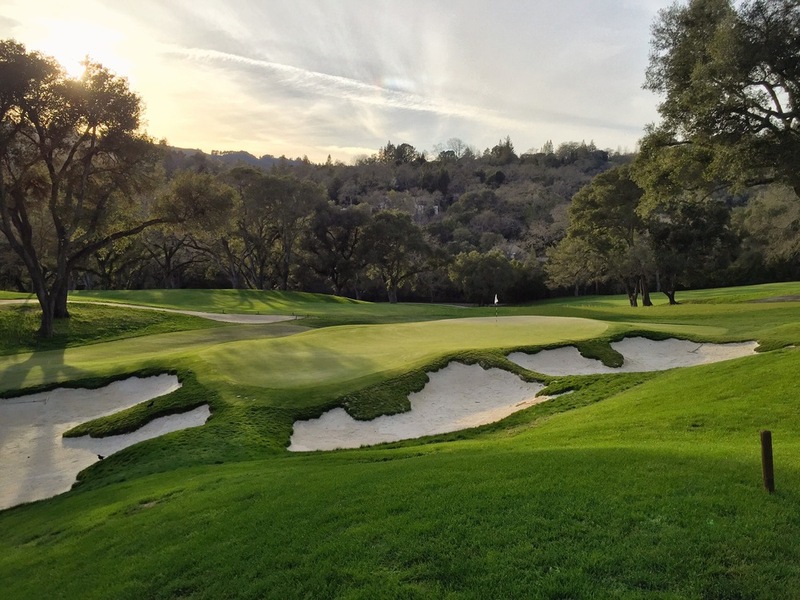 Orinda CC, Orinda, CA; William Watson with modifications by Todd Eckenrode  I'm really not trying to toot the horn of a course I have worked on as recently this year, but the more time I spend out there, the more I am really coming to appreciate the design and routing of this course. Every hole has a feature that really challenges, and it is often based on the land. A prime example is the really long, dogleg left par 5 6th, which may seem long and boring with only one bunker on the left greenside. The tee shot plays downhill at an angle left, with Miner Road and a bunch of oaks guarding the inside corner. It is really important to take on this corner though to position yourself well to be able to get to a ridge much further down the fairway on your second shot. If that ridge cannot be reached, a long blind shot makes getting to the green on your 3rd a very difficult proposition. The right side of the green is protected by a large arm of shortgrass and makes long approaches both fun and difficult. It's a hole that requires bravery and execution as well as skill at the green. Other instances of landforms dictating play appear at the long ninth, which requires reaching a hill to have a chance to reach the green, and the 11th, which needs a long drive to straddle the inside of the dogleg (but not be so greedy as to kick left out of bounds) in order to clear the creek and reach the green on the second shot. I've really appreciated the short game options at OCC since the work has been done there, but I am really coming to love the long game strategies and demands as well. The par 5 3rd at Prestwick challenges both the aerial and ground game while being as unique and fun a hole you will find anywhere. Yes, that is my ball after not taking my own advice to lay safely back of the Cardinal Bunker. 1. Prestwick 3rd "Cardinal" It's a very unusual hole and fits basically no modern conventions. 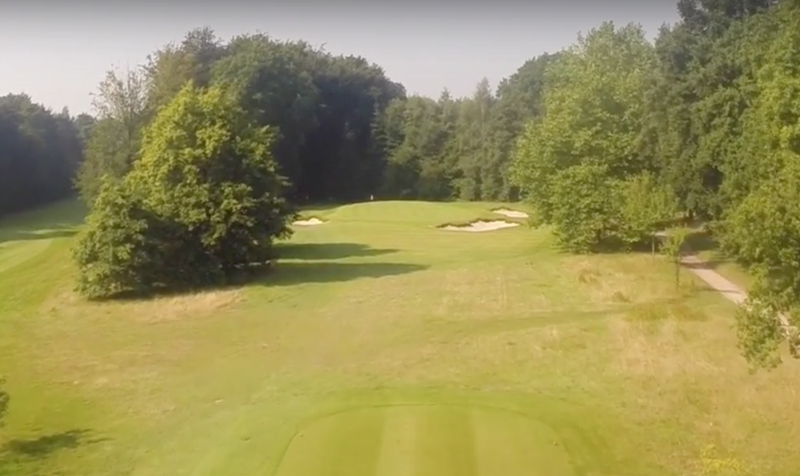 This wild par 5 is all about restraint and positioning off the tee. Let your shot run out too far, and you will end up in the Cardinal Bunker, a massive sand and turf pit guarded on both sides by sleeper walls. The further into Cardinal you venture, the more difficult the recovery. The blind second shot over the Cardinal is all about feel and confidence--how much of the corner do you want to cut off in an effort to get closer to the green? The shot must be well-judged anyway since the next section of fairway is incredibly rumply and tilts away or right to left depending on how aggressive your line is. Those contours will then have to be navigated again en route to the green or if you miss it. It is just a really fun hole to play, and it tests both the aerial and ground games at different times. Not many holes do that. 2. Streamsong (Red) 7th A par 5 designed entirely around a spoils pile next to a long pond, this hole shows just how clever design can be based on a single small feature. If the hole is in the middle of the long skinny green and next to the mound, then it will be important to lay back your second shot as close to the bunkers and pond on the left to set up an angle that allows you to attack. If it is front or back, and you want to be safely aggressive hitting a long shot to the fairway right of the green, then distance judgement is key so as not to be stymied by the mound. The strategy here is just brilliant. 3. Prestwick 1st "Railway" A short par 4 that tests both your decision making and your nerves at the same time. The hole is hard against the out-of-bounds railway wall the entire time, and the fairway pinches in tightly at just over 200 yards. You can play left, but the longer you go the deeper the rough gets and the worse the angle to the green is. The best angle is as close to the wall as you can get, but the further you lay back, the more that same wall is going to be in play on your second shot. No matter what, you will have a testy shot at some point. The closer to the railway, the better the angle into the green. The red flag at the green can just be seen in the center behind a dune. 4. Streamsong (Blue) 13th Tom Doak says he doesn't necessarily take the driver out of your hands, he just makes it a very risky/dumb play to do so. This is certainly evident on the short par 4 13th at Streamsong. The narrow green lies straight away and sits up on a promenade. Very deep bunkers sit left of the green, and a falloff rolls away on the right. The fairway is really wide with a high narrow-ish ridge running down the right side of the fairway, and then everything else falls down low into the massive left side. The best play is a controlled tee shot that finds that upper right section of fairway and lines you up with the green. 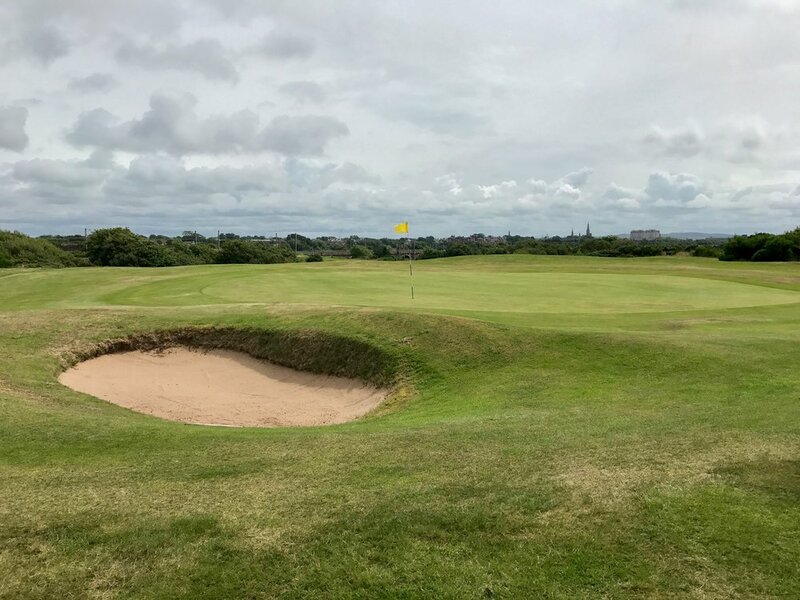 If you play either safely or aggressively down the left, a very difficult second shot will remain to a narrow green guarded in front by deep bunkers and falling away at the rear. It is very easy to make a mess of this little hole, especially if you aren't paying attention. 5. Western Gailes 6th "Lappock" This par 5 is no doubt the star of Western Gailes as it twists up, over, through, and around a dune ridge to a green offset left in a dell. The goal is to try and hit two good shots to clear the ridge and set up a short 3rd shot with a view of the green. The short grass slopes at the right of the green can either help or hurt you depending if you land right on them or if you intentionally play off them on the ground. Its a great hole based entirely on landforms. 6. Carnoustie 16th This long par 3 has a multi-leveled, propped up green that sheds balls away to its short grass surrounds. If a perfect running tee shot isn't played, then your short game will be put to a great test. 7. Prestwick 13th "Sea Headrig" This is sort of the par 4 version of Carnoustie's 16th, where long shots into a wild green are likely to be shed away. Even if the green can't be reached in two though, it is still very hard to get close or even on in 3. The green has a subtle knob guarding it's upper plateau, and everything slightly left will roll back down the 7-8 foot false front on the left half of the green. It is a very fun and challenging ground game situation on and around this green. 8. Turnberry 10th The new 9th has the lighthouse, but this is a better hole. The famous and recently redone donut bunker confounds the second shot, often forcing decision to lay up short of it or carry it over for a short pitch 3rd. The setting is incredible as well, with the rocky coast to the left the whole time as well as a horizon green set against the sea. Turnberry was often criticized for the course not matching the dramatic setting, but after the renovation work by Mackenzie and Ebert, the 10th hole is certainly worthy. 9. Streamsong (Blue) 5th With a long view out to the distant hotel, this extremely deep (70 yards) green also falls away from you, especially back right where it drops down well below the right side bunker. I recommend playing the ground and allowing for some rollout. I took off a couple of clubs and played a 3 quarter swing, but Kyle stepped onto the tee and played a putter. That looked like enough fun that I too then had to play a putter and try it out. I need to get back and see what the hole is like when it is down in the back right. 10. Streamsong (Red) 8th I don't know why exactly I am so fascinated with the huge greens on short par 3s at Streamsong, but I am. This one has 50 yard long, angled green from the regular tees and depending on the hole location is either a really short little par 3 or just a moderately short one. I didn't realize all of the left portion of green existed at first, probably because it ran against intuition to have green over there. I think it is really cool that it is there though, and I would love to get to play to all the different pin positions on this artfully built green. The ramped green on the "Alps" at Prestwick was my favorite part of this great famous hole. 1. Leven 2nd My favorite hole of both the Lundin and Leven courses, this hole takes wonderful advantage of an angled linear dune formation to maximize strategy. There are two options off the tee--play safely low and right and have a blind second shot over the long ridge, or take on a pair of bunkers and a facing slope to get a straight and visible shot at the green, which is long and falling away slightly. There is a real reward in terms of both angle and comfort by taking on the aggressive line down the left. Brilliant use of the land to create strategy. 2. Shiskine 6th As much as I've raved about the "Crow's Nest," I'm going with the 6th at Shiskine as my favorite of the course. It is drivable if you are long and aggressive, but trouble awaits with a pull or a push. The contours of the hole are the most rumpled on the course, and the green sits blindly down in a dell. Only longer drives provide full visibility, providing extra incentive to get greedy with the big stick. I'd love to stand back on the ridge behind the green and watch better players shots bounce and carom their way toward the green. 3. McGregor Links 3rd The long par 3 with a well-bunkered diagonal ridge fronting the green forces the shorter hitter to make decisions. Clear the bunkers on the right to gain a view, or play down and left safely but be blind? The saddle green sits perfectly on the ground and must be difficult to hold for most long shots. 4. Shiskine 3rd "Crows Nest" I don't usually love do-or-die par 3s this much, but this one is just so cool and unusual. Plus, it has alternate routes short as well as halfway up out to the right. Eventually though, you will have to clear some craggy rock and gorse if you are ever to find the surface. It's a throwback to a time when golf was more adventurous and worries about stroke play didn't exist. 5. Irvine Bogside 3rd, 4th, and 5th I'm looping all these short par 4s together because I couldn't pick a favorite. The 3rd has a narrow green defended by a (mowed) deep gully fronting it. The 4th has a green propped up hard against the railway wall, and the 5th is short enough to tempt even my length to try and clear the giant ridge and bunker in attempt to reach the green. Be careful though--everything after the top of the ridge, including the green, falls away from you. 6. Shiskine 9th The only par 5 on the course is a formidable one. If a tee shot is not well struck, it will be difficult to carry the deep valley and burn on the second shot. If laying up, a choice has to be made with regard to where exactly to do so. Stay further back but higher up, or flirt with the burn for a shorter but more uphill 3rd shot. A large left to right falloff splits the elevated green in front and makes long shots into it very difficult. Either a sharp draw has to be played into the slope, or a moderate fade has to be played off the plateau to the left to reach the naturally saddled green. 7. Aetna Springs 7th A ridiculously simple but effective concept on this very wide dogleg right hole. Hug the big right-to-left sloping hill and oaks on the right in order to cut distance and get and open angle into the green, which is defended by two front left bunkers but helped by a slope on the right. Any conservative or pulled tee shots will kick down into the low left side of the fairway and be largely blocked out with their long 2nd into the green. Extra credit goes to this hole for how natural it feels and how well it ties into the pastoral plain across the road from the course. 8. Aetna Springs 3rd Strategy again is dictated working backwards from the green, which has a front right kicker slope that feeds balls left and away toward a bunker or lateral hazard behind the green. The play off the tee is down the left, which requires taking on a bunker and deep rough down the left. The green itself is in a really nice spot with views across the main part of the course and a peek up into the oak-laden gully where the little par 3 4th hole lies. 9. McGregor Links 7th If it weren't for encroaching housing, the tumbling double dogleg 6th would be in this spot on the list. Instead, it's the long par 4 7th, which plays over a bunch of rumply, links-like ground itself and is guarded by numerous hazards along the way to make it interesting for both the long and short hitter. Not too many holes do that. The land at McGregor Links tumbles as if it were a British seaside links. This is the view from the green looking back down the hole, which doesn't show the numerous center line hazards that are to also be dealt with along the way. 10. Lundin Links 16th The inspiration for C.B. MacDonald's "Leven" template is actually on the Lundin side of the towns' connecting links. The hole is quite short, but control of the tee shot is still important. A player must negotiate the burn, rough, and bunkers down the right side to gain the ideal angle into the green, which is tucked behind a dune on the left. A further evaluation of the hole's intricacies can be found here. The green on Sea Headrig at Prestwick is one of many strongly contoured but very fun greens encountered at Prestwick. 1. Prestwick The most varied and severe set witnessed in 2017, Prestwick might also be the wildest set of links greens in all of Scotland. If you can forget about any sort of so called "conventions" in modern golf design, you will have a blast attacking and putting on these surfaces, which also happen to fit their setting beautifully. 2. Streamsong (Blue) A Doak course is always going to have interesting greens, and these are no exception. Their overall bolder contours and dictation upon strategy are what gave me the slight nod over the neighboring Red. 3. Glens Falls Donald Ross funk and variety on a level I haven't quite seen yet. The stretch of holes 4-6 is a highlight, as is the severely canted 8th, which is a supposedly controversial green that I see no reason to alter or soften. 4. Streamsong (Red) These greens have a number of slight rolls and bumps in them that make them very interesting for both putting and approaching. The surfaces on the par 3s are a lot bolder with the tiered 6th tucked behind a dune, the large and snaking 8th that can play wildly different day to day, the 14th sitting on a plateau with bunkers eating into it, and the giant rollercoaster Biarritz at the 16th. The 9th (a par 4) might have been my favorite of all though. Its crowned surface had a naturally random feel and seemed very tough to score low on while not being so extreme that you could make a big mess of it. 5. Turnberry (Ailsa) I couldn't quite figure out the story if all the greens at the Ailsa had been redone or just some of them. Even on ones that seemed like they weren't part of the redesign plan, it looked like there were lines from re-sodding. Either way it is probably a testament to the work that it is hard to tell which is which, and there is some nice, natural-appearing contouring throughout. 6. Carnoustie These were a lot more interesting and bold than I imagined, though many have a feeling of being reconstructed 20-30 years ago or so. (Someone with more information please feel free to reach out and provide the real story). After seeing the difficult 16th in person and watching balls get shed away from its surface, I am really excited and interested in seeing the how the pros attack it in this coming Open Championship. I have a feeling I will be even more impressed with their abilities. 7. Shingle Creek There are some interesting and bold greens out here, which is what was needed to bring interest to a project working within the limited corridors of an old Central Florida resort course. 8. Winter Park The tight corridors of the Winter Park course meant that there was little room to create strategy and interest through bunker placement. It would have to come at the greens, which is good anyway since this is a course meant for all, and contoured short grass is the great equalizer in golf design. 9. Aetna Springs These aren't the craziest of Doak greens, but they fit the landscape well and still provide interest and strategy through tilts and simple moves. 10. Saratoga Golf & Polo This is a really subtle but challenging set of greens. Many have a slight crown, and a number have strong tilts that are difficult to detect upon first glance. They also have a lot of slight interior movement that is tough to read. Glens Falls pro Tom Haggerty says he always struggles with the greens at Golf & Polo, and he isn't the only one I've heard say that. Irvine Bogside also had a couple of really cool greens. The one that stood out most to me was this saddle green at the 17th. It reminds me a lot of some of the greens at High Pointe the way it sweeps and fits with the land. The Red Course's bunkering is varied and beautiful in how it fits the unique landscape of Streamsong. Irvine Bogside had the fastest and driest conditions of all the courses I played last year. And no wonder--they don't irrigate the fairways! A muni with great conditions?! Winter Park has it with wall-to-wall short bermudagrass and greens that roll smoothly at a proper speed. 1. Day 1 at the Renaissance Cup at Stoatin Brae. I partnered up with Jay Blasi again this Ren Cup, and the second round match against Riley Johns and Keith Rhebb took place during the solar eclipse. Thankfully, the clouds parted enough for us to fully enjoy one of the weirdest settings/lightings that we'll ever play golf in. I also don't think I've had a round where I laughed that much. Re-match next eclipse? 2. A combination of my two go-rounds at Prestwick. The first was with Matthew Galloway, currently on the bag for Michelle Wie on the LPGA, and the second was a solitary round where I spent as much time trying different shots and taking photos as I did playing actual golf. And the weather was fantastic--calm, warm, and full of ever-changing lighting. It was also extra cool this time to linger around the fairly crowded 18th green afterward and watch the rest of play come in, which was mostly LPGA players and their caddies who were all in town that week for the Women's British Open down the road at Kingsbarns. In a role reversal, Sandra Gal carried the bag for her caddie, which was pretty cool to see. Very good vibes and smiles all around, and some pretty loud roars and laughs echoing off the old buildings as putts were made or almost made. 4. 36 with Kyle Harris at Streamsong. This couldn't have been much of a better introduction to a set of courses I had wanted to see for a long time. One, we got out early and played with no interruptions. Two, I got to learn about both construction of the courses and their current maintenance practices from the guy who is there every day taking care of it. Three, Kyle is a very smart guy and fun to play a round with. 5. 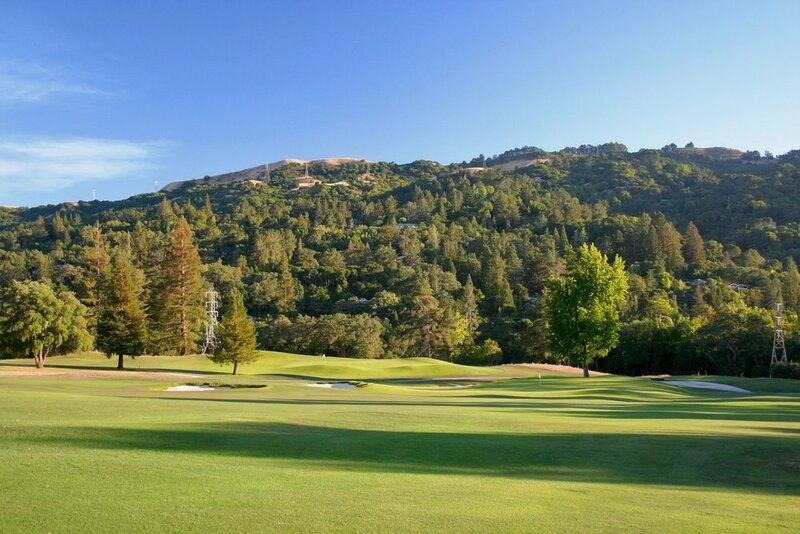 Taking a day off after a busy couple weeks traveling and finishing an RFP to drive up to Aetna Springs to play a couple of peaceful 9 hole rounds, reconnecting with the game I love. The quiet countryside is pure bliss, and the golf is a load of fun. If this was only a half hour from my house instead of an hour and a half, I would be much better about making time to play golf. 6. North Berwick with local Edinburgh-based member Michael Graham. With a pleasant day, sporty breeze, and pretty close to even action on our match, this was a perfect capper to my whirlwind trip. 7. My second round at the 12 hole Shiskine. It started wet, but it cleared up by the time I got to the best part of the course--the 3rd to the 7th. The 4th green is where the bizarre, straight-lined cliff near the far end of the golf course first comes into view. When I arrived there, the rain and breeze had completely died, and no one else was around. Very cool moment in time. 8. An isolated round with the last tee time at Western Gailes. The course was basically mine, especially as I took my time checking it out. 9. Again having the course mostly to myself at Irvine Bogside and its pleasant heath/links landscape. 10. Hosting friends out at Orinda for a game and tour. I had design/build architect Riley Johns out in February, and Andy Johnson of The Fried Egg came out in November, where we might have spent more time playing with his new drone than actually golfing. H.M. Walking Winter Park with a huge group including Don Mahaffey, Adam Lawrence, Brian Palmer, Joe Hancock, Guy Cipriano, and more; Quiet early evening round at Scotscraig. 1. Having lunch and a lengthy chat about old-school greenkeeping with Gordon Irvine and Alistair Philp. If you ever want to take a step back from the industrialization of golf and get back to the basics--like, Old Tom Morris basics--then these are the guys to talk to. I felt quite refreshed after our talk. 2. The non-golf portion of the Renaissance Cup is quite possibly just as fun as the golf itself. Always fun to catch up with old friends and meet some new ones. 1. The first hole and green at Prestwick lying hard against the wall and railway. The rest of the hole plays perfectly off of this and dares a player to stay as close as they can to the out of bounds wall. It might be the shortest, most terrifying, and strategic opening hole there is. 2. The underground rope pulley system at the Himalayas hole at Shiskine to indicate whether play is clear. This is the most original solution I've seen for blindness yet. You push it down when you walk up to the green to turn the "hold" signal up, and the connected rope then pulls up the other lever located on the green's walkoff point 40 yards away. When you walk off, push the other lever down, and it pulls the original lever back up to the "all clear" position. Very clever. 4. Clubhouse and portal-like stairs to the first tee at Dollar. 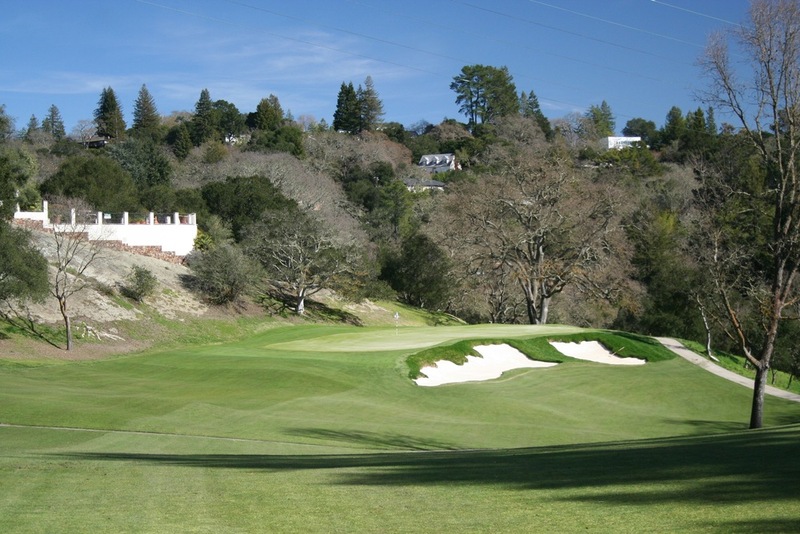 The course is up on a hill, but the clubhouse sits down in the urban fabric of the town. So, to get up to the course, you go through a gate and concrete walkway with stairs reach the first tee as well as get back from the 18th green. You would never realize there was a golf course here just driving by. The clubhouse and walkway to the first tee at Dollar is as urban as I've ever seen. 6. The Cardinal Bunker at Prestwick. The size is impressive, the sleepers are cool, and the strategy is sound. But what really makes this bunker cool is the way that it also ties into the 16th green and 17th tees. 7. 4th green against the railway wall, Irvine Bogside. A bunch of greens at different courses along the Ayrshire coast touch up against this same railway wall, but this one might be the closest to it. I especially know from being right up against it and having the serious decision of whether or not to play the ricochet shot. Bank shot, left handed, or way behind stance? The 4th green at Bogside gets closer to the railway wall than any other hole (that I know of) in Ayrshire. 8. The 2nd Hole, "Brae," at Dollar. It's 79 yards from the member's tee but about 60 feet uphill over a cliff. 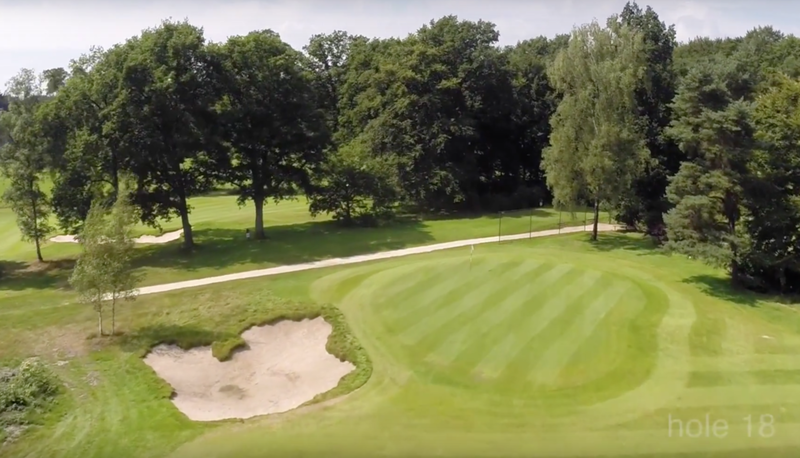 It's an impossible hole for some golfers, unfortunately, but for everyone else it is a bit of wacky fun that gets the golfer up to the big field where the rest of the course lies. 9. Marking systems for blindness at Prestwick. On the par 3 Himalayas, color coded disks scattered on the dune relate to the color of the tee markers you are playing. On the Alps Hole, a rotating left-right-center sign at the tee lets you know which of the 3 posts to generally aim over on your second shot. 10. The bridge crossing Round Pond to reach the first tee at Glens Falls. This is both a clever routing solution by Ross to increase the interest of the first hole as well as just a neat way to engage the water and start the round. 2. Shiskine This is a beautiful, simple logo that uses a 2 divided by a flagstick, which also acts as a "1," designating the unique number of holes at the course, which is 12. S,G,T,C are interlaced around the 2 and represent "Shiskine Golf and Tennis Club." 3. Western Gailes According to the Club's history section on its website, this unique logo is taken from a small portion the Portland Coat of Arms after the Duke of Portland leased the Club its land in 1920. 4. Glens Falls This logo falls firmly in the generally overused "crest" category, but it is a good example of how to highlight the key characteristics of a club or site. The upper left has the standard crossed club and flag, but the lower right is blue with an evergreen tree and waves depicting water, which is the famous scene at the first tee box. I can't verify the intent of this or not, but the diagonal bisector of the two areas looks like the railing on the bridge to get to the first tee. Pretty cool and well done if so. 5. Sequoyah It is simply a sequoia tree with the founding date and name at the bottom, and I really like the font of both. There can be a lot of beauty in simplicity, especially when it comes to logos. Logos of the year. The McGregor logo (top right) is typically shown without text, which makes it even better to me. 1. St Andrews Old (!!!) 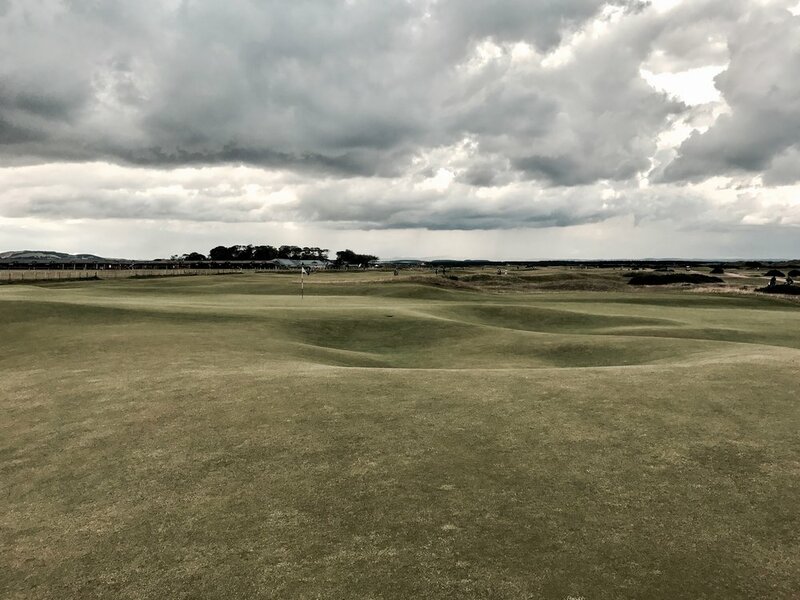 If there was one thing disappointing about my return to the Home of Golf, it was confirmation of how much I disliked the recent changes made to the Old Course. The bunkers on the second hole ruin one of the greatest natural green sites in the world, the left arm of the Road Bunker is way too bulky and aesthetically awkward, the 11th green certainly felt different in the corner, and the tinkering with micro contours around different greens is excessive and unnecessary. The greenkeepers, as I expected, did a finely crafted job, but it shouldn't have been one that they were tasked with in the first place. Fortunately there is a lot of documentation of the course (including hundreds of my own photos and a laser survey before the work happened), so hopefully one day it can all be put back to place. This would be a dream of mine to grab a sandpro and rake and help bring it back. 2. McGregor Links (Even despite the housing encroachment issue) This sandy site and course was once compared to Pine Valley, and the pictures of its original incarnation are truly impressive. Unfortunately, housing developments have encroached upon its edges, especially at the double dogleg 6th, and tree overgrowth has tightened play and taken away all of the great long range views. That said, there is still a lot of opportunity to return Emmet's greens back to original size, restore bunkering, thin out some trees, and reintroduce some sandy scrub throughout the course. It won't ever be what it was, but it could still be pretty special. 3. Plum Hollow Originally laid out by Hugh Alison, this course plays over a series of deep valleys formed by the Rouge River and a couple of tributaries. The sequencing and interaction with these valleys is very good, but all the bunkers and seemingly some greens have been tinkered with in more recent decades, taking away some of the Golden Age feel of the 1921 course. Some TLC, tree removal, and bunker work could really do some wonders for both the playing quality and aesthetics of a course that once hosted the PGA Championship. 4. 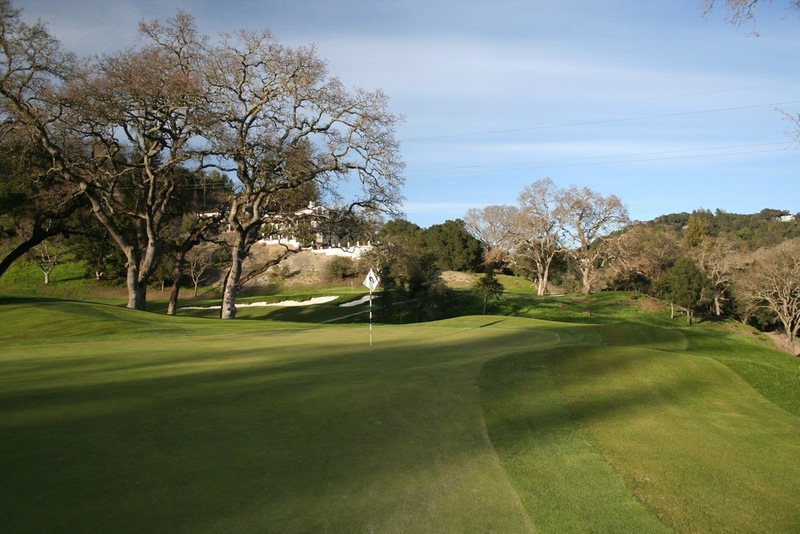 Sonoma Much like Plum Hollow, this is a Golden Age course that has been tinkered with in more modern times. This would also be a fun one to restore bunkers, analyze the greens, widen corridors, and remove some trees to bring back great distant views. 5. Lake Chabot I don't know what it was originally like exactly and haven't seen any documentation, but surely it could use a touchup. Greens are strangely tiny, and bunkers are irrelevant. Though when a property moves up and down as much as Chabot does, you hardly need bunkers anyway. Always take the opportunity to cross the Swilcan Bridge. Thank you everyone for reading and being interested--hopefully some of this inspires you to tee it up in some new places. Feel free to get in touch with any questions or comments or if you want to get together on a site or the golf course. You can always find me at hochsteindesign@gmail.com. The 6000 year old standing stones of the Machrie Moor were one of the coolest things I encountered this year. The sheep were fun to hangout with, too. 1. St Andrews, Scotland The Home of Golf might be my favorite place in the world, and it was amazing to return after being away for 7 years. This was my first time there in summer, so it was fun to mingle and connect with other travelers from around the world, including the caddies from the LPGA tour and some golfers who just happened to be from the area that I grew up in Michigan. 2. Edinburgh, Scotland Edinburgh is a great old city and also one of my favorite places. In many parts, it feels like stepping into a movie or storybook with its old stone alleyways, church spires, and Castle set up on a giant outcropping. This time around I had the fortune of checking out the Bruntsfield Links, one of the earliest commons where golf was played. Today it is a park as well as a pitch and putt still enjoyed by many people. 3. Saratoga Springs, NY The famous horse racing town north of Albany is full of charm with myriad shops, restaurants, and bars. I'd love to come back and check out a race sometime, as the track and grandstand look as if from a different era. 4. Huntington Beach, CA I usually like to stay in Huntington Beach while working at Santa Ana, as the beach, restaurants, and Tuesday Market Night provide fun options for the evenings. 5. (Tie) Sylva, NC An old mill town 45 minutes west of Asheville, this is a pretty cool enclave in southern Appalachia. The vibe of the place is very much about enjoying the outdoors, and Innovation Brewing, which is set right on top of the river running through town, is a great spot to try a wide variety of experimental beers as well as enjoy live music. 5. (Tie) Lakeland, FL Lakeland has a nice downtown with an older feel not found much around Florida. The lakes and ponds nearby add another element and provide for some nice walks. Redlands, CA - Steak Colorado Burrito from El Burrito. Fresh home-made tortillas are the way to be. This is a bit lighter this year, as I made the most of my time on the road this year, spending it on the job site, golf course, or meeting place. There was little time for extracurricular sight-seeing, but I managed to squeeze in a few pretty good ones. 1. The Machrie Moor Standing Stones. Shiskine, Arran, Scotland. This was cool beyond words. The trail to get here goes through a few sheep farms and up and over a hill and through the ever-increasing moorland. When I got to a grassy opening, there were some sheep grazing in the middle of some ancient stones embedded into the earth. This was cool in itself, but when I looked a bit further past a couple of trees and into the open moor, I could see the giant stones out there, isolated and sticking straight up in the vast landscape. Just then, the sun dipped beneath the clouds, first lighting up the 6000 year old stones and then forming a rainbow over top of them, as if on cue. Amazing. 2. The Rose Bowl. Pasadena, CA. Go ahead and insert your joke about Michigan football here, but I had never been, so I thought I would make a pit stop on the way to Redlands and check it out. What a cool setting, and a very lively active neighborhood as well with hundreds of people walking, jogging, and biking. The color and texture of Bok Tower is much more impressive when viewed up close. 3. Bok Tower and Gardens. Lake Wales, FL. On my way from Lakeland to Orlando, I checked out some old public courses at Kyle Harris's suggestion and hoped to sneak a peak at Mountain Lake, the Raynor course restored by Brian Silva. I found out it was totally gated, so I decided to go check out the Bok Tower and Gardens instead. That turned out to be a good decision. The gardens are a neat piece of landscape architecture, and the tower, which sits on one of the highest points in Florida, is much more colorful and elegant when viewed up close, especially in the late day golden light. Anyone in this business who spends a lot of time in a machine out in the field knows how valuable a companion the art of music is. It is easy as well to draw parallels between the two, a great golf course acting as a great album with the component pieces--the holes and songs--standing individually while contributing to the work as a whole. This year was a return to some really great music discovery. Like favorite courses and holes you will see in Part 3, many of these albums and songs below could be interchangeable, but they give a general idea of what I really loved and had resonate within me. Here are some of my favorites while making it all happen from the dozer seat or, moreso this year, the office chair or car/plane/train seat. Since I have participated on one of these, I am refraining from numerical rankings this year and instead an alphabetic listing. And a special shoutout to the "Club Pro Guy" episode on No Laying Up. Anyone who lived through the heart of late 90s/early 00s golf needs to listen to this. A hockey arena, first and foremost. 1. The Final Game at Joe Louis Arena, spent with my dad. Anyone who knows me is aware that I am a die-hard Red Wings fan, even as their level of play slides downward. I was also a die-hard fan of their long-time home, Joe Louis Arena. As a kid who instantly fell in love with the Red Wings once I started watching in 1994, I was fascinated with their arena. The noise of the crowd, the white steel bars that gave it a ware-house-y feel, the endless banners, the blue rafters, the echoing voice of P.A. Budd Lynch, and the seats that went uninterrupted all the way to the top. It was pure hockey and pure sport. As other arenas around the league and other sports changed, ditching their older and more intimate digs for more spacious and expensive places full of "comfort and amenities," I began to love The Joe even more. I recognized it as a dying breed of stadia where going to the game and focusing on the action was the reason for attending. I liken it to golf and the shift away from simple, golf-only courses toward the "country club for a day" experience, which is more costly and often loses sight of the golf at hand. When I go to play golf, I just want to play golf. When I go to a hockey game, I want to focus on the hockey game. Besides the long bathroom and beer lines (which provided an experience unto itself, as it encouraged lively banter among the fans), The Joe was all about the main purpose of the day--watching hockey. Close seats with great sightlines, few frills, hockey-only decor, and a unique acoustic that would grow and wane unlike any other are what made Joe Louis Arena special. There were many detractors of the place throughout recent years, calling it a "dump" and whatever else. But as the strong attendance and hoopla of the final season came to its climax on the final weekend and final night, the love that people had for this place and what the Red Wings achieved in it was utterly palpable. People spent all day around the arena that Sunday and mingled inside many hours before puck drop. It had the energy of a Stanley Cup Final game. This aspect is maybe what made me most emotional--the connection I had to the collective fanbase and their shared emotions on that day. And spending it all with my dad, whom I attended more games with than anyone, made it that much more special. It's a night I will never forget. Thanks for the memories, Joe. 2. Stopping off in Cupar, the town I lived in while at Elmwood, on my way to St Andrews. Not everything was positive while I lived there, especially as I left it. 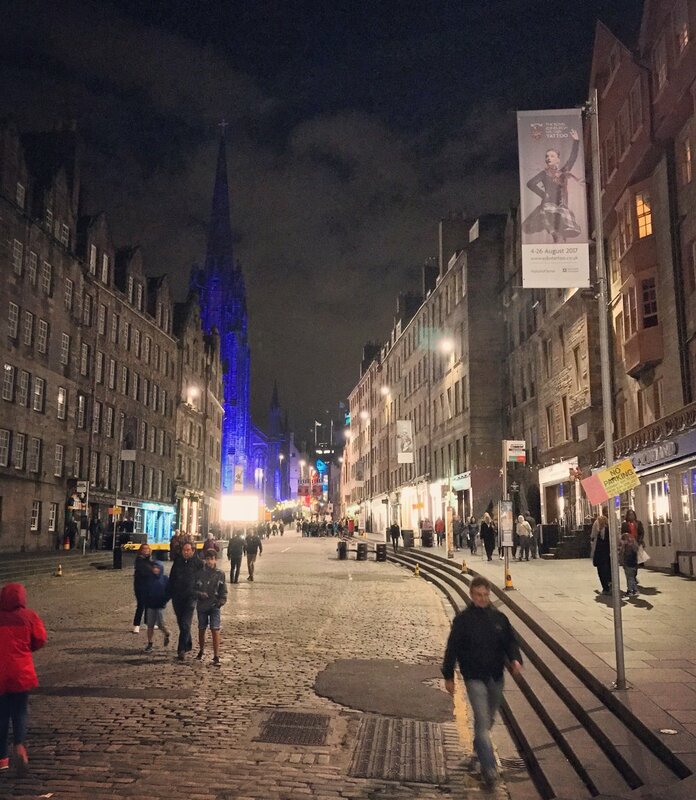 So it was great to take a long, sunny walk around and through all the streets and alleys, remember all the good things that I loved about this old stone-laden European town, and get a fish supper from Libo's, which is still my favorite chip shop in all of Scotland. Stop off at Libo's next time going through Cupar and get the fish or the haggis. Or both. I'd go with both. 4. Seeing the Grand Canyon for the first time with my wife. Much like golf courses, you really need to see it in person to appreciate this awe-striking space. We caught the last bit of sunset upon arrival, and the colors were unreal. Reds, oranges, purples, blues, and dark greens are all part of the palette in late day light. We awoke before sunrise to see the same thing in reverse direction, and this might have been an even better experience as we saw more elk on our walk out than people. Just like great golf courses, the Grand Canyon is much more impressive to see in person. Also more fun when your partner in exploration gets to join you. 5. Seeing the Warriors bring home the Title in person with my father-in-law. Yes, I am a Warriors fan, and yes I have no shame about that. As someone who didn't care much about the Pistons or NBA in general when moving west 7 years ago, the "Dubs" were really the only team that had a shot at converting my fandom from Michigan-based teams. They did just that, as I attended a number of games with my father-in-law, who has been a long-time season ticket holder. My two main knocks on the NBA were that the crowds were fake and bandwagon-y and that nobody played a team style of basketball. Well, Oracle Arena has been a rocking atmosphere since well before the arrival of the Splash Brothers, and Steve Kerr has them playing a pass-first style of basketball that is an absolute joy to watch. Even if I hadn't moved to the Bay Area, this team would still be getting my attention and love for the way that they play as a unit. Seeing it all come together the past couple of years has been a lot of fun, and the battles with Lebron and the Ohio-based Cavaliers have fueled the intensity. After seeing game 7 blown in person the year before and having nightmare flashbacks of Ohio State fans celebrating in Michigan Stadium, watching the clincher over the Cavs and end of maybe the most dominant postseason run ever was incredibly fun and satisfying. It was the first championship of the major sports that I've even seen won live by a team I've supported. I certainly hope to do it again sometime. Hole 3 at Redlands just after sand installation. This was a bit of a different year for us at Hochstein Design. Instead of taking on a number of longer term projects helping out shaping, we spent more time working on potential leads to projects of our own, creating practice area schematic designs for a local course, and participating in some fun features on other great golf design sites like American Golfer, The Fried Egg, and Geeked on Golf. We also took our first ever trip to the Golf Industry Show in Orlando, which provided the opportunity to catch up with friends, meet new ones, and put faces to the social media name. There were still a few fun things that we got to work on in the dirt though, including a spring trip to the Carolina mountains for Thad Layton and APDC, a week trying out artificial greens construction near Baltimore with Back Nine Greens, detailing bunkers and natural areas at Orinda, and return trips to both Redlands and Santa Ana for Todd Eckenrode and Jay Blasi, respectively. Here are some of my favorite things we got to work on, both out in the field and back in the office. 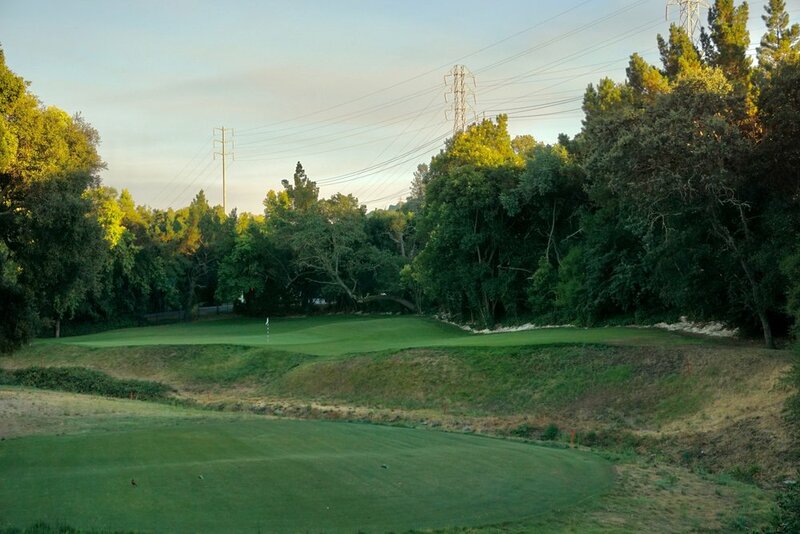 We had the opportunity this summer to go back and touch up this natural area on the 15th at Orinda, which used to be an ivy-covered fence and jungle. 1. Hole 3 at Redlands It's hard to single out one feature here, as I loved working on every part of this reverse Redan-ish par 3. For one, I love working in a spot that has a beautiful view, and this one does, especially after tree removal restored those views. The hole itself is very cool as well. Based on an aerial that we had, architect Todd Eckenrode and I had the opportunity to restore the very large pair of angled MacKenzie bunkers that sit in ridge below and short of the green. Spoils from that operation and the new left bunker were used to increase the left to right tilt of the landing area as well as extend a helping/hurting ridge from that bunker to the green. If playing your shot on the ground, that contour will be a helping one. If flying it to the green and pulling it well left, it keeps you over that way. Green expansion has also added more holes closer to the rear MacKenzie mounds and the dangerous far right promontory. The hole has a decided angle to shape a shot now and should offer some very fun approach shots, especially for the short and medium-length hitters. 2. Hole 2 at Redlands Again I am just going to lump together the entirety of the works on this hole. The green is a very cool but very steep MacKenzie green with a dividing hump up in the middle and strong back-right to front-left tilt. There were two small areas where they could place a pin, even in summertime when they roll much more slowly. While I am usually hesitant to tear into Golden Age greens to "soften" them, I was on board with Todd's plan to rebuild it with the same overall ideas but increase both the size and the pinnable areas. Now, this is a process that is much more difficult compared to starting from scratch and building a new green. We had to strip the old top layer off while not disturbing too much of the original green. We then made our expansions and alterations carefully, checking grades and preserving general landforms along the way. The excess spoils went out to the front to make the transition smoother as well as the left to help build up the backside of the bunker. The overall result was successful in that the green still largely resembles its previous self while offering a whole lot more area where a hole can be placed, including one tucked behind the restored long skinny left greenside bunker. The green still has its "teeth" but is much more dynamic in how it plays. A new approach bunker was also added 50 yards short and right and guards the ideal angle into a left hole location for people playing the long par 4 as a 3-shot hole. The right greenside bunker, which didn't seem to originally exist (hard to tell exactly on the aerial. It was very small if anything, which is unlike California MacKenzie) was also removed and replaced with contouring. 3. Extended bunker on 6 at Santa Ana Some key tree removal early this year opened up the left side of the very short par 4 6th at Santa Ana. Architect Jay Blasi's intent was always for a player to think about taking on the left fairway bunker and running one up onto the green. For someone who predominantly hits a fade though, this was very difficult with the trees. That corridor is much more open now though. In doing that, it visually and functionally made sense to extend the bunker left to accommodate the new open-ness. Everything feels a lot better to this hole now, and going for it is much more tempting. 4. Bunker and natural area touch-ups at Orinda The grassing process for the bunkers at Orinda involved rolling the fescue turf all the way over the edge to the floor. In doing this, there is usually some excess as well a little bit of loss for the detailing. 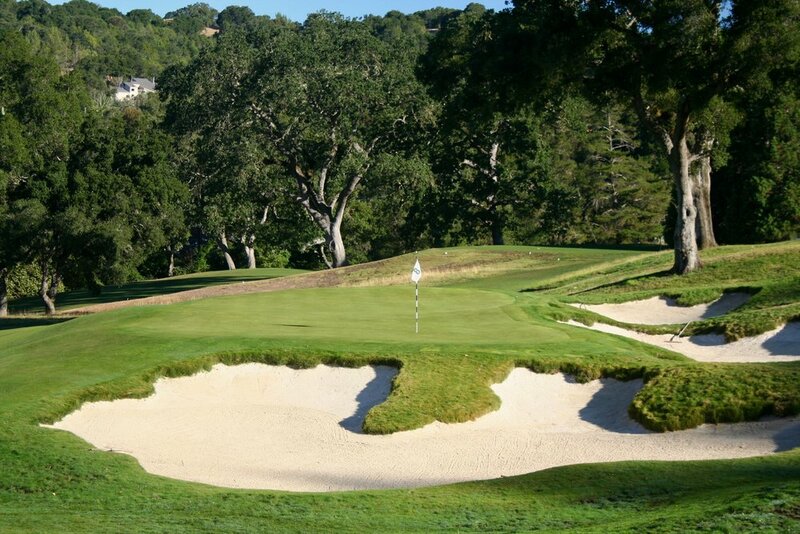 Because we were spending a lot more time locally this year, there were some opportunities to go back into a few of the most overgrown bunkers at Orinda and detail the edges. This is hard physical work, but the instant gratification of a fresh new edge greatly outweighs a few blisters and sore muscles. 5. Santa Ana Large Wash, Take II For various reasons, the drainage in the big restored sandy wash at Santa Ana did not work as well as hoped. A re-engineering project would solve that but also cause a lot of damage to almost everything in the interior. This operation was used as an opportunity to do a few things. One was extend the land bridge to give the shorter hitters a more feasible route to the second half of the par 5 15th hole. Another was to extend a different wash between 15 and 13 and create a new "don't go here" bunker for the long hitters bombing it to the second half of hole 15. Another opportunity yet was to improve the wash crossing path and get carts and players on 16 tee out of harm's way from trailing golfers on 15. The last and final opportunity was to improve the interior aesthetics of the wash itself, reshaping the islands and wash-ways to something with more 3-D definition and natural aesthetic. I've spent way more time in this area than I ever imagined, but I enjoyed the opportunity to work on mimicking a different type of landscape and enjoy the SoCal climate while doing so. 1. American Golfer Interview Rob Thomas is a prolific golf blogger and has had a number of great design interviews on his site. I was very excited to be one of them early this year. I enjoyed tackling questions about negative design trends, approaches to design, dream sites, and growing the game, among others. Read the full interview at American Golfer. 2. Leven Hole writeup for Geeked on Golf After getting back from Scotland, Jason Way of Geeked on Golf asked if I would be interested in contributing to a post about Charles Blair MacDonald's "Leven" template, which, of course I was interested. My task would be for covering the "inspiration" side, which is the current 16th hole at Lundin Links in southern Fife. Jon Cavalier (@linksgems) and his amazing photos and travels would cover the Macdonald and Raynor templates. It was a fun exercise and turned out pretty well. Go ahead and read it here. 3. Fried Egg Architecture Roundtable After reading these over the last year or so, it was exciting when Andy asked me to finally contribute. His questions were great, too, including thoughts on pro venues, rules, favorite holes, and what we wished the common golfer understood more about golf architecture. Check out the responses Parts 1 and 2 both here and here. 4. Fried Egg Podcast I had never done a podcast or live interview, but doing one with both Andy and Jay Blasi was a great way to get the feet wet. We discuss the "Dark Ages" of design as well as answer reader questions and participate in the infamous "overrated/underrated." Check it on The Fried Egg or iTunes (episode 56). 5. Design Opportunities They have come and gone in different forms, but the process has been great to build upon. Plus, we still have some potential opportunities in the works, which is very exciting. 1. The smoggy haze clearing one Saturday while working on the 3rd at Redlands, which sits high on a ridge with a beautiful view across to the San Bernardino Mountains. After a week or so of thick haze, all the details were visible this day, and somehow my music sounded better. 2. Evenings with open windows at Redlands, pick one. 3. Working in the peaceful mountain valley at Balsam Mountain with warm spring weather and the trees just starting to bud and flower. Mornings at Balsam Mountain were pleasant indeed. 4. Pleasant December weather in The O.C. working at Santa Ana. I had the surprising distinction of being named one of Matt Ginella's (Golf Channel's Architecture Correspondent) "Top Architects Under 40." I didn't realize it until getting a few texts and seeing others post it on instagram and twitter. It is very flattering and exciting to be mentioned among such talent, and I full-heartedly believe that we can do top quality work that can compare with some of the best. However, I have to take this time to acknowledge all those architects who I have worked with and learned from. Tom Doak, Todd Eckenrode, Jay Blasi, Frank Pont, Patrice Boissonnas, Mike McCartin, Forrest Richardson, and Mike DeVries have all been great in opportunities to contribute to their work as well as teach me about the business. I'd also like to shout out and acknowledge all the other talented young people who could have just as easily been on that list. It doesn't feel fair to name them, but there is a large crew of talented and motivated young designers and shapers out there that are doing very good work. I fully believe we are stronger together than individually, and I wish everyone success both now and in the future. 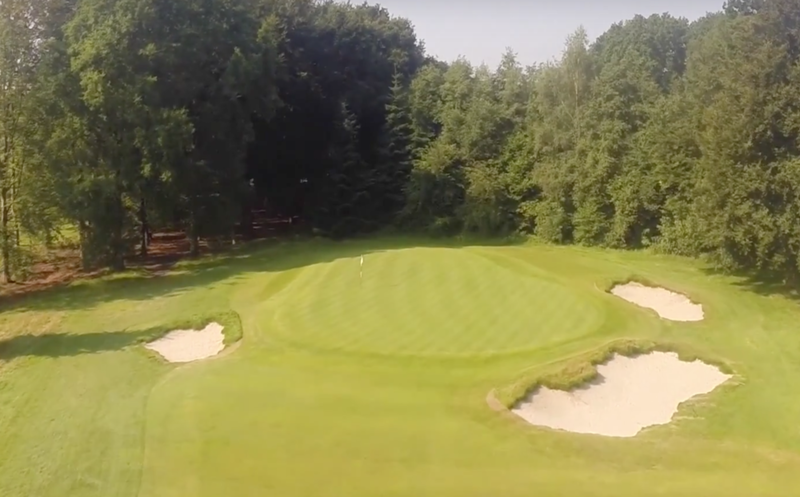 The 9th hole bunkering at Sallandsche looks much different from above. If you are like me at all, you like to check out the view of things above. For me, this is especially true of any golf course work I have done--bunkers in particular. 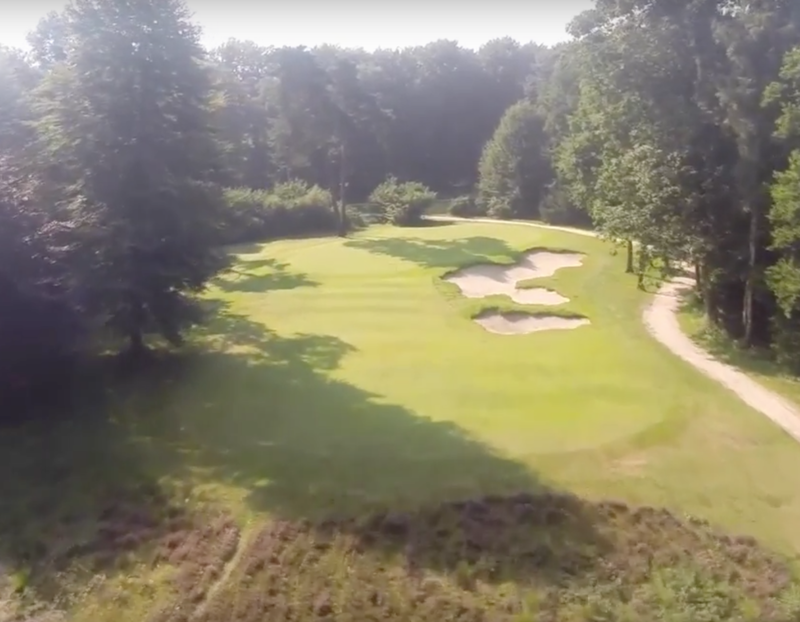 The golf club at Sallandsche, located in the east of the Netherlands and where local architect Frank Pont and I completed a bunker renovation 2 years ago, has added drone flyovers in its hole-by-hole section on its website (which you can find here, and, if you can read Dutch, navigate around for more). The direct youtube links can be found here, where other holes should automatically load or be found on the sidebar. They aren't HD quality, but they still give a good idea of the edge styling and overall form of the bunkers. Below is a series of some of my favorite holes and bunkering as seen from above. Click on the youtube videos to play the loop and the galleries to see larger still images. This medium-short par 3 has a visually pleasing set of imbalanced bunkering, but it also features the removal of "hold-up" mounding surrounding the back half section of the green, which is narrower, crowned and raised. It is a tough but fun hole location to take on, and it can be seen profiled against the dark shadowing in the earlier part of the video. 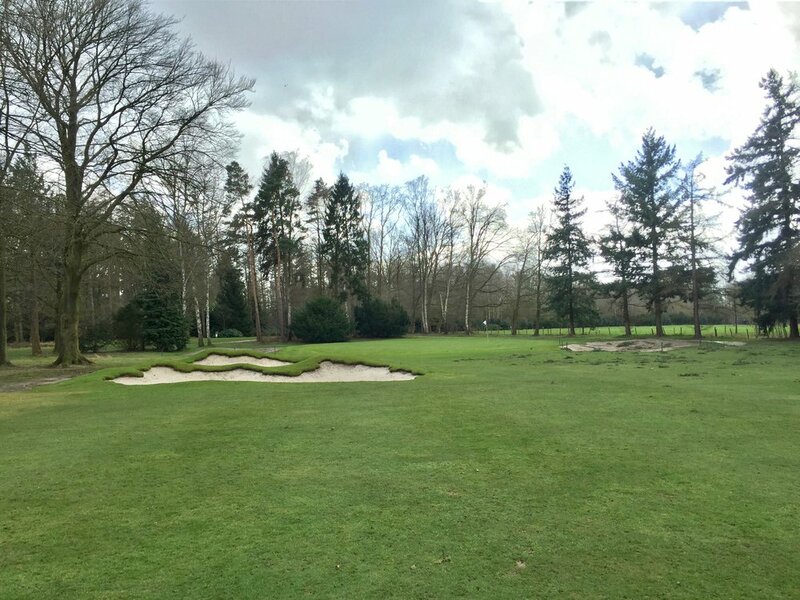 The 7th hole, seen in the images below, really gives a good idea of the offset of the bunkers. The hole is a short par 5, and the left bunker nicely guards the ideal angle into the right-to-left-sloped green. The 8th hole features one of my favorite bunkers from the project--the long greenside bunker guarding the right side. 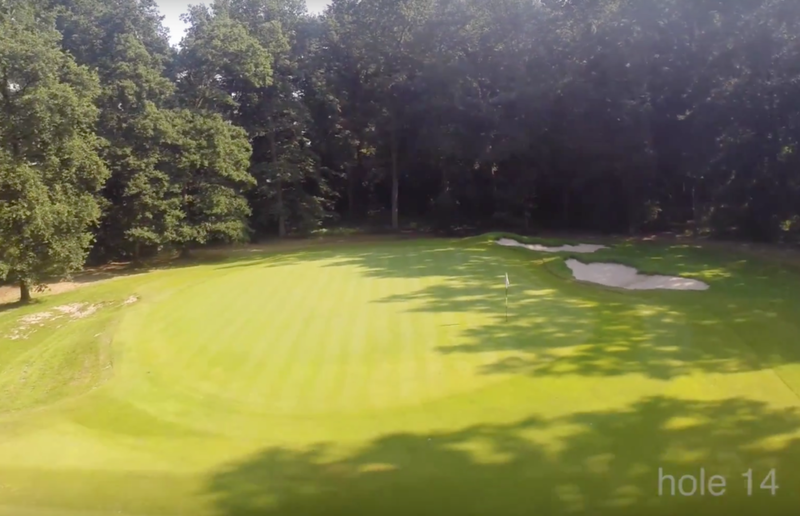 The true length and size of the bunker is not necessarily that apparent on the ground, but as the drone gets closer to it, that length starts to show itself. The 9th hole from the ground. Note the flag you see is a winter hole in the approach area; the green is behind and left of the bunkers. The 11th hole is similar to the 7th in that they are both par 5s and both have an angled bunker arrangement up near the green. The 11th is different though in that the pair of bunkers is out at in the approach instead of at the green. The pair looks like it is very close together (which is intentional and achieved in the field), but in actuality there is some spacing between them, which the drone footage shows. The first two bunkers near the 11th green relate strongly to each other and appear to be "stacked." Here you can actually see there is a decent amount of space between the two bunkers as well as see how the overall set is placed on an angle. The 12th hole has two outside bunkers guarding the ideal angle into the green, which is guarded by a greenside bunker on the right. These were created on perhaps the flattest hole on the course, but they turned out nicely, especially the one at the green. The greenside bunker on 13 is another favorite. On the ground it has many different looks as you move around it. From the air, is has a sort of reverse 'S' shape, which is what helps it look different from opposing angles on the ground. The 17th is one of the original holes on the golf course and the place where we started the project. The cross bunkers in the fairway are profiled low against the subtle ground, keeping view of the green and the greenside bunker. From the air, they take on a bit of a different look. Here are a few other ground level/drone comparison images that I liked. It's amazing how simple something can look in the air (see the first bunker on the 4th hole fairway, which looks like a potato from above) but look much more interesting on the ground, or vice-versa. This is why you can't just design in plan view--you have to shape and figure it out in the field. Click on the gallery below to check out some different comparisons. The ground level photos precede the drone captures. 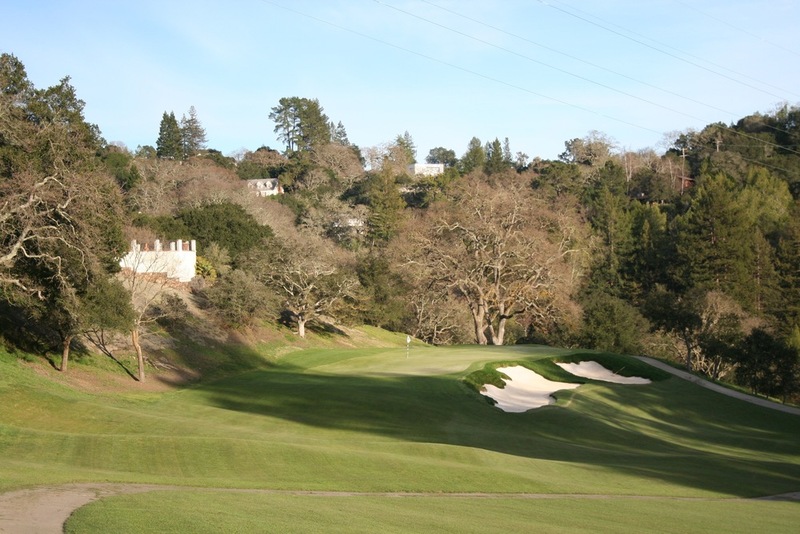 This is a two part series reviewing Hochstein Design's involvement with the restoration/renovation project at Orinda Country Club. Part I is a review of the construction and creative process during the project, while this part focuses more on just the visual changes. 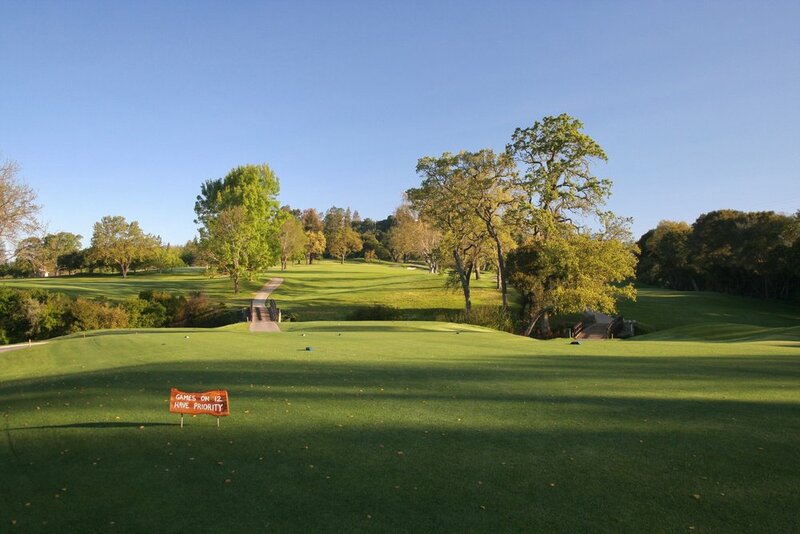 With simple design moves and an agronomic shift of philosophy (firmer, faster surfaces + more short grass everywhere), the golf course at Orinda Country Club has really transformed from a difficult, one-dimensional target test to a fun, dynamic round filled with different shot options and types. The construction and design processes were discussed in Part I. This second part though is all about comparing and contrasting the pre-construction state of the course to the new post-2016 version. These are a selection of favorite transformations shown in a series of before/after images. Enjoy! The first hole to highlight is the 2nd, a medium-short par 4 playing up a hill to a green that drops off on the right side and back. That dramatic effect was hidden though by containment mounding and a forest of trees behind the green. The trees were removed before starting "Project Watson," and the mounding was removed during it. As the dirt disappeared, wonderful views opened up, including a direct shot to the 4th hole green and bunkers across the deep bowl that separates the 2nd, 4th, and 11th. With the extra space, the green was expanded back and right to engage both the dropoffs and the front right greenside bunker. 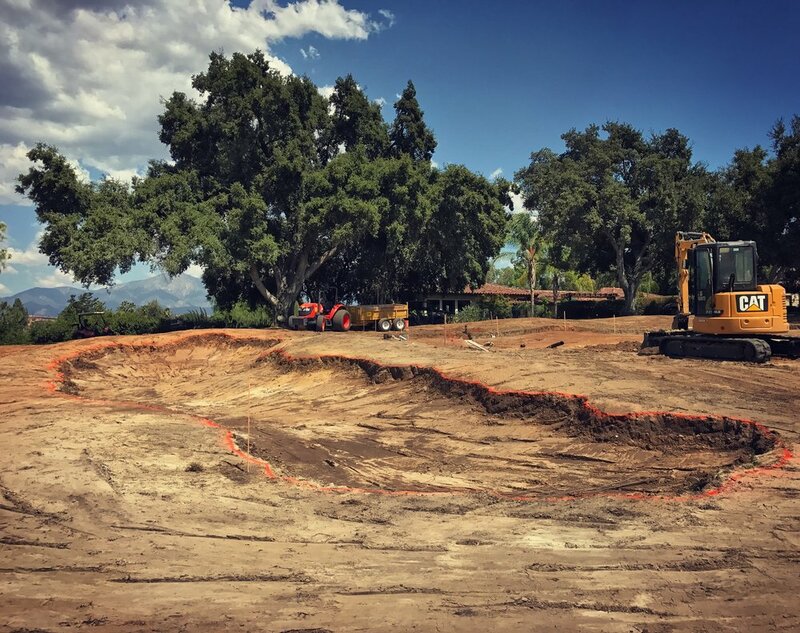 The overall space at the green has been transformed from that of an enclosed room to one with commanding views to the surrounding holes and a stronger connection to the gnarly old oaks nearby the green. It may be my favorite spot on the whole course. Tree and mound removal have not only cleaned up the nice view lines, they've made the green more interesting and opened up views to the 4th green and bunkers. Click the above gallery to see larger images of the 2nd hole before and after. The first three "before" images are courtesy of architect Todd Eckenrode. 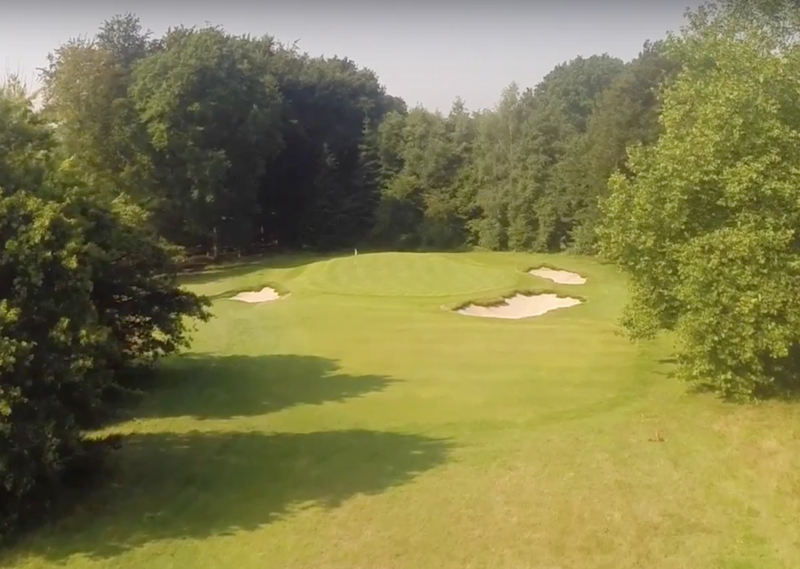 The 3rd hole is a long downhill par 3 where most everyone will be hitting a running shot into the green and trying to judge the speed correctly to get the ball to stop on the putting surface. Before, the strategy was simple: hit it straight between the two flanking bunkers. During the renovation though, the right bunker was removed, and two approach bunkers were added by Todd and George and set at an angle short of the hole. The best play now is either a draw around the set or a higher shot that just clears the first bunker, where the ball should bound and roll its way onto the putting surface. An enhanced bump on the right will either help or hurt you, depending how on-line your shot is. Also of note is the removal of trees on the right between the 3rd and 4th holes and the joining of the two fairways with mowed shortgrass. The look is pleasantly open and more in line with the original landscape of the course. Above is a sampling of before-afters of the 3rd hole. Click to enlarge the images. Superintendent Josh Smith referred to these as "disoriented Pac Man bunkers." 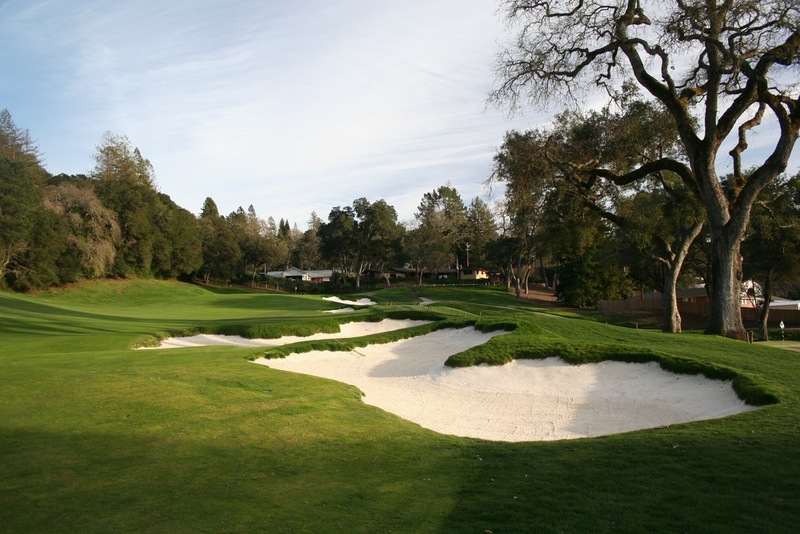 The new bunker style is much more complementary to the course and Northern California golf in general. This was a rare case where I knew what I wanted the bunkers to look like well before the project even started. I called "shotgun" on getting to work on this hole, and thankfully my request was granted. Above: some more images of the changes on the 4th. In addition to the bunkers, the left side green tie-in was reworked, and the left landing area for layups in the fairway was reshaped to be more receptive. Before, everything kicked down into the deep right bowl. The 7th hole had one of the more penal and "80s-looking" bunker arrangements before, with a stack of 3 similarly sized traps guarding the right side of the fairway. The slope of the hole is strong from left to right, and many shots would kick into one of these bunkers. What we did to add some space and variety is pinch the first two closer together and push the first one further out right, then move the 3rd one up to the next ridge and keep it smaller. There is now some more space for the tee shot, and the overall arrangement is much less repetitious in appearance. Above: The bunkers at the tough short 7th were reworked to open up more room in the steep left to right fairway. The first was rotated 90 degrees, gaining about 8 yards of width, and the third was shrunken and shifted about 30 yards forward to the next ridge. 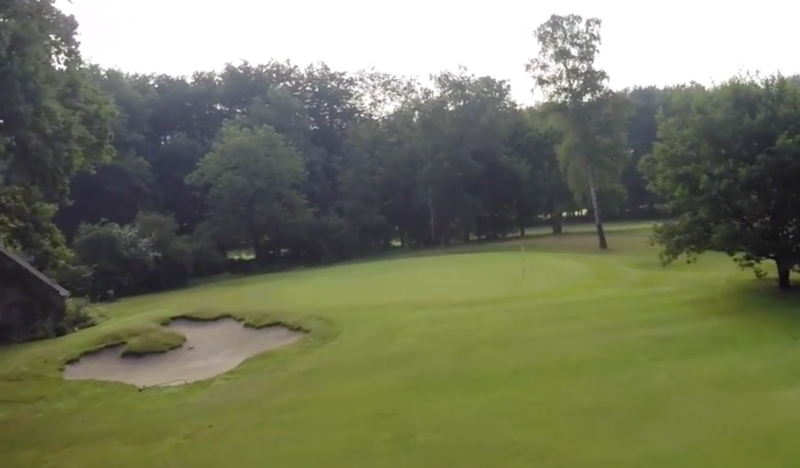 The 8th hole is one of the most worthy of highlighting. This short drop shot par 3 is a terrifying menace and one of my favorites anywhere. It is also an example showing that subtle changes can have a big impact on the quality of a hole, even when it is already great. Watson's excellent short 8th was still excellent, but there were no doubts restoration and redwood removal would make it that much better. The 8th following tree removal, bunker restoration, short grass addition, and a rebuilding and expansion of the green. 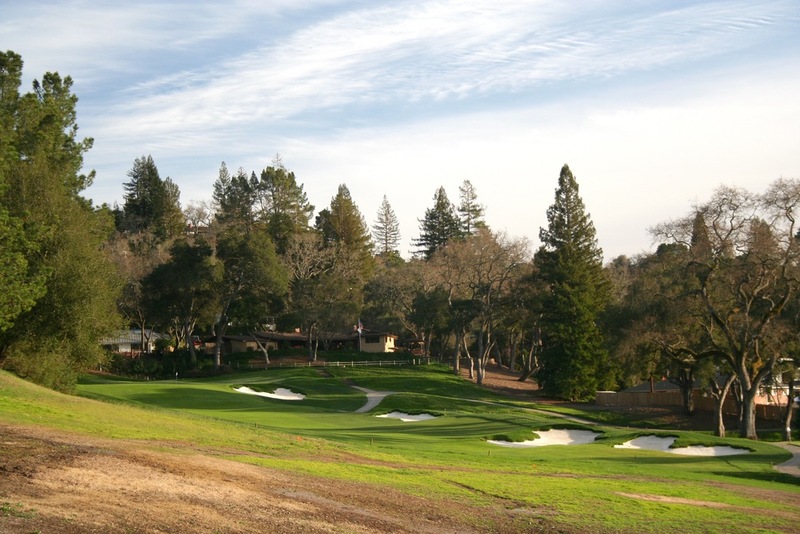 A look at the 8th hole historically, pre-restoration, and post-restoration. Looking above, one can see how the hole had evolved over time. The bunkers changed character, new ones popped up in the left and back, the green shrunk and changed size, and redwoods were planted, blocking airflow, sunlight, and the view to the hills across the way. The first task was amending these items to get it back to how Watson had first designed it. The second task was reworking the green, as sand buildup on the right had made it too steep and fast for recovery shots from the bunkers on the right. We were very careful to not lose the character of the green and only enhance what was there. In doing so, we refined the wings on the left and right, added slight internal contour, and expanded the size out to the limits of the pad on which it sits. The results are a green that is now playable from the right bunkers, but it also requires a more exacting tee shot placing a premium not just on accuracy but also on distance control, even if you miss to the left or the right, due to the flanking internal bumps that can be seen in the gallery below. The 9th hole is a great, long roller coaster ride of a hole with a spectacular backdrop of the distant hills. The changes here were simply adding sand cap to the left and front, expanding the green in the back left bowl, and reworking the right side bunkers, which was the most visual of the changes. We grew to love the funky, suspension bridge-like horizon mounding at the back of the green and made sure to protect it during reconstruction. The 9th hole bunkers, which were added in later years, were previously stacked on each other in a linear fashion. Note at the time of taking this photo the left and back horizon of the green was already mowed short by Josh Smith. Previously, it was mowed rough all the way around the green. The new arrangement wraps around the green a bit more, has a sense of motion, and is more visually appropriate with the overall scale. The 10th hole is a cool short par 4 with a tiny green jammed next to the creek at its terminus. I've always enjoyed the juxtaposition of the small greensite with the giant redwoods adjacent to it. The previous version green was problematic though, partly due to its size causing higher traffic wear, especially with the lower sunlight received due to the redwoods. It also didn't really surface drain, and the right hand bunker, in conjunction with overhanging branches, made approach shots from the right side of the fairway just about impossible. George Waters did a nice job reshaping this green, bringing its overall elevation up to the fence level to create surface drainage and making the size much larger, which creates more day to day variety while helping out agronomically. By bringing the green further forward and right, expanding the front left bunker, and keeping the right/backside pot bunker, a shot from the left of the fairway has gotten a lot more demanding as you have to get the ball to land softly between the two hazards. The right front bunker has also been removed, and a shot from the far right can now find the green even if the old oaks are playing a factor. The 12th hole was another of the total greens rebuilds. The proximity of the old green to the 3rd was bothersome as long shots from both holes often ended up on the other one. Shifting the green forward changed this hole from a short par 5 to a testing par 4. We didn't know exactly what we would build when starting, but we came up with something that involved a lot of interesting contouring, which worked well with Todd emphasizing keeping the hole as long as possible. In the end there was no need for a bunker as the shaping and length made for a strong and fun enough challenge. The 12th was once a short par 5 playing over a dip to a fill pad. This green was constructed in more modern times. Now a long par 4, attacking the bunkerless green complex with a running shot is a fun exercise. Play it off the left kicker but don't veer too far to the big dropoff. A safe bailout right leaves a tricky up and down over the right side contours, which, if you are on line with your approach, will help you stay on the green. They are both "helping" and "hurting" contours. Click the gallery above for a closer look of the contouring surrounding the 12th green. Let's also take a look at the transformation that took place at the 12th tees, which were joined with the 2nd tees and the 11th greenside area to create one big communal space of short grass. 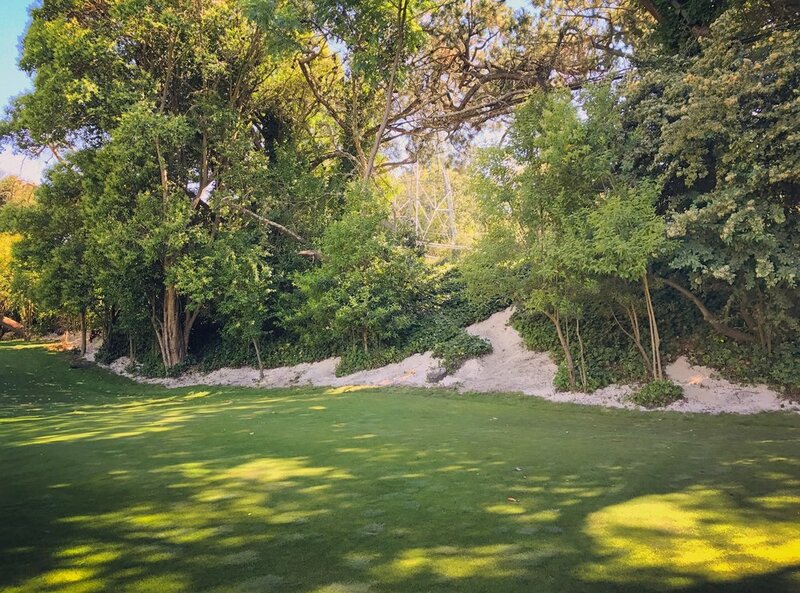 The hedge seen in the before pictures was a "protective barrier" at the back of the 2nd tees. The 13th hole didn't involve any greens changes outside of a small expansion on the back right, but it is one of the biggest strategic transformations from the project. The previous bunker arrangement was visually attractive, but it and the small sloped front opening made it necessary to fly the ball on the green, which isn't a shot that everyone has in their game for a longer par 3. 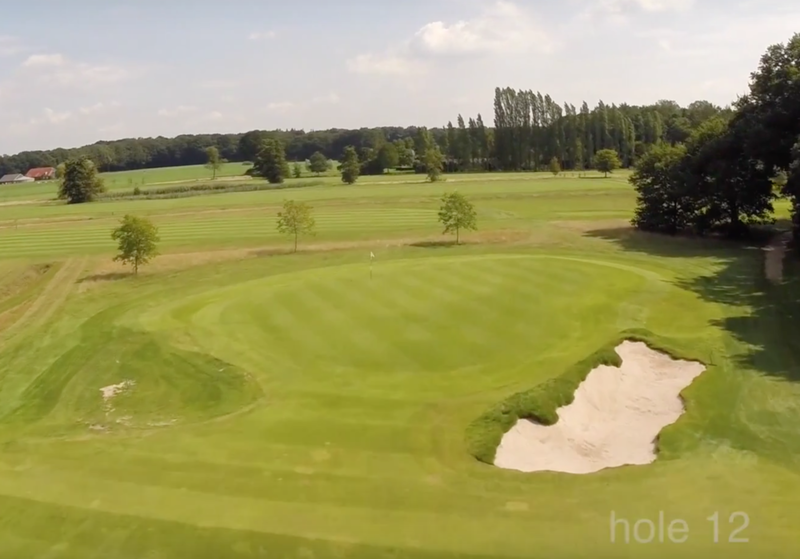 Our thought was to try and get back closer to a version of the hole from an old aerial that showed the green with a back and fronting bunker but an open left side, which is strongly sloped and would presumably allow a running shot to curl onto the putting surface. After observing shots being played by all skill levels and strengths this past fall while working on the 14th hole alternate tee, I am happy to say that anyone can now reach this green, whether they fly it on and stick it or scoot it along the ground high on the left side until the ball tumbles down to the green. Even if you tried slotting a shot through the opening, it was likely to kick right and into the bunker. Not only is the right side open for an indirect path to the hole, the opening on the right has been made friendlier to reduce shots that kick into the bunker. A lot of work also took place at the tees, as one can see in the two top images. Clutter in the form of trees, fences, retaining walls, and excess cart path was all removed as the tees from 13 and 4 were joined together in the same complex. Reshaping also added visibility to the green, which was mostly blind before from the back tees. This is fantastic work overall by Eckenrode and the contracting team at Earth Sculptures. Above: the new 13th hole, the inspiration aerial, and a field sketch of what we decided on building. The 14th hole wasn't a major change. The old bunkers all stayed in the same place but were visually enhanced; a small bunker on the corner of the canyon was also added to boost visual interest. The green also experienced a little tweak, with sand splash getting reduced on the lower left side of the green. Doing this in conjunction with raising the back part of the left bunker created an effect of having that corner of the green look like it was sticking out into the bunker. That is an effect one can find on a lot of Golden Age designs, and we were happy to introduce it here at this 1924 course. 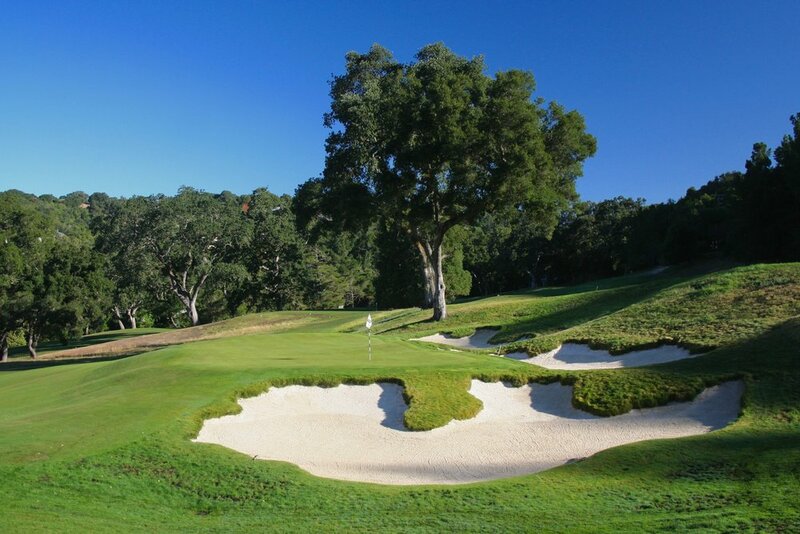 The 15th at Orinda is somewhat famous for its appearance in Robert Hunter's excellent golf architecture book The Links. Over the years though, it's true character had been lost with the introduction and expansion of a bunker on the creek side, which greatly reduced the size of the green and put a buffer of sorts in place of a "do-or-die" edge where green meets the steep creek bank. It became a big priority to restore this hole to it's original rustic and dramatic glory. The bunker was filled in, the green massively expanded, the creek bank restored, the bump on the right side enhanced, and the left side naturalized with fence removal and vegetation clearing. The pre-project version of the 15th is seen above. The after result of the 15th hole restoration. Extra work and time was spent to really get the creek bank the proper form and location. Also, the flag in this location would have been right about on the bunker edge. Click above for a mix of before and after images of the 15th's transformation back to its original William Watson form. The 16th hole was very symmetrical in its previous version. Bunkers sat across from each other at both the green and the fairway. George Waters and Todd Eckenrode came up with a great idea in the field though to flip the right fairway bunker over to the left and create a visual string of bunkers over on that side while leaving the right open. The new aesthetic feels much better, especially with the tree removal between the 16th and 17th fairways. The left greenside bunker was also shifted to about 10 yards short of the green, allowing a chance for a run up shot it you can clear the top edge. 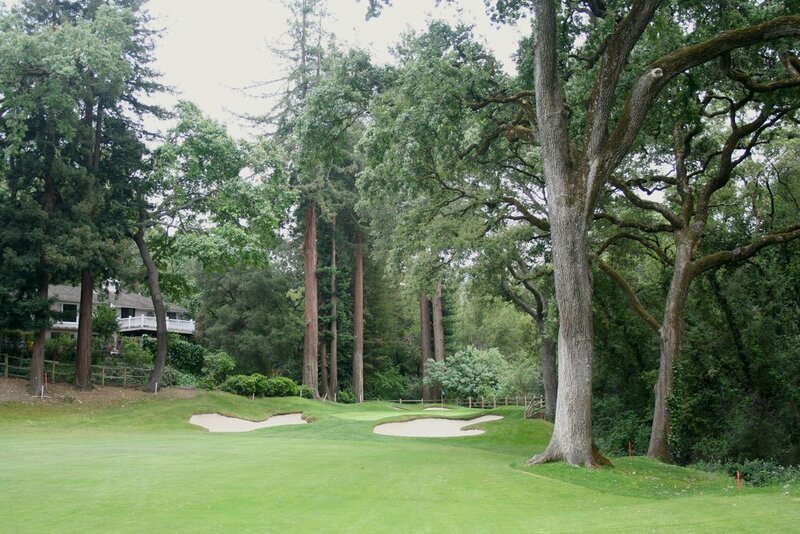 There were once even more trees separating the 16th and 17th fairways. Originally, there was one big treeless playing surface joining the two holes. The string of bunkers on the left is actually quite spaced out; it was a fun challenge to get them to all visually line up. The 18th hole rivals the 12th hole for most extensive change and amount of construction work. It was also the place where we started the whole project. The issue was the green; it was way too consistently steep with slopes of about 6-7% all the way from back to front. It was also artificially built up as a pad on top of what was actually a very nice natural landform. The first move would be to push that pad out to the left side, where the spoils could be used to soften that slope and help stop balls from rolling all the way down to the cartpath there. With the severe overall slope that still existed even after lowering the back of the green and shifting it forward to the dropoff edge, there was a need to break up the green into shelves or tiers if there were to be locations flat enough to put holes. We tend to despise formal tiers and prefer something that looks more natural, so an effort was made to create something more flowing and varied while still working functionally. 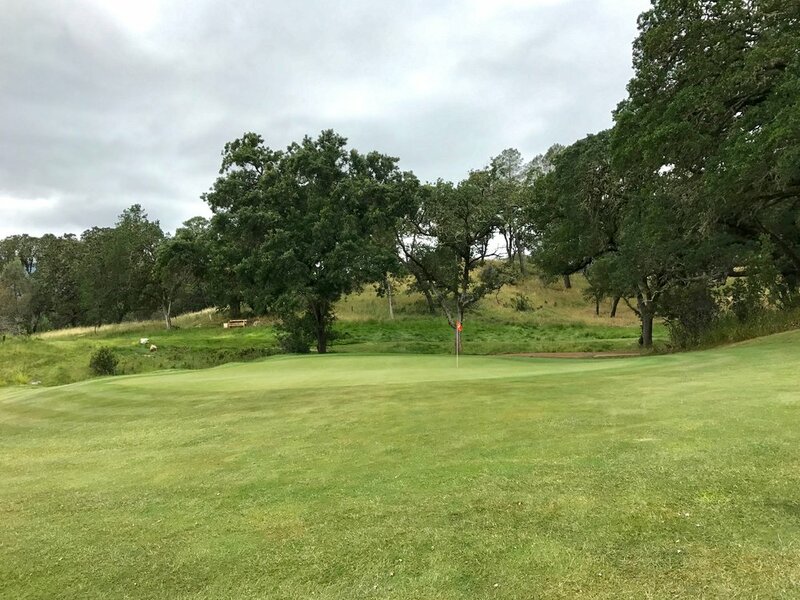 The result is something different from most of the other greens at Orinda, which are flatter internally, and one that would certainly get some attention and perhaps be a bit controversial. Very careful detail was made though to make the 3 main pin-able zones receptive, all of them having multiple ways of access if willing to play well off line. Getting to the proper zone on the approach can be done by flying it into that area or taking your chances on the right and/or rear kicker slopes, which requires more control as one can end up on any spot on the green, including the front left section (which is really neat because a shorter hitter who couldn't otherwise get it to this area now has a chance to do so by curling it around the outside of the green). A pair of bunkers were also added and made to have the appearance of tumbling down the hill. The left one tends to be more of a shot saver, but the right one well short of the green really messes with layups and long shots into the green. It is located right where you would want to leave a layup shot, and the best landing spot for a long shot is just right and beyond it. As a tradeoff for this additional challenge, the drainage ditch on the right was covered over, the out of bounds line shifted further out, and short grass added. The overall result is a fun finishing hole worthy of its dramatic setting. Mowed rough used to surround the steep, bunkerless green. The top images here are before, and the bottom are after. The above gallery shows some before images mixed in with the after images. Images 1 and 9 are courtesy of Todd Eckenrode. 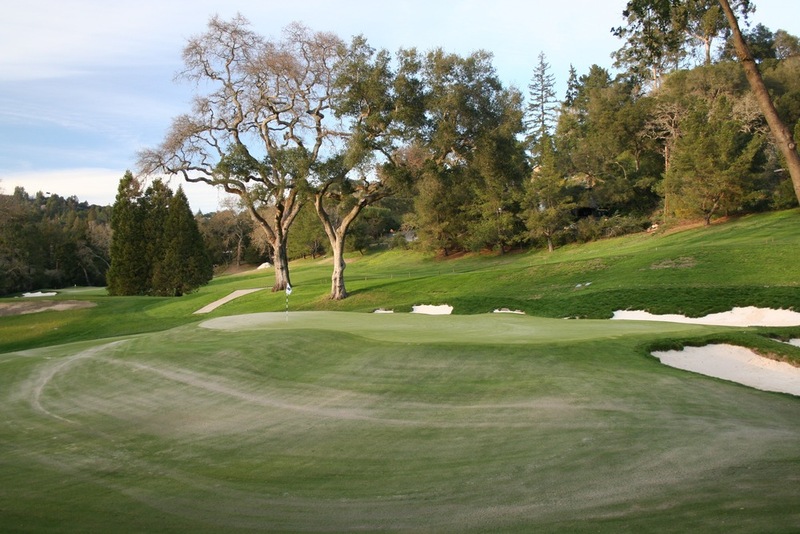 We hope you enjoyed this photo tour of Orinda Country Club's recent transformation. Thank you for reading and checking out the site! As story after story broke in 2016, there was a good chance I was working somewhere in and about this large restored wash at Santa Ana CC. For society, 2016 will likely go down in infamy. We all felt the impact of horrible and senseless acts of terror, a growing distrust toward our law enforcement, the most controversial and polarizing election of our time, and an incredible loss of talent and influence, including Muhammed Ali, Prince, Gordie Howe, and our Game's own chief ambassador, Arnold Palmer. It is an important time to reflect and realize that no matter how frustrating certain things can be out on a project or while searching for new work, we as golf architects and builders are incredibly lucky to be safe and do what we do for a living. With that said, let's take a look and celebrate the highlights of 2016 as experienced by Hochstein Design. This is what it's really all about--building and working on golf courses to make them more fun and interesting for all who play them. This year involved 4 locations/projects, two of which are familiar to last year, Hardelot (Les Pins) and Orinda. Hardelot was a continuation of the winter work program, which for us involved tweaking greens tie-ins and bunker edges. 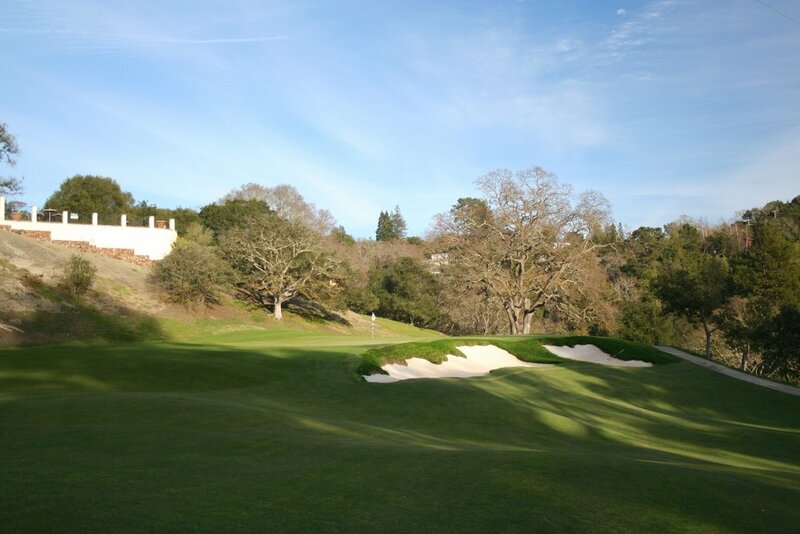 Orinda was simply some bonus work this fall, building a new alternate tee on 14 that straightens out the dogleg and gives a teasing view of the flagstick. The big project of the year though was down in Southern California at Santa Ana CC, where fellow Bay Area architect Jay Blasi set about completely re-envisioning the golf course with an entirely new routing, new greens and bunkers, new practice facility, and new feel. With an incredibly tight project schedule for the scope of work, my job was largely to keep the excavator moving and work in the bunkers and dry washes. In the effort to return the course to a more dry look that typifies the natural state of Southern California, there were plenty of bunkers and washes in which to keep busy. It was a fun experience to do something new like the washes, and I am looking forward to seeing how the "natural" elements of the course evolve. 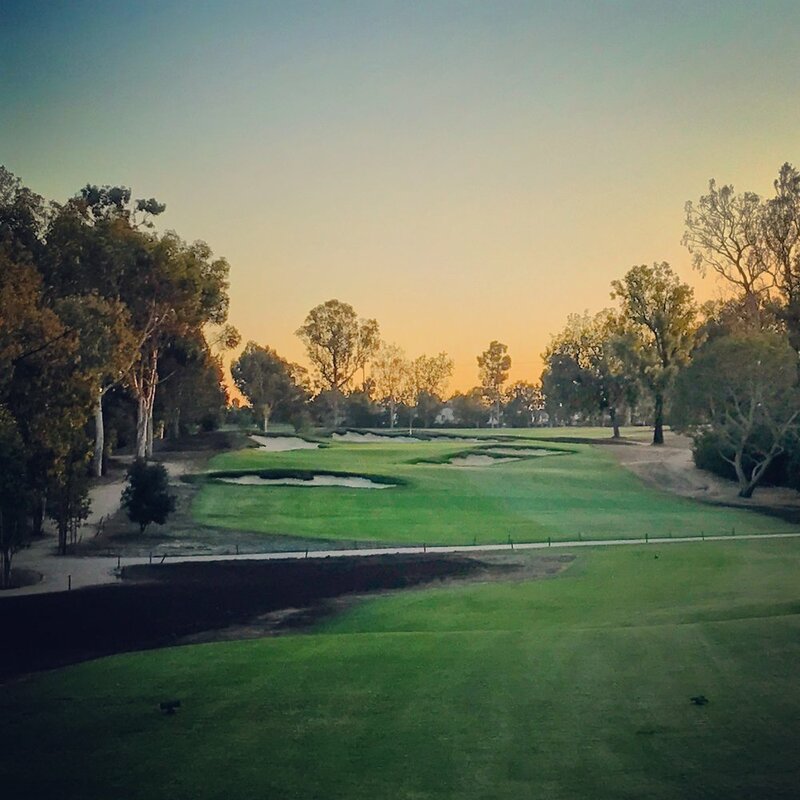 The fourth project was the beginning of a long term restoration/renovation at the Alister MacKenzie designed Redlands CC led by architect Todd Eckenrode. We began with a first phase consisting of work to the greens and bunkers on the adjoining 1st and 4th holes. Bunkers were rebuilt, moved, or added, and the greens were extended and reworked in critical spots, adding more hole locations and interest. It was a nice beginning to some pretty fun work. How could it not be fun when you get to try and emulate Dr. MacKenzie? The bunker-like ridge in the foreground was entirely fabricated. 1. The sandy waste on the par 3 17th at Hardelot (Les Pins) I've always loved playing in the sand, and Hardelot has it absolutely everywhere when you scrape away the organic layer. This area between the tee and green was exposed by architects Frank Pont and Patrice Boissonnas in their recent restoration work a few years ago. With it was left a big sort of eroded face at the edge where the turf for the approach area meets the sand. This edge and look would be lost in our work though as we expanded and softened the approach area. So, why not kill two birds with one stone and use the chunked-out scrap turf from the approach to build up something new in the foreground that may reclaim that look? That's just what happened, and now a pseudo-bunker sits well in view in the foreground, ready to evolve, grow, and erode over time. 2. The created dry washes on the 2nd/7th/8th Holes at Santa Ana CC This was my first time building a feature like this, and it seemed like a fun challenge despite only having limited observations of the Southwestern landscape. Kye Goalby did a great job setting up the first parts of both washes, using the bulldozer to make hard smooth cuts that mimicked rushing water blasting through the landforms. I too used the dozer to set up the unworked parts on hole 8, but most of the work was excavator detailing. Edges were left deep and steep to mimic a big water cut, and loose material was used to mimic the walls crumbling and collapsing over time. With plant growth and sporadic rain water events, these features should evolve nicely and look like something that was naturally created. 3. The bunker arrangement on the 1st Hole at Redlands CC The arrangement architect Todd Eckenrode and I decided upon focused on the green's angle that runs right to left. The front left bunker was the first one to be re-worked. A back bunker was then added to profile against the front one, and it was built up in the back to shed away water and help stop any trickling balls from the 4th hole. A fairway bunker out on the right was added to guard the ideal approach angle into the green, and a smaller bunker further down and left in the fairway was put in to make longer hitters a little more careful with their tee shots. 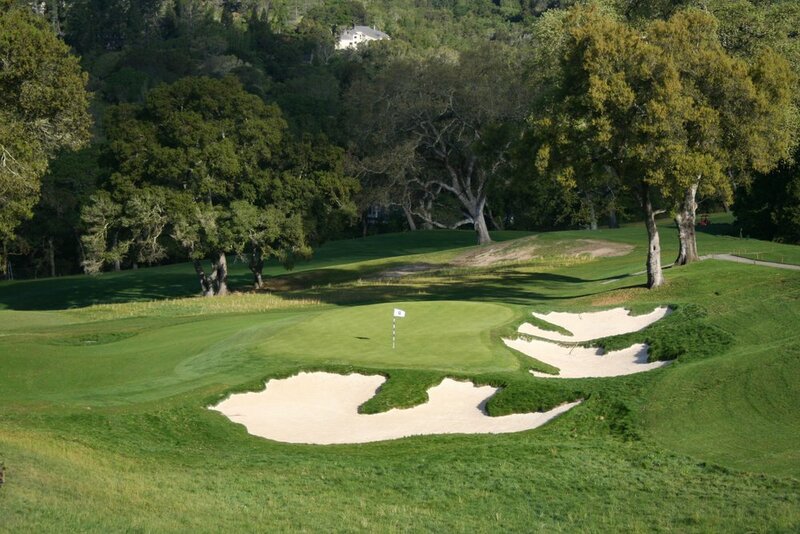 Best of all, this is a MacKenzie course, so we were free to emulate his artistic California style of bunkering. 4. 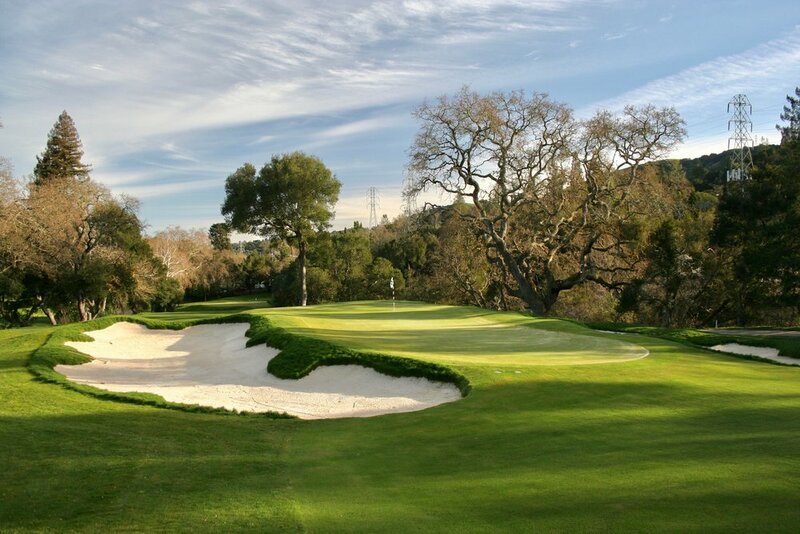 Hole 17 bunkers, Santa Ana CC The shortest hole on the course is a sideways, slightly angled double plateau. With a propped up right plateau angling slightly at the tee, this seemed like an opportunity to create a wraparound bunker and really set off the plateau. A center bunker to the left of it rises up and obscures a part of the trough and further adds discomfort to the tee shot. A back bunker makes going long a bad idea while rising up to connect to a screening berm. And finally, a left bunker trails out to the left to both hide 18 tees and balance out the whole composition. 5. Hole 11 bunkers and dry wash, Santa Ana CC Sometimes, bunkers just come together and interact with each other nicely. That was the case on the second half of the par 5 11th at Santa Ana, which finishes alongside the large restored sandy wash on the east side of the property. The bunkers all seem to zig-zag off of each other when looked at down the fairway. That view is not the only one that mattered, though, because with tree removal, all eyes tend to funnel down to this part of the property and the distant Saddleback Mountain in the backdrop. Making sure the bunkers looked right was important from distances and angles as far away as the clubhouse. One way to do this and get the scale right was to add an extra little bunker next to the right fairway bunker that wasn't visible on 11 but was from everywhere else. To tie the bunkers into the wash better and stand less alone as bunkers, I chose this one (and another on 15) to have a missing bottom lip and bleed sand out into the wash. Hopefully the effect works as the wash matures and evolves. 6. Hole 6 bunkers, Santa Ana CC This short par 4 to an uphill green called for heavy fortification with a big rear bunker, a left bunker, a front right bunker, and two diagonal bunkers shorter in the approach. Following a grade set by the next tee and the overall arrangement of the bunkers, the idea became to lead the eye from left to right by making the whole arrangement seem to come to a point at the shallow right side of the green, which is blind from the right landing area. The set works nicely together while also messing with a golfer's depth perception and comfort level. 7. Green surrounds and approach area, Hole 17 Hardelot (Les Pins) The 17th hole is one of my favorite spots on the course. With the aforementioned sand-scape, vista across the back nine, and isolation from surrounding housing, it is a most pleasant spot to play and work. The work we did to the right side and front approach area was all meant to add turf and playability both for recovery shots and running tee shots onto the green, which is still very hard to do but is now much more doable and forgiving. 8. Green Extension on the 4th Hole at Redlands This green sits at the terminus of a long spine with big fall-offs to both sides. It was already terrifying for the approach shot, but with tree removal and green extension, it is more exposed and frightening. Really though, it is more playable as a kicker slope on the left has been reduced, the green has gotten bigger, and bunkers right and left have been expanded to help catch shots just off line. 9. Bunker doctoring, Hardelot (Les Pins) With some bonus time I had left during my stint at Hardelot, my assignment shifted to editing a few bunkers that seemed like outliers to the rest of the course's style, particularly the ones where edges were revetted with sods as opposed to cut out of native ground. A couple like the 1st hole approach bunker and the set of foreground bunkers on 12 required some excavator cutting, but a majority of the edits required a good ole rake and shovel. I would be pretty sore doing this type of work full time, but I love to do it every so often, especially on a great piece of ground with Tom Simpson bunkers. 10. New alternate tee, Hole 14 Orinda CC It's always nice to work close to home, and it is even nicer to work at a place with familiar friendly faces. It is even nicer yet to work on a spot where you can also look out over a hole you helped redesign and rebuild the previous year and see if people are playing it the intended way. 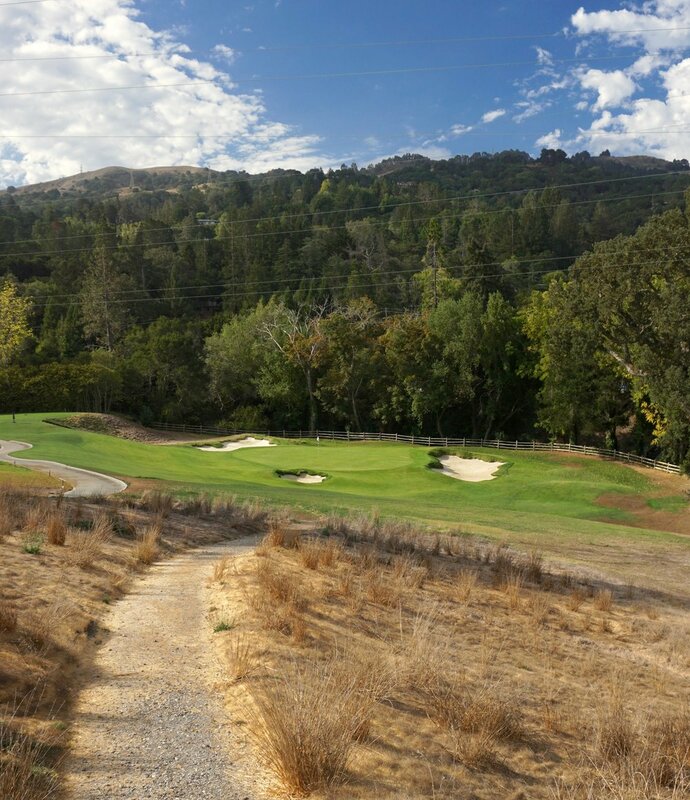 The new alternate tee on the 14th at Orinda sits higher up the hill and way left of the original tee. It is now an enticing, nearly-straight shot to the green with the left fairway bunker much more in vision and in play. I would imagine more people will try going for the narrow little green now, but I personally wouldn't recommend it myself!